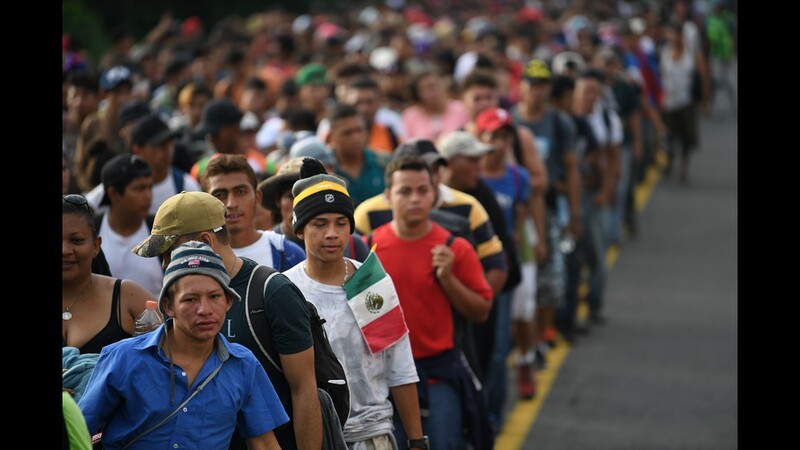 President Trump calls caravan immigrants 'stone cold criminals.' 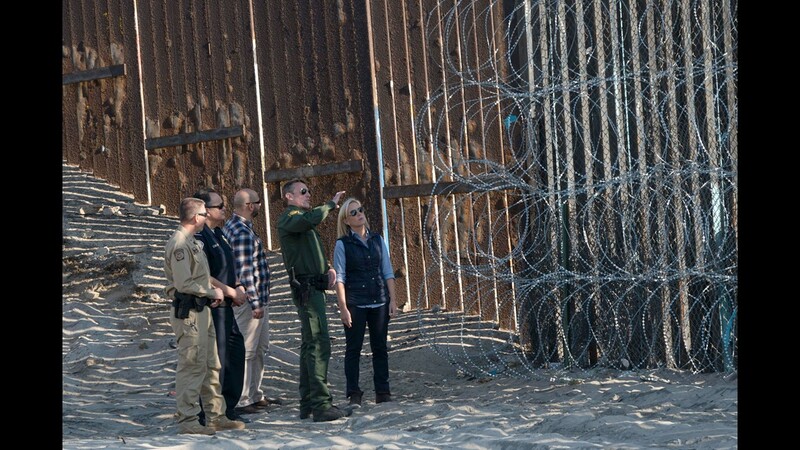 Here's what we know. 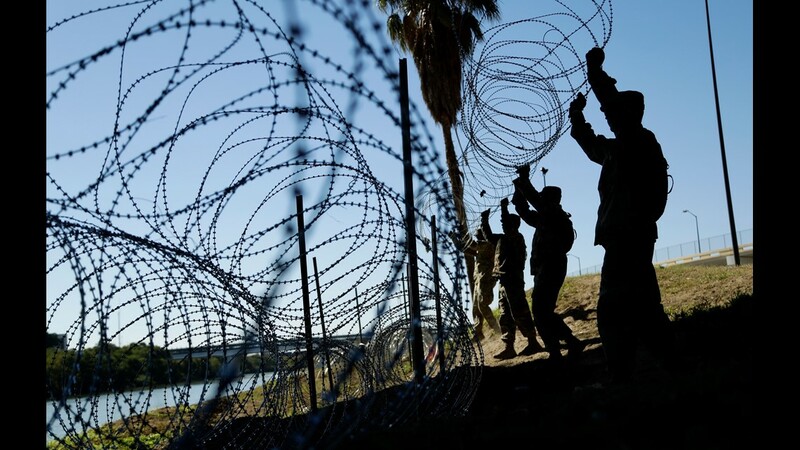 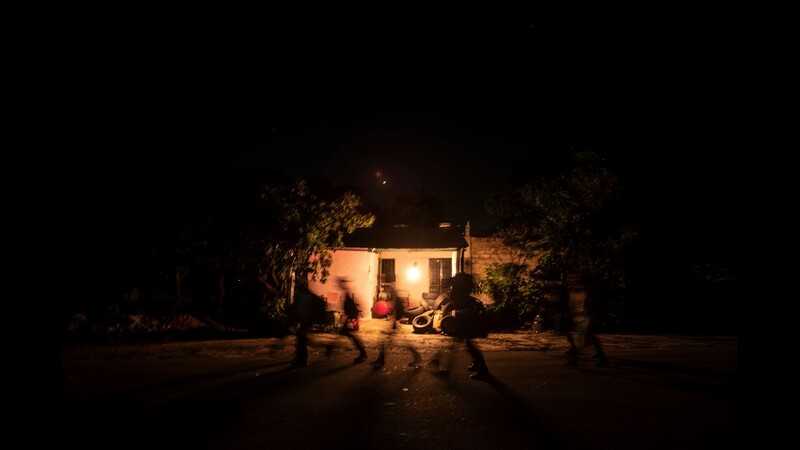 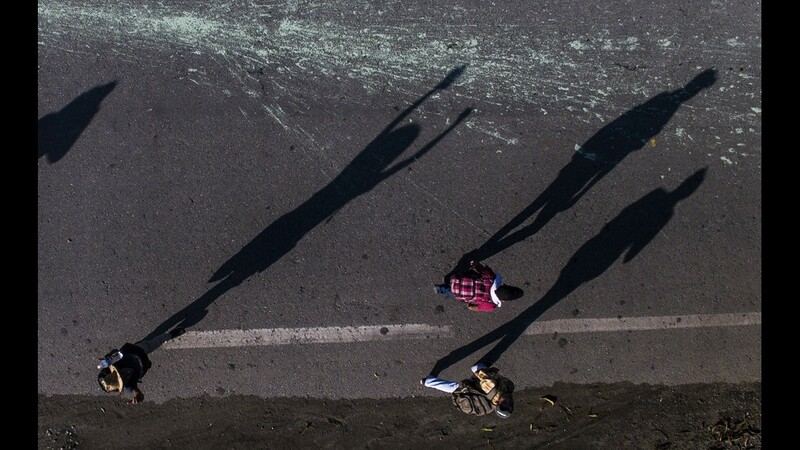 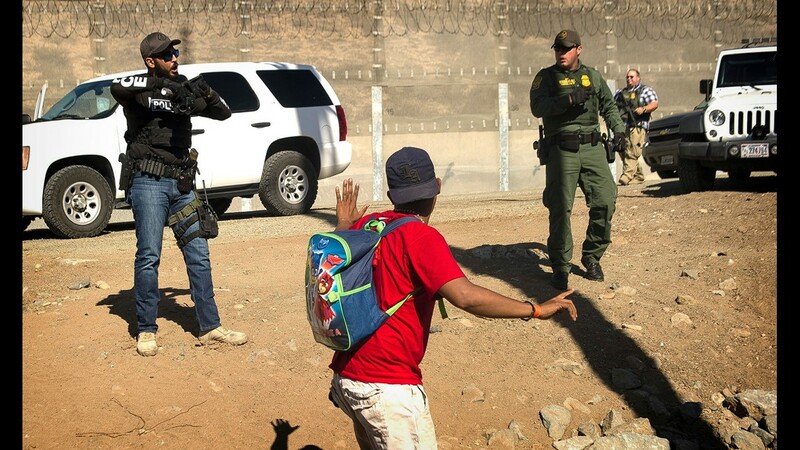 What's happening at the US-Mexico border? 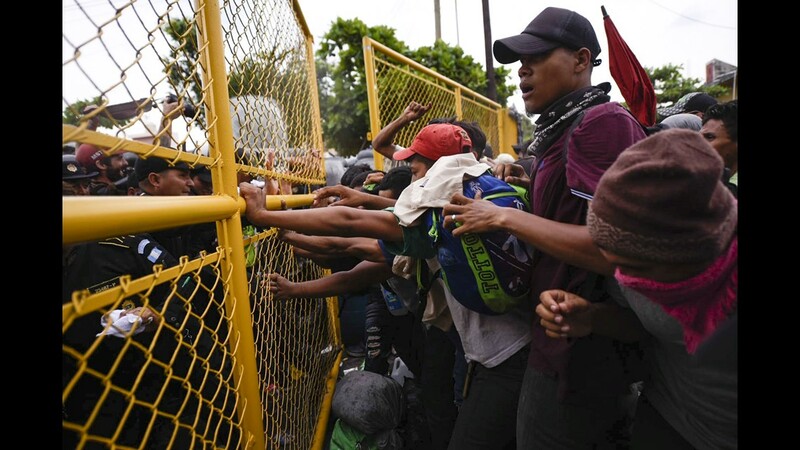 President Donald Trump continued his attacks against a caravan of Central American immigrants Monday, describing some of them as "stone cold criminals," but his administration provided scant details to back up the president's assertion. 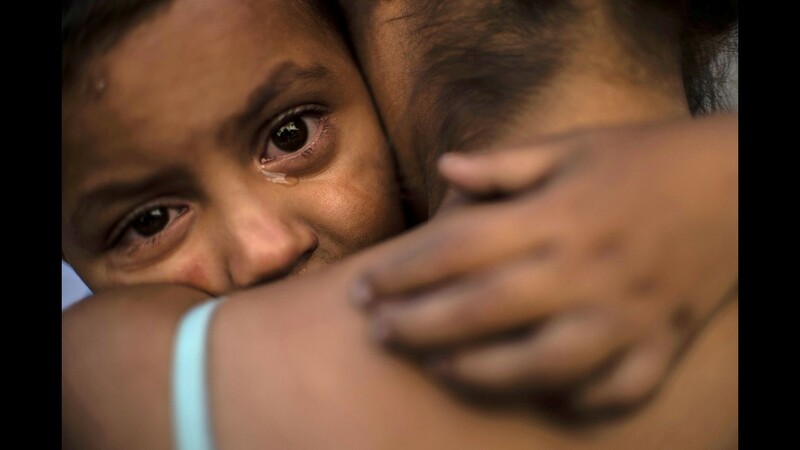 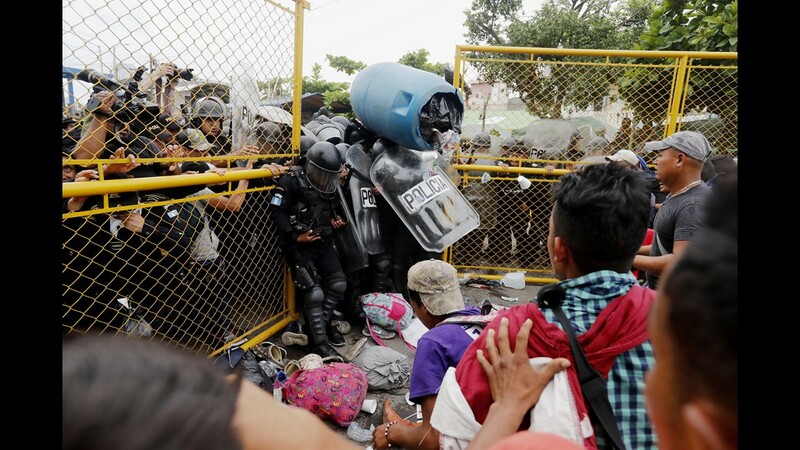 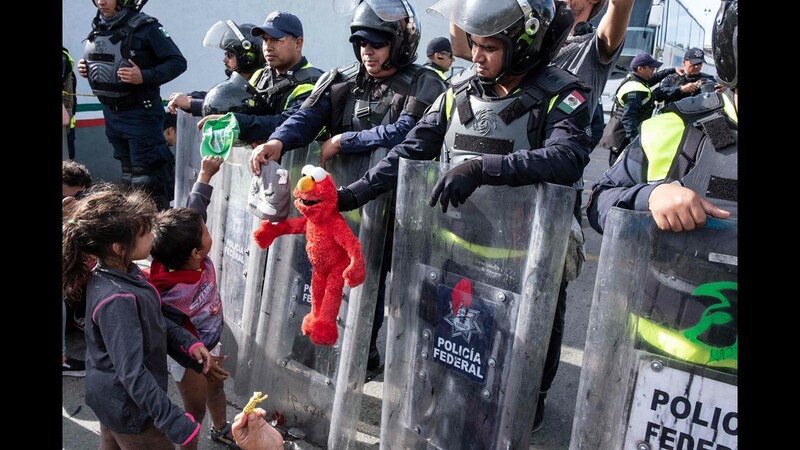 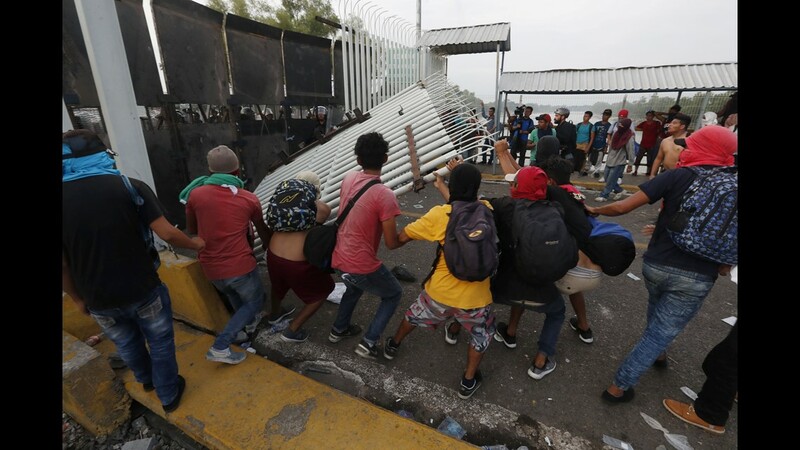 Trump's attempts to portray members of the caravan as criminals capped off a chaotic weekend that saw immigrants rushing the San Ysidro Port of Entry and U.S. agents responding by firing tear gas into the crowd, leaving a tense standoff that could escalate in the days to come. 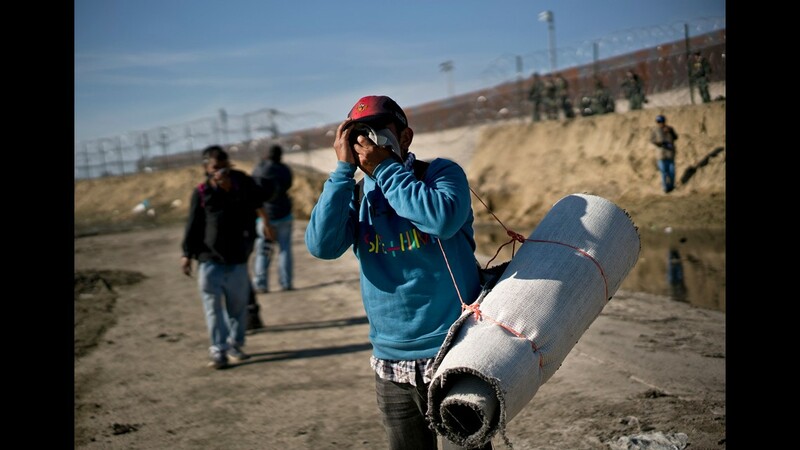 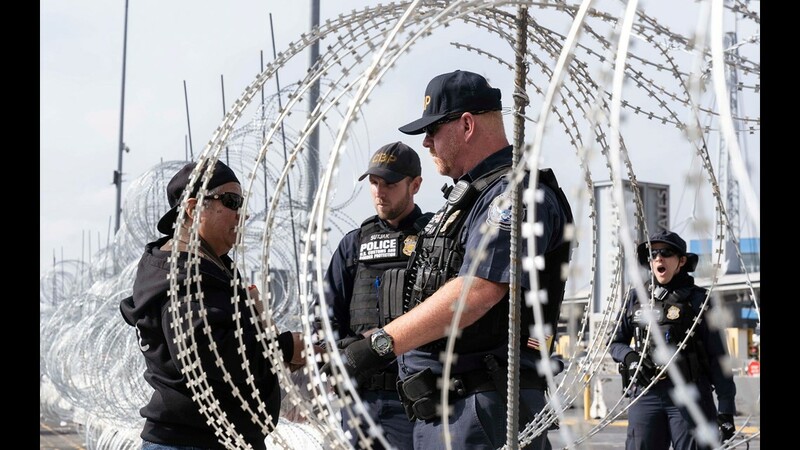 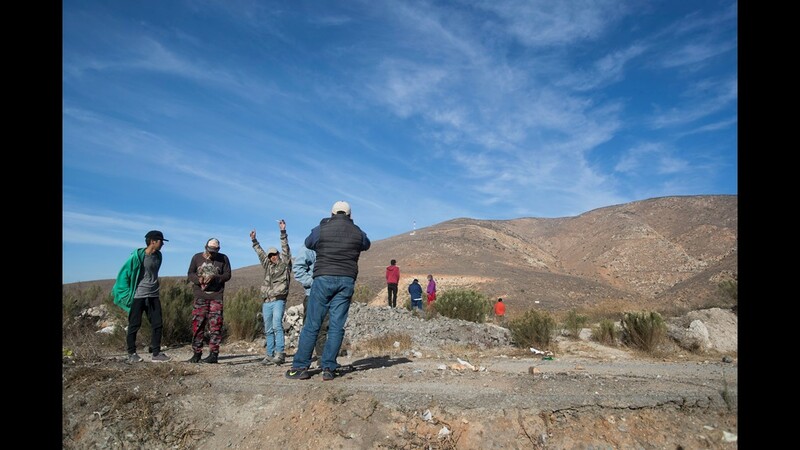 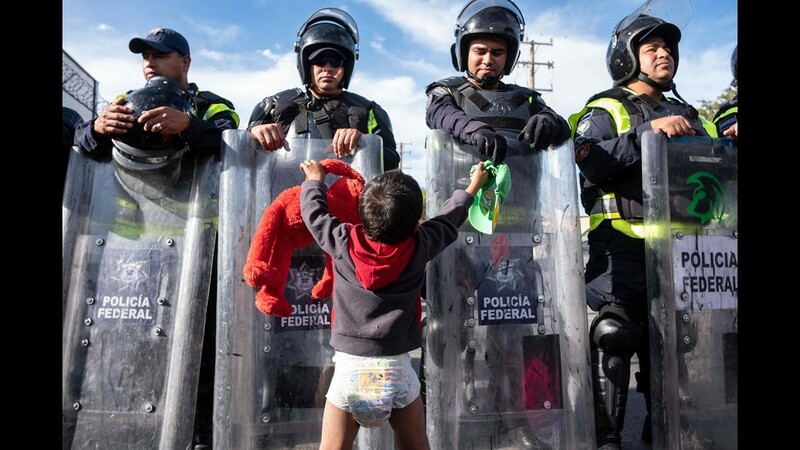 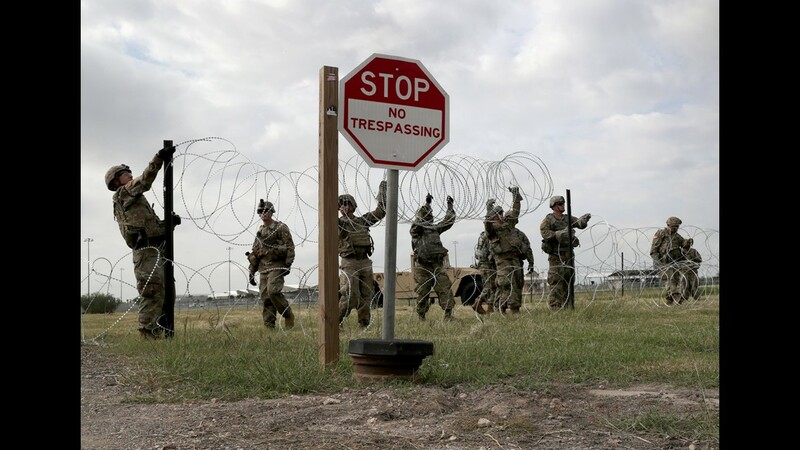 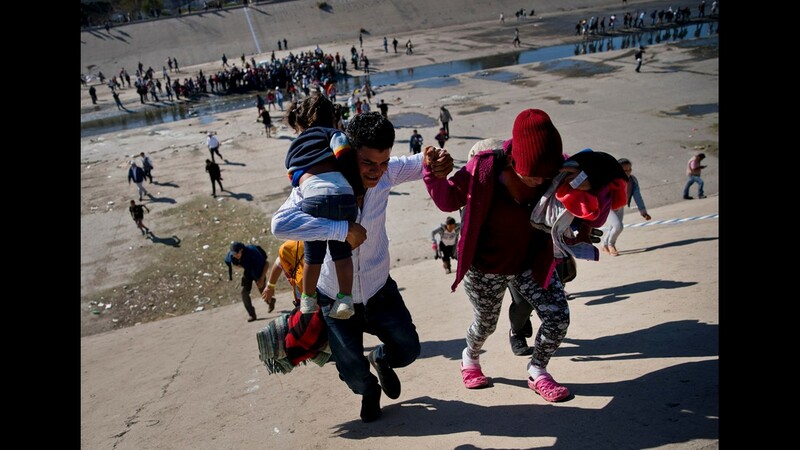 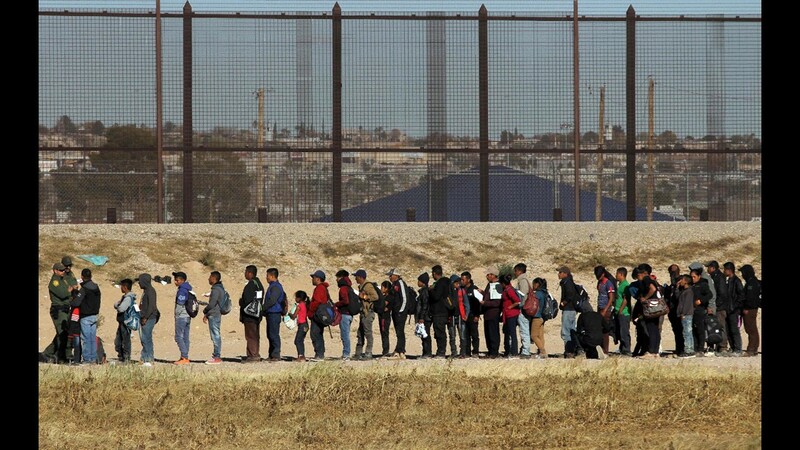 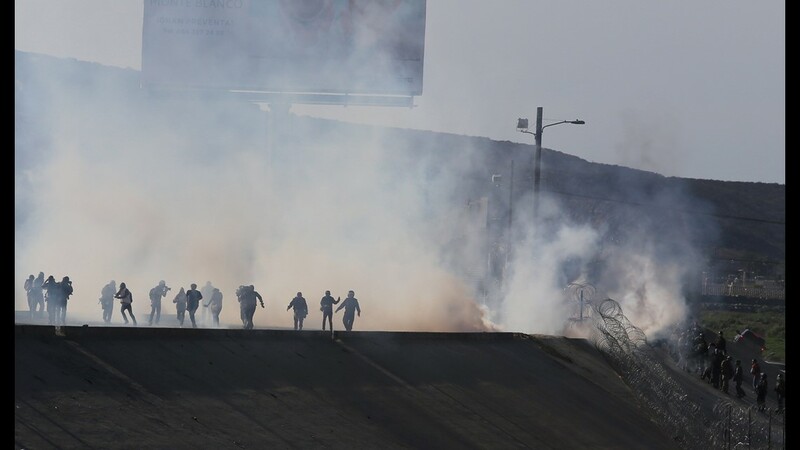 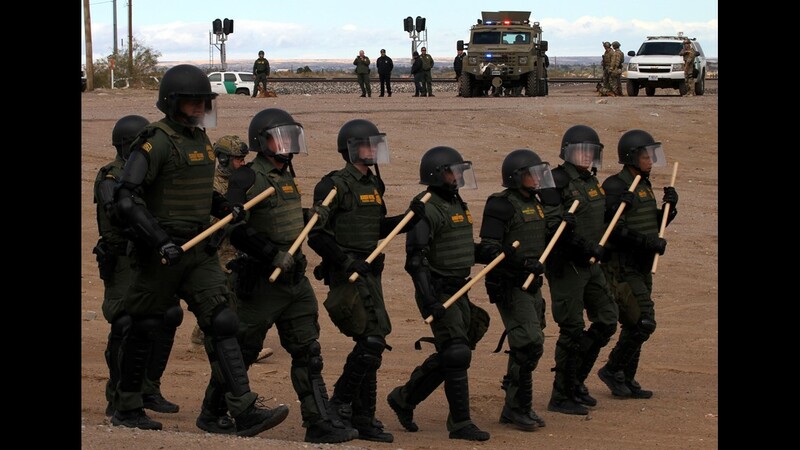 Customs and Border Protection said four officers were struck with rocks before they fired tear gas at the migrants. 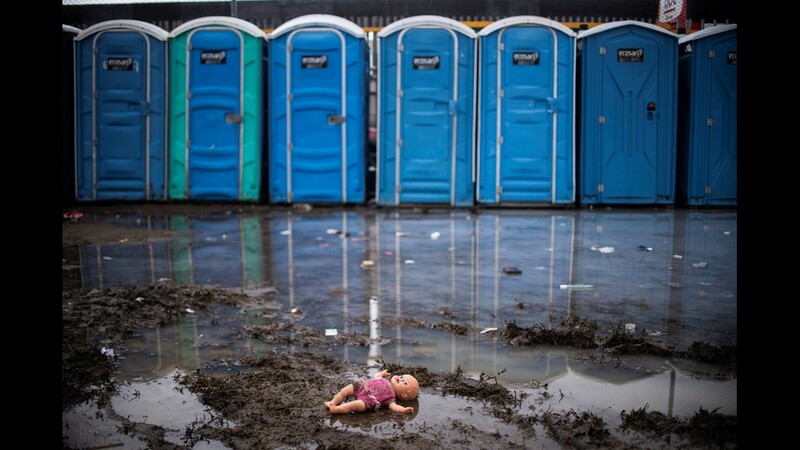 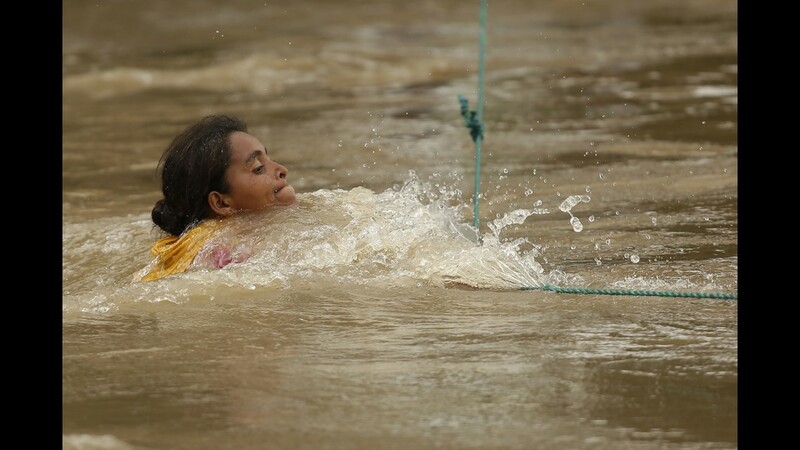 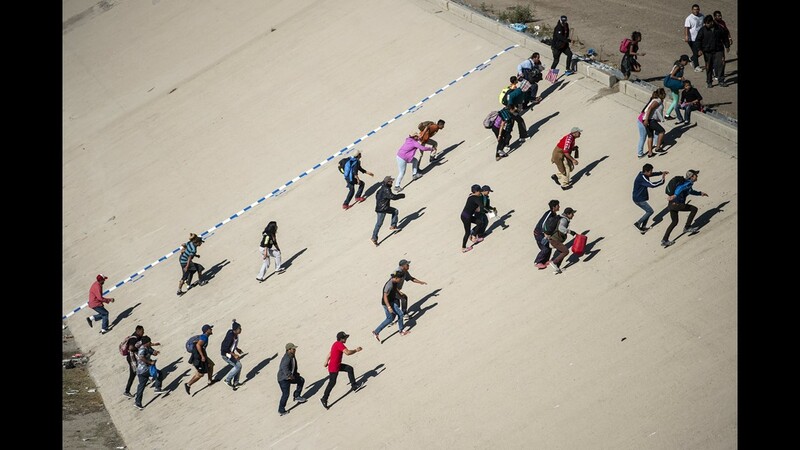 Photos posted on social media showed immigrants – some of them women with small children – running from the scene. 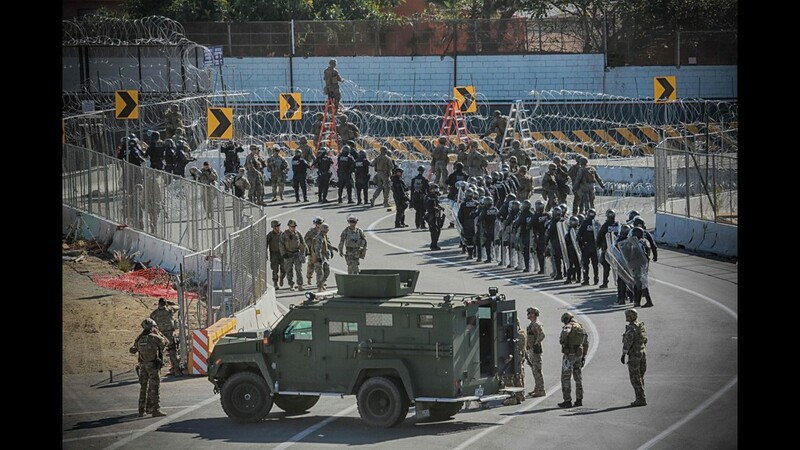 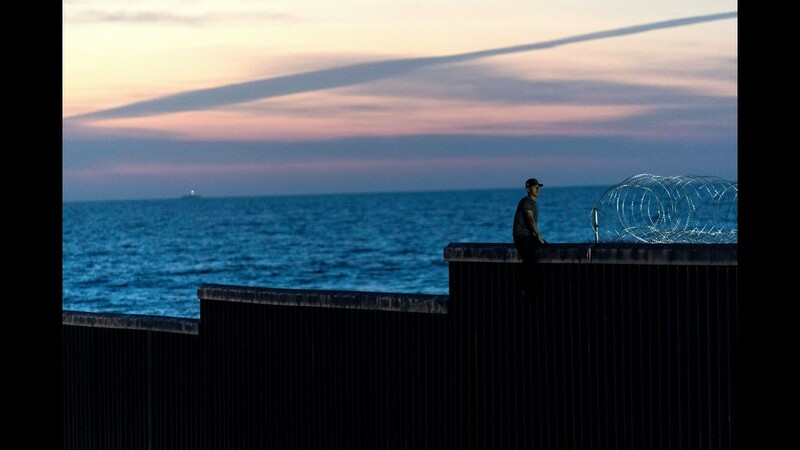 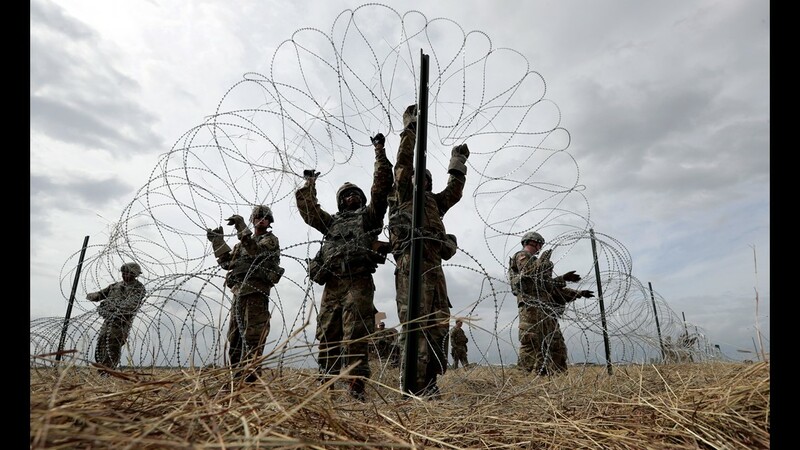 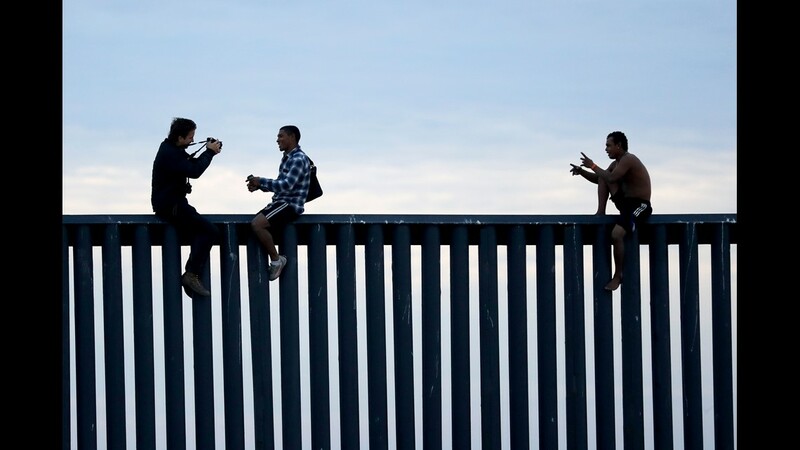 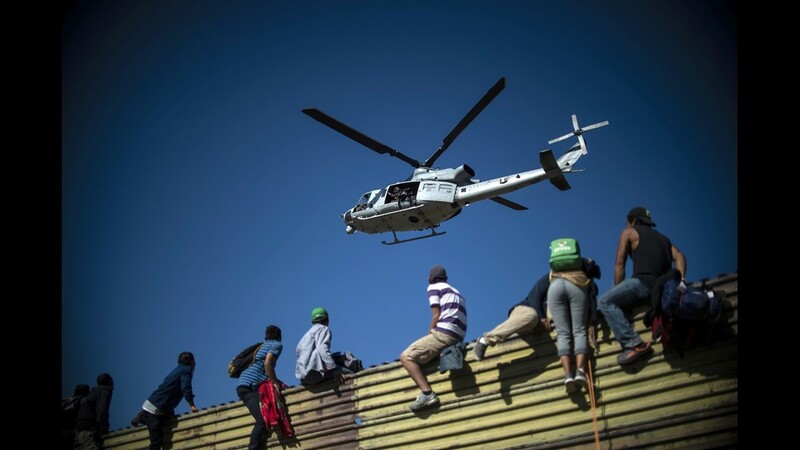 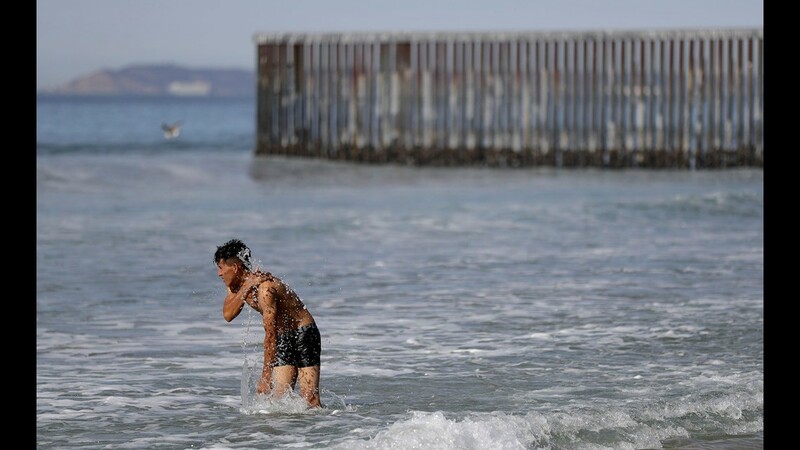 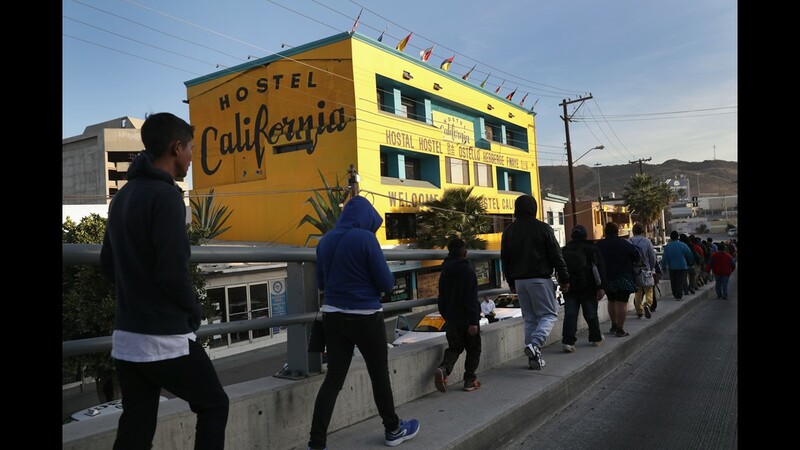 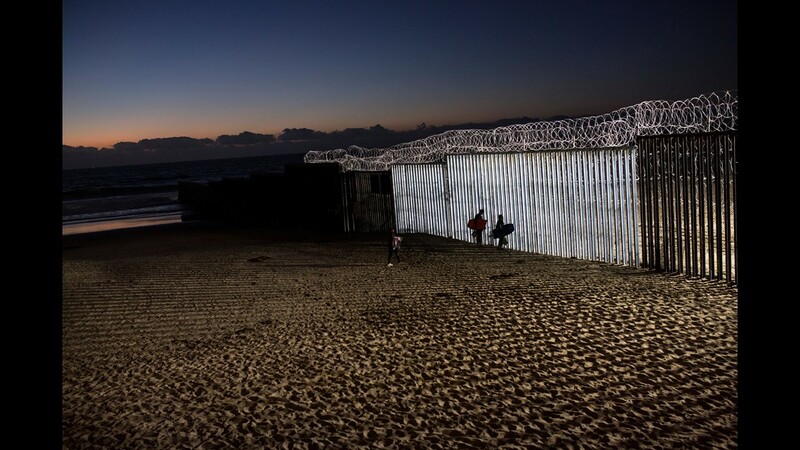 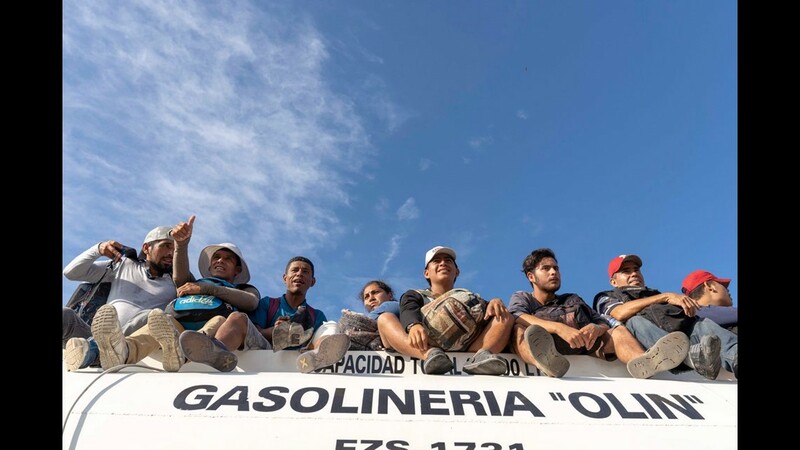 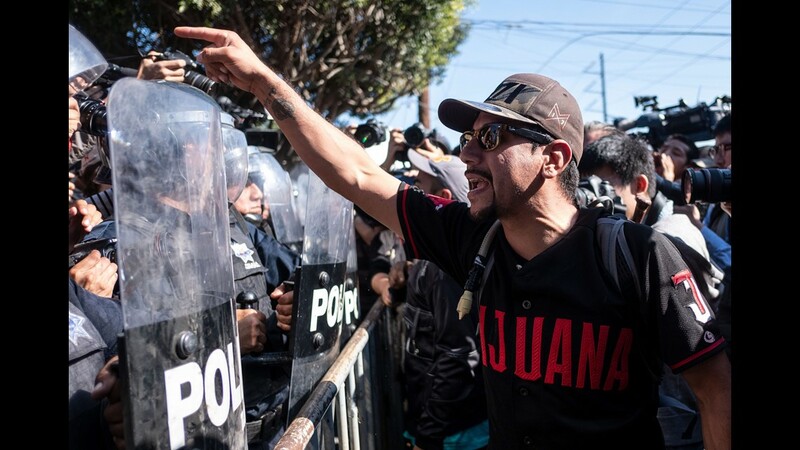 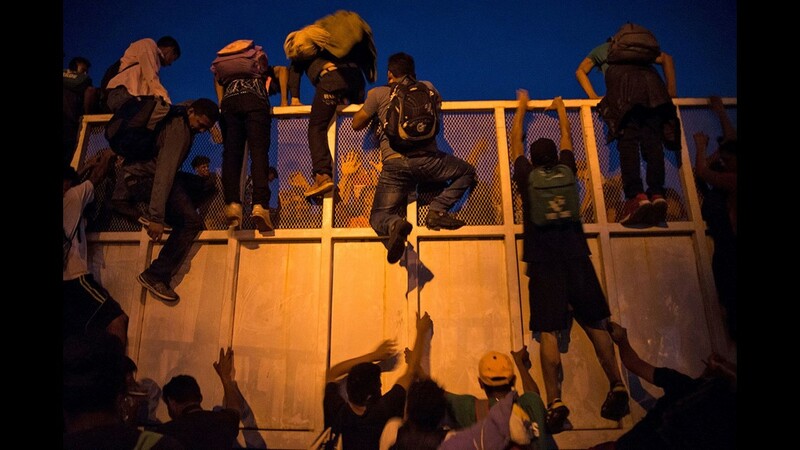 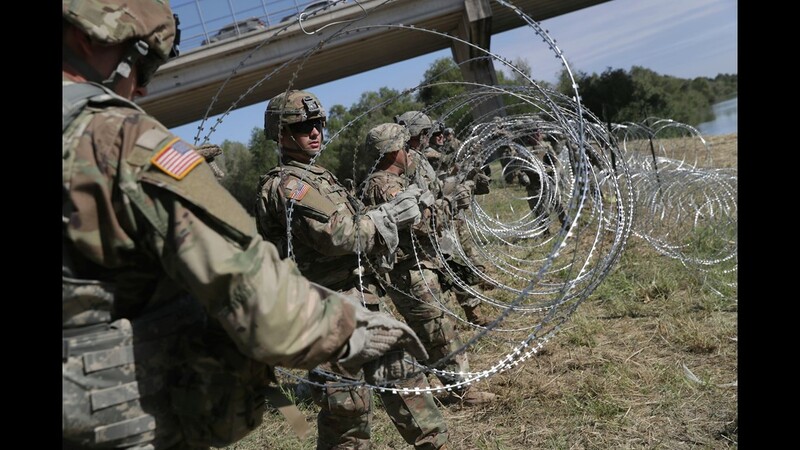 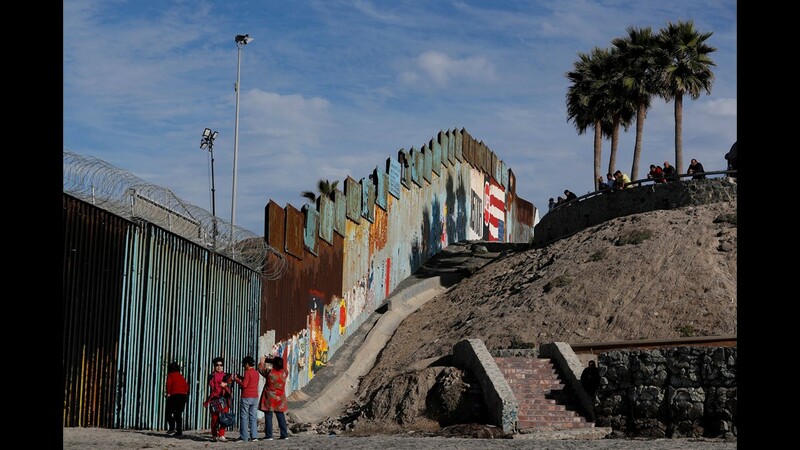 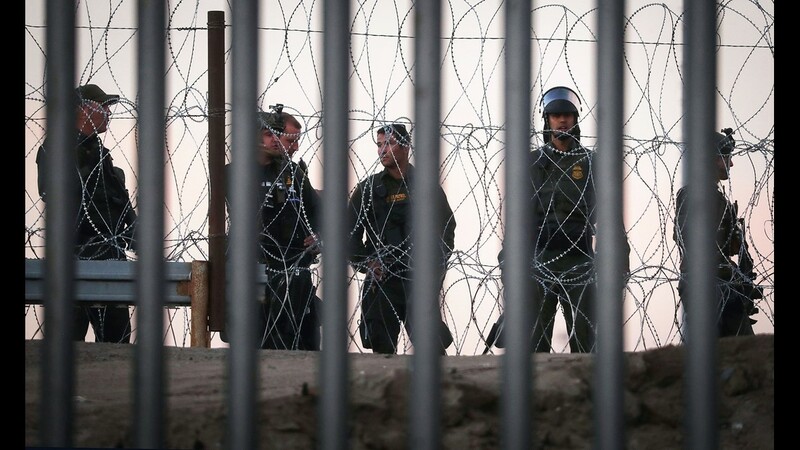 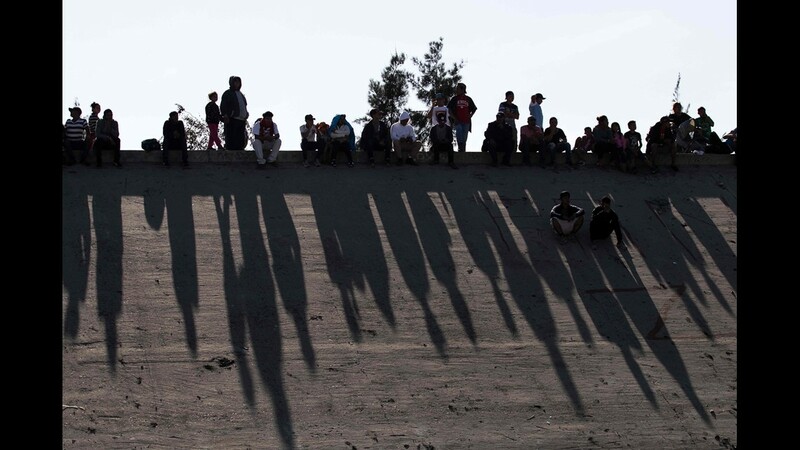 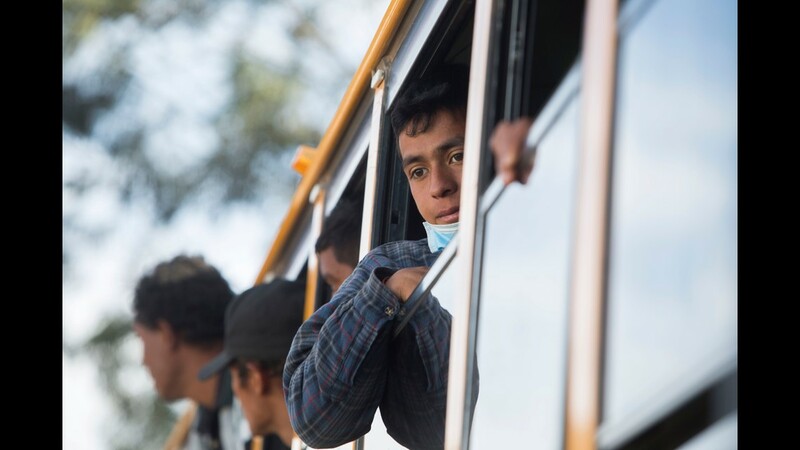 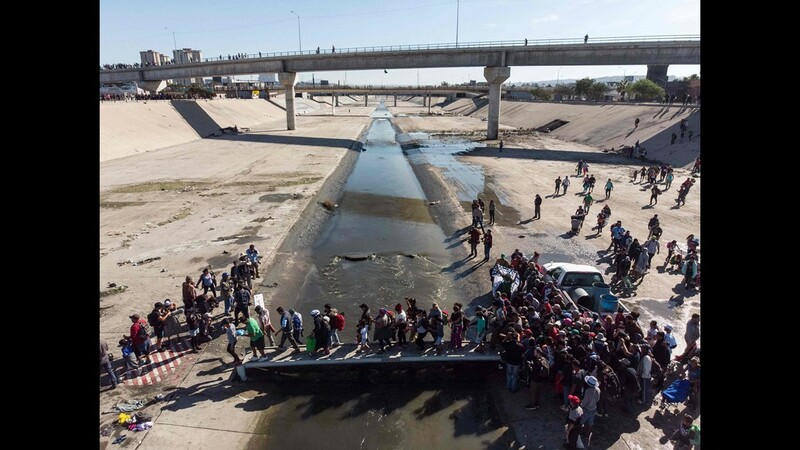 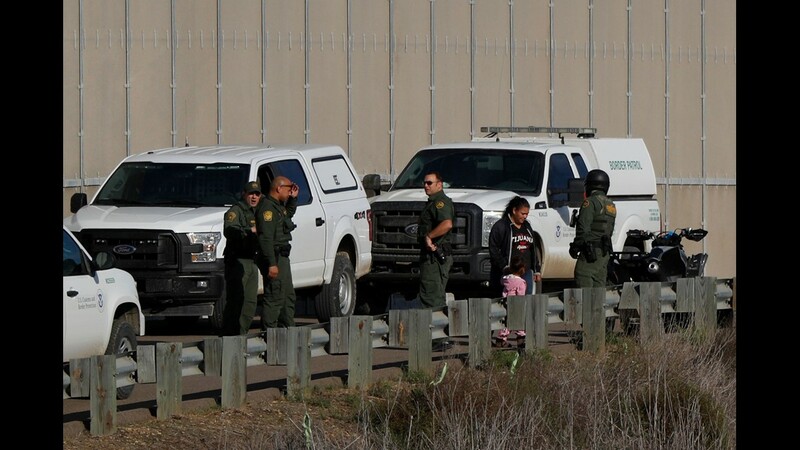 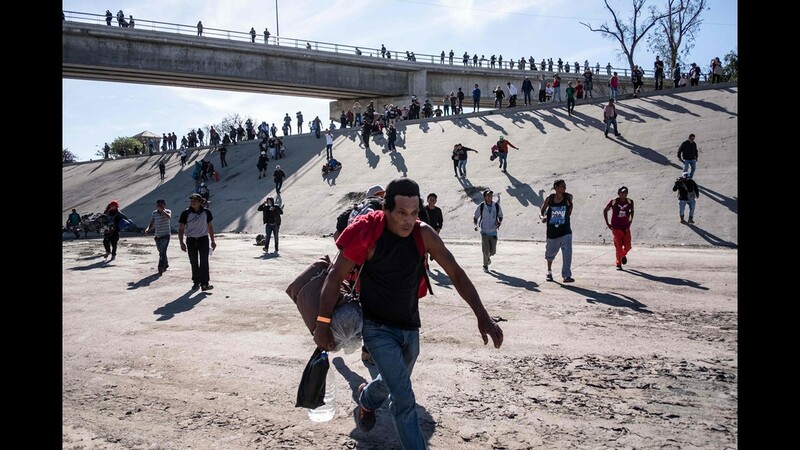 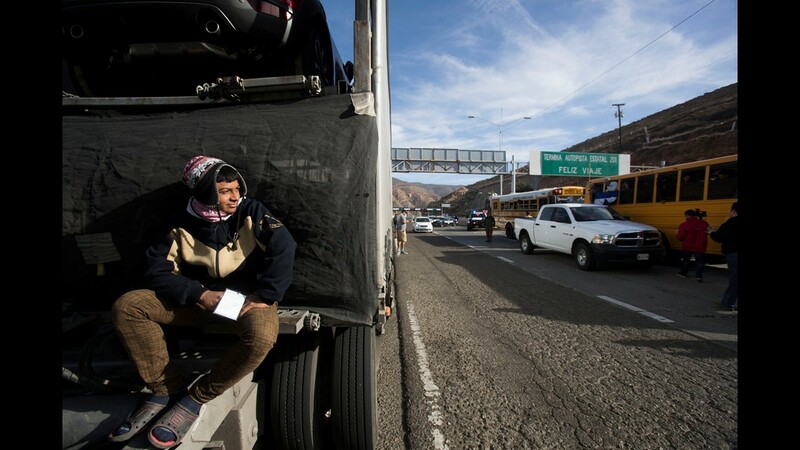 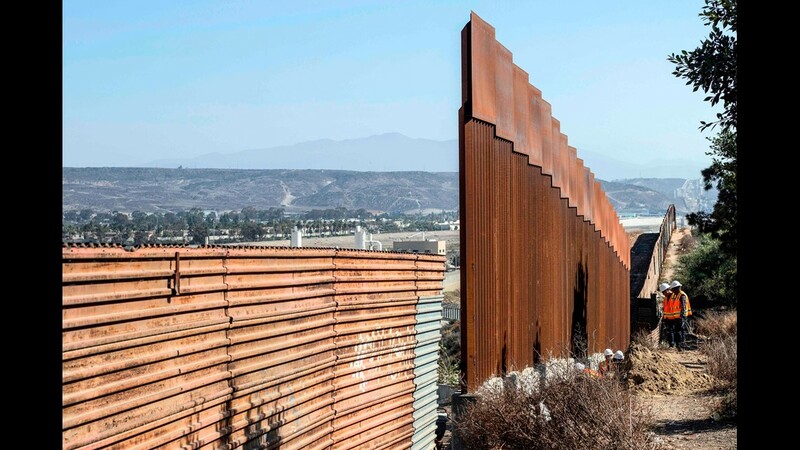 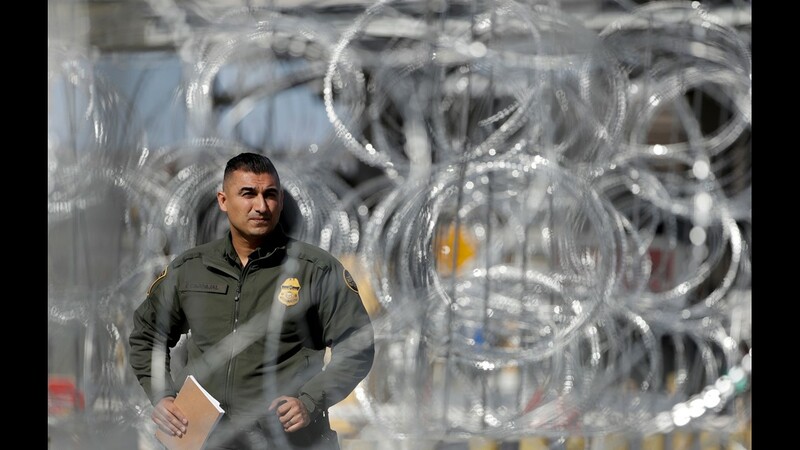 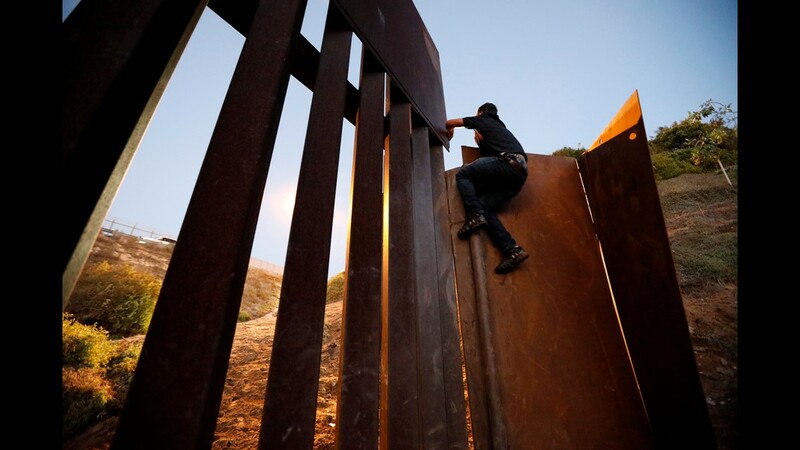 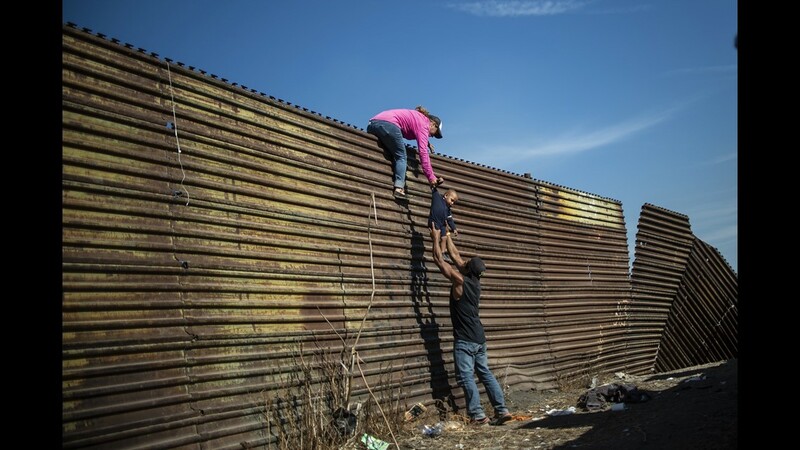 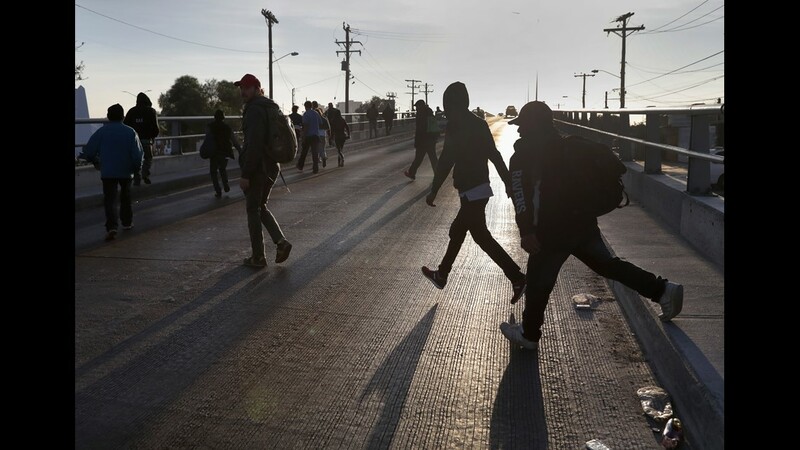 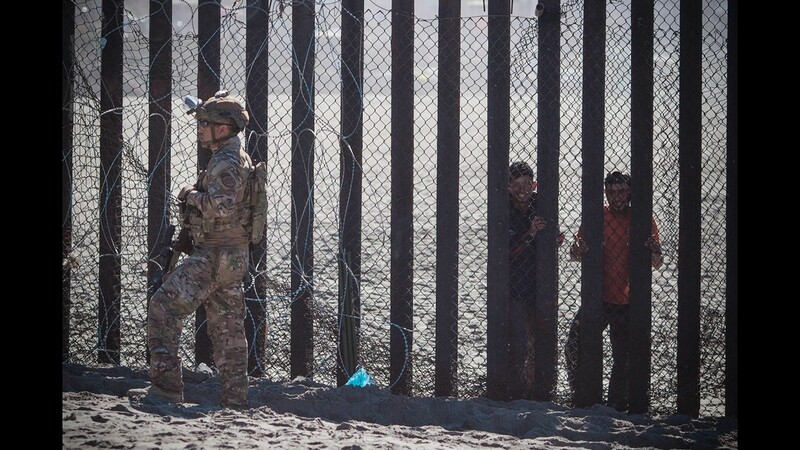 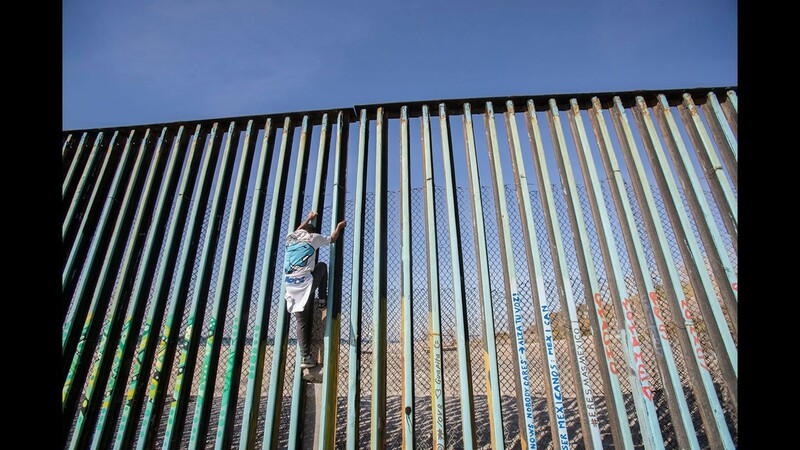 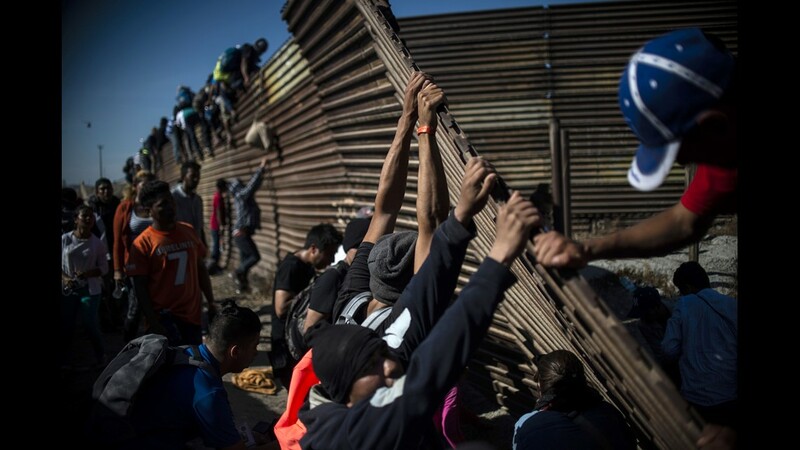 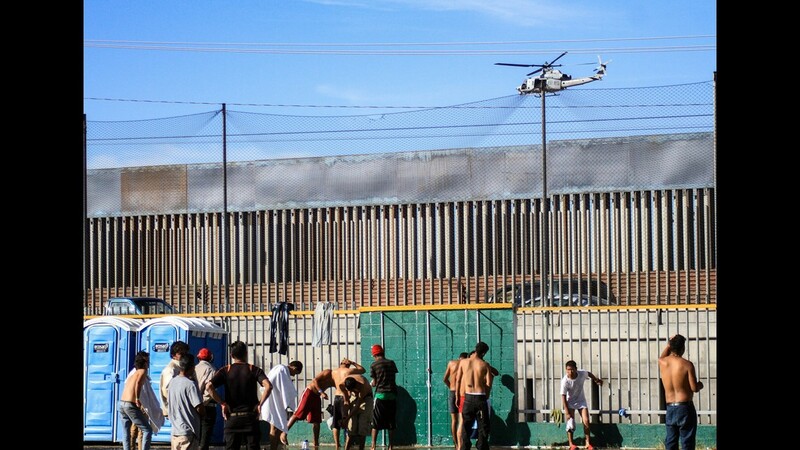 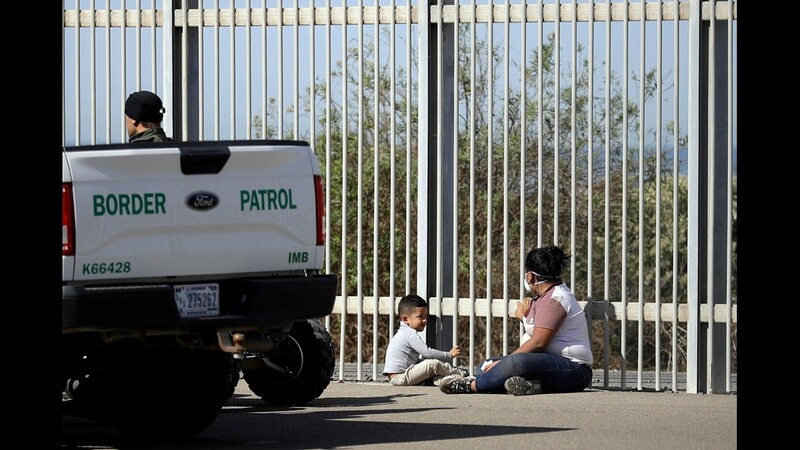 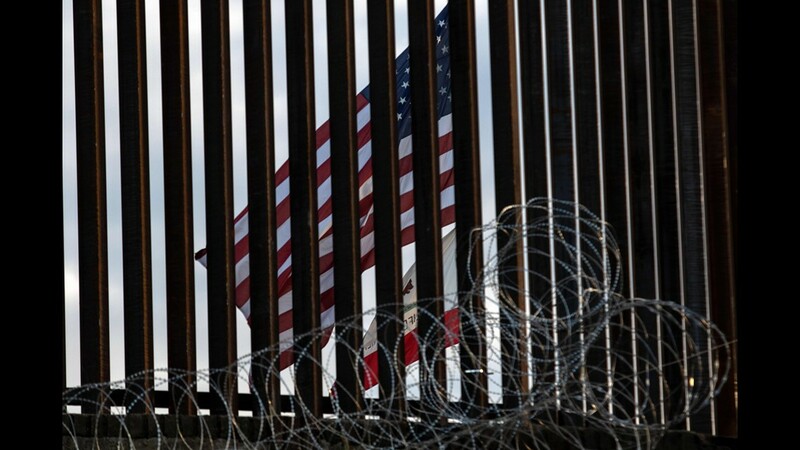 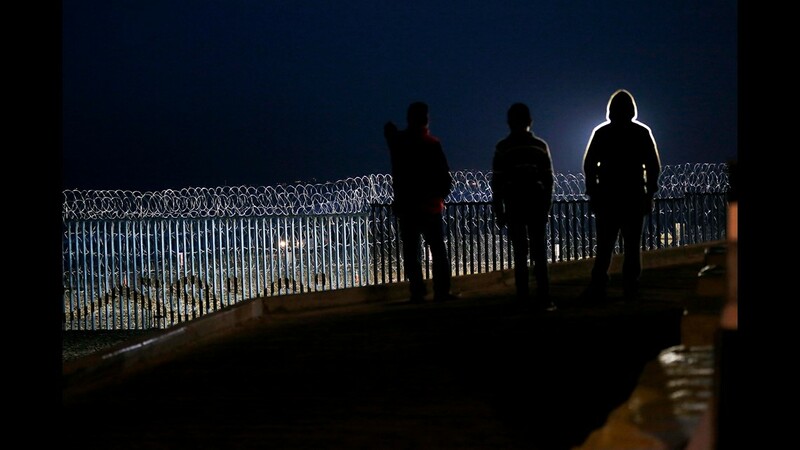 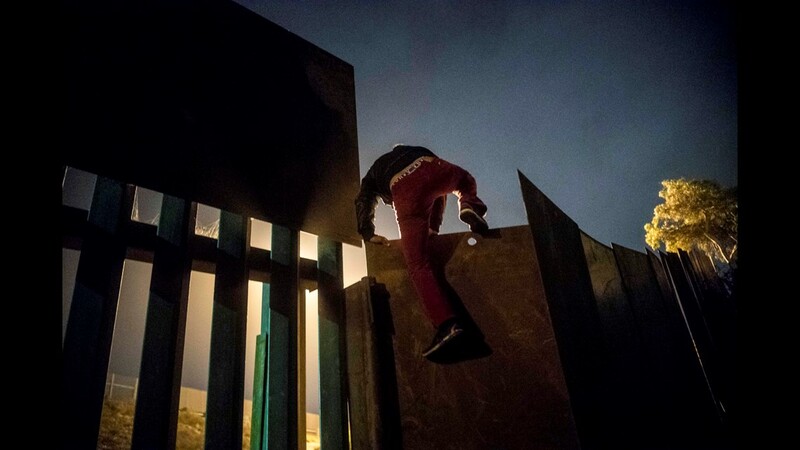 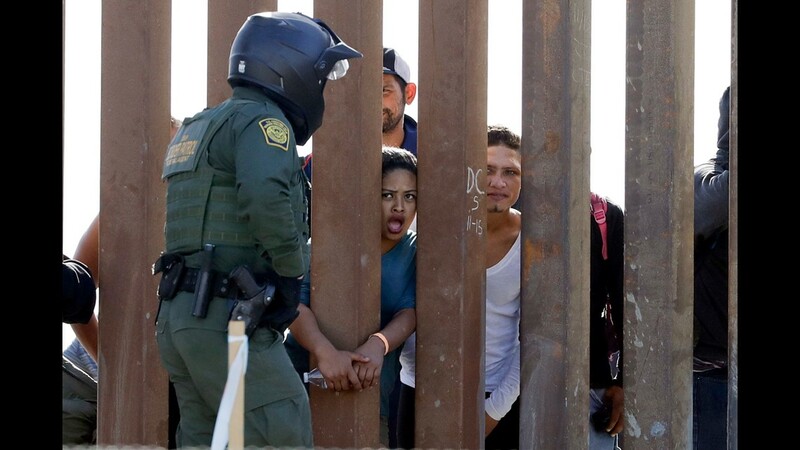 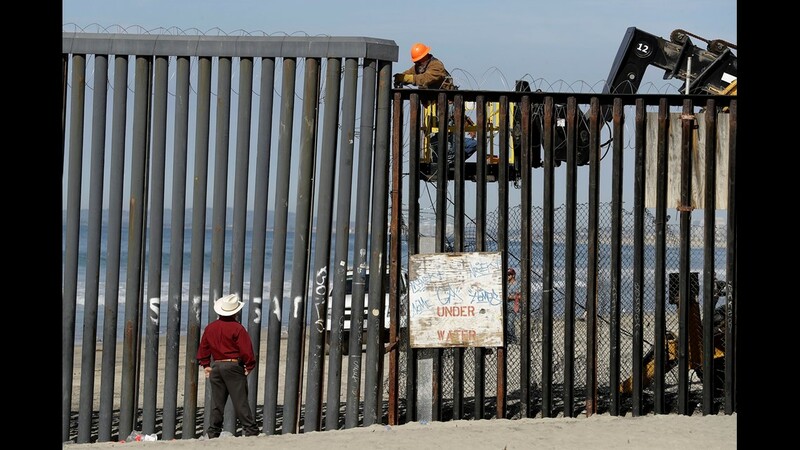 CBP Commissioner Kevin McAleenan said there were no reported serious injuries during clashes when more than 1,000 immigrants tried to cross first in vehicle lanes, then through gaps in the fence or along the Tijuana River channel. 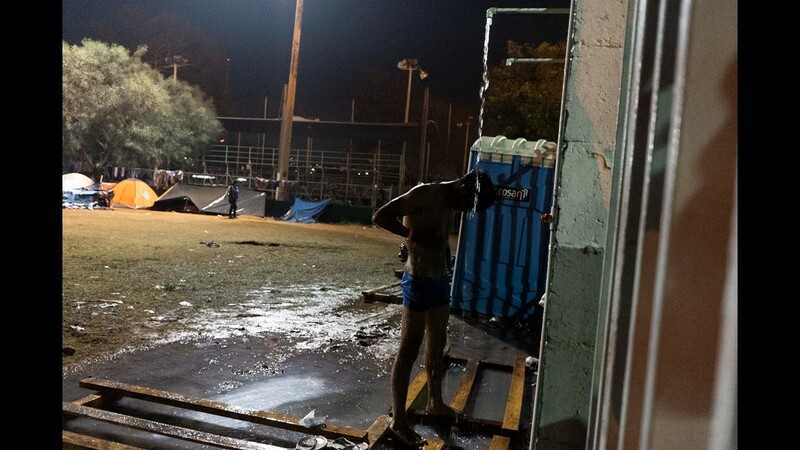 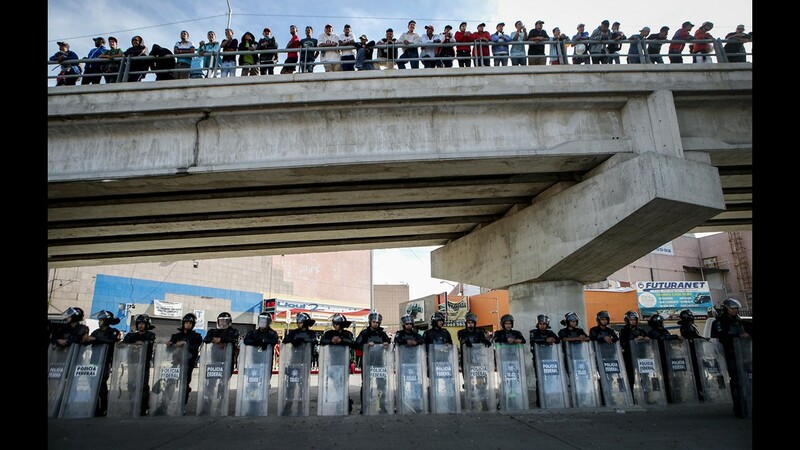 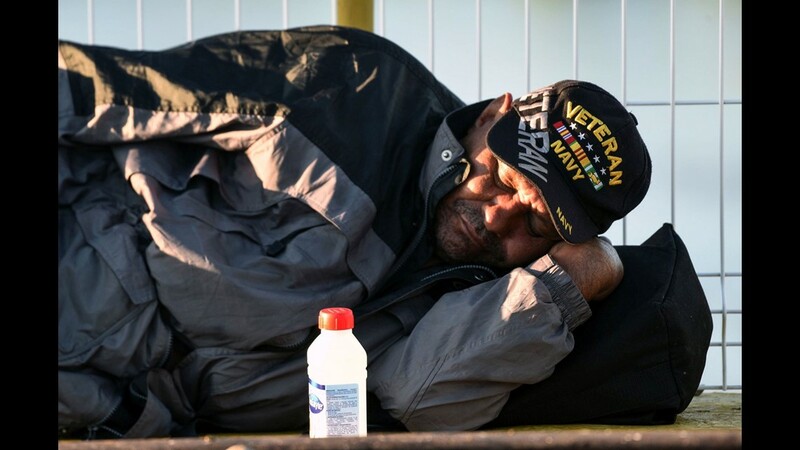 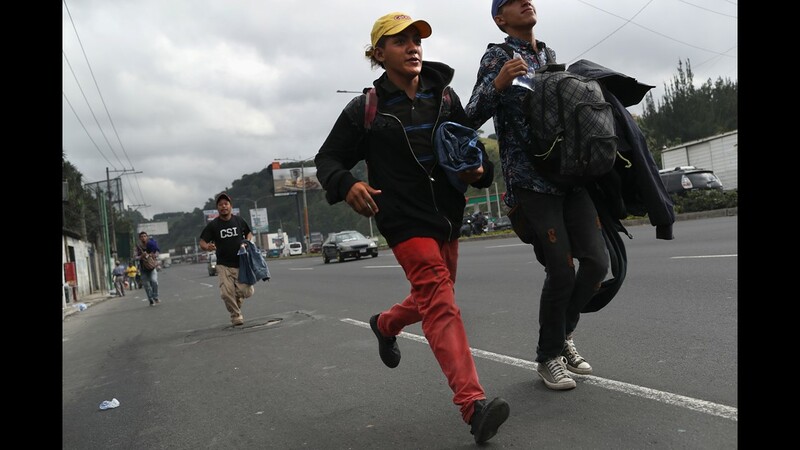 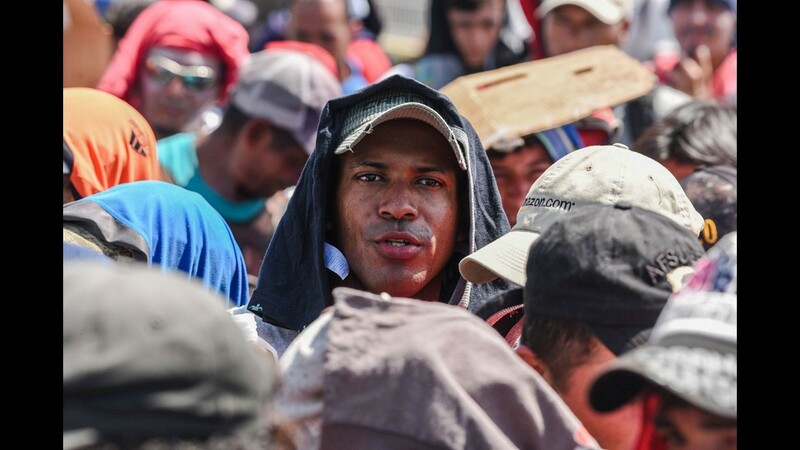 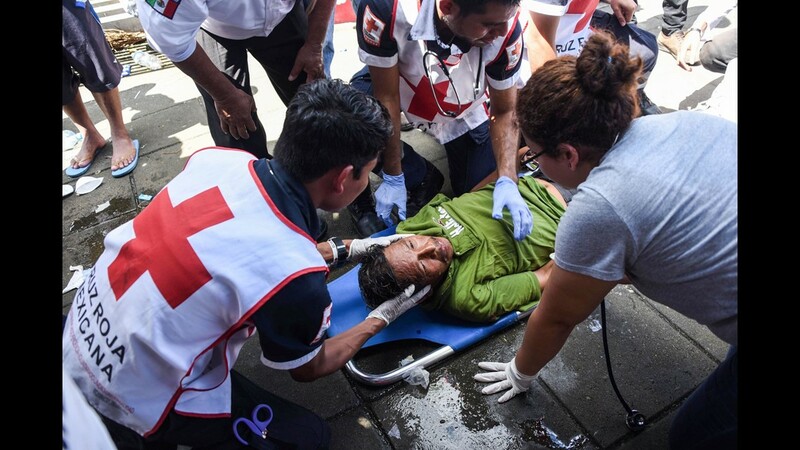 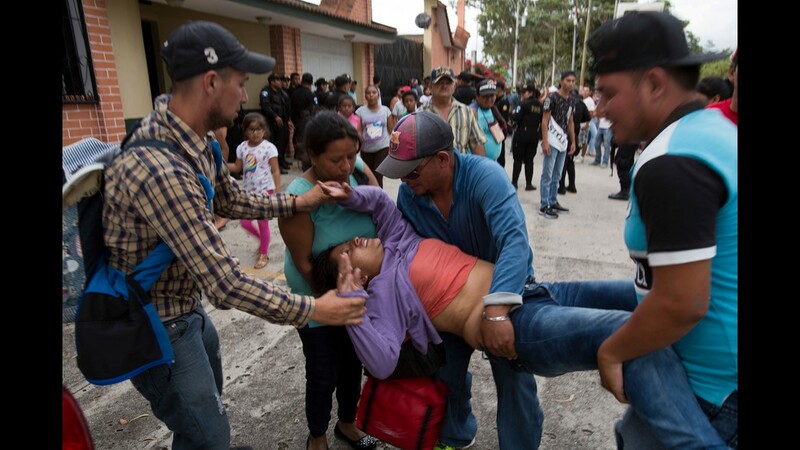 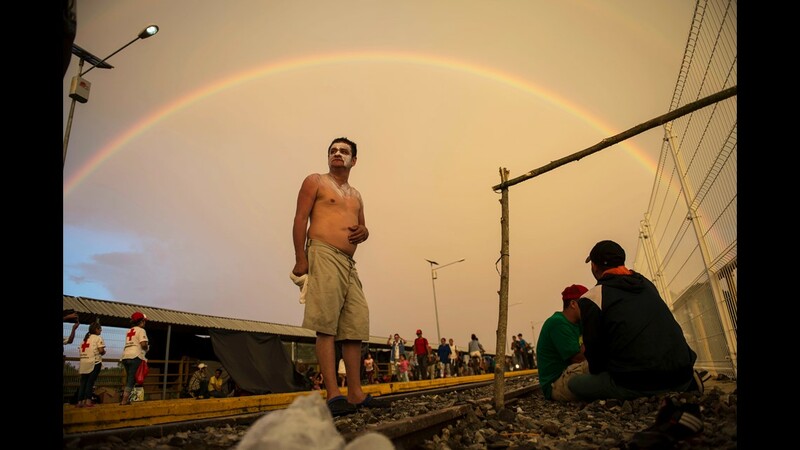 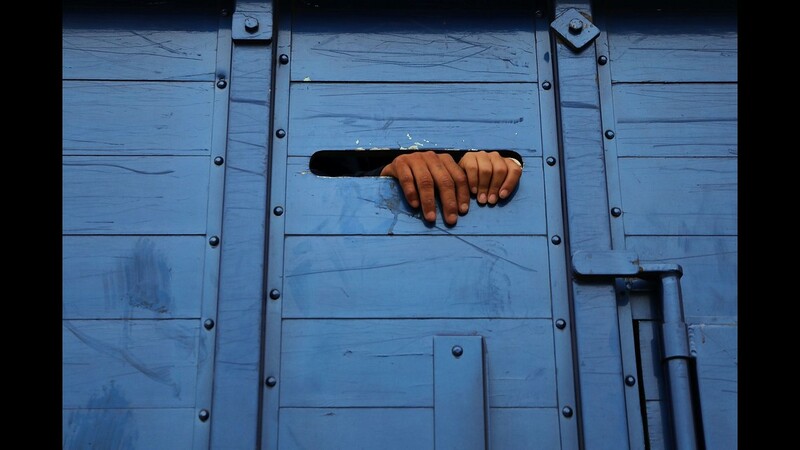 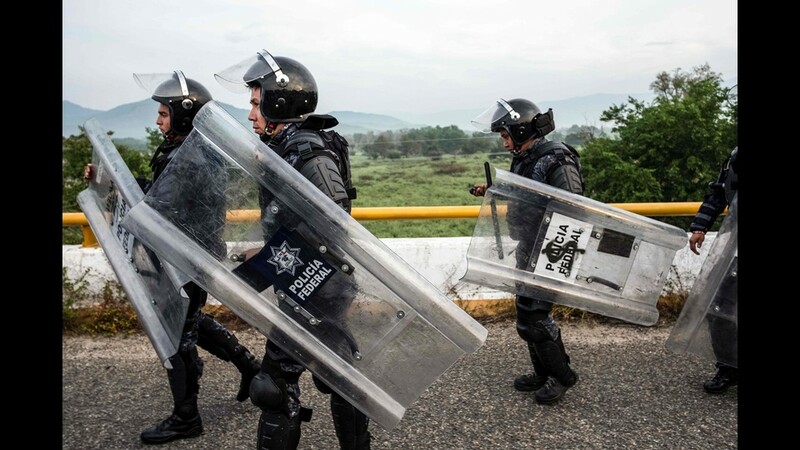 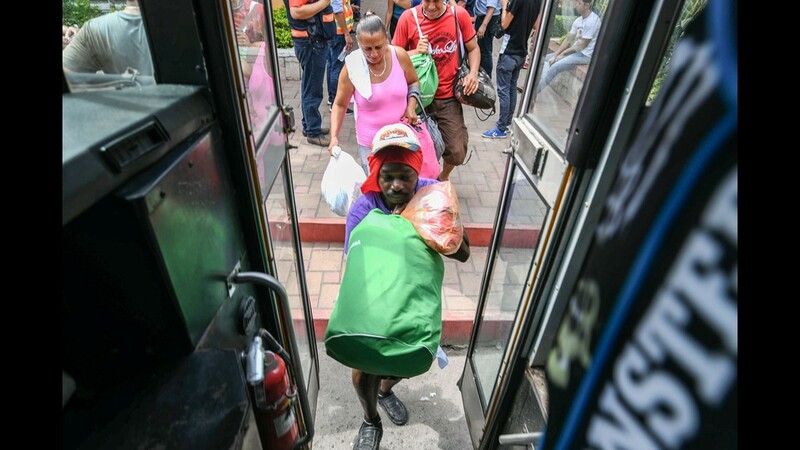 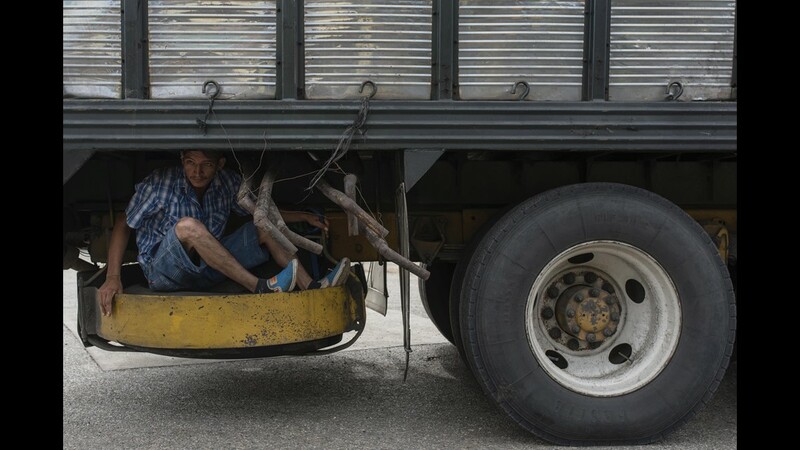 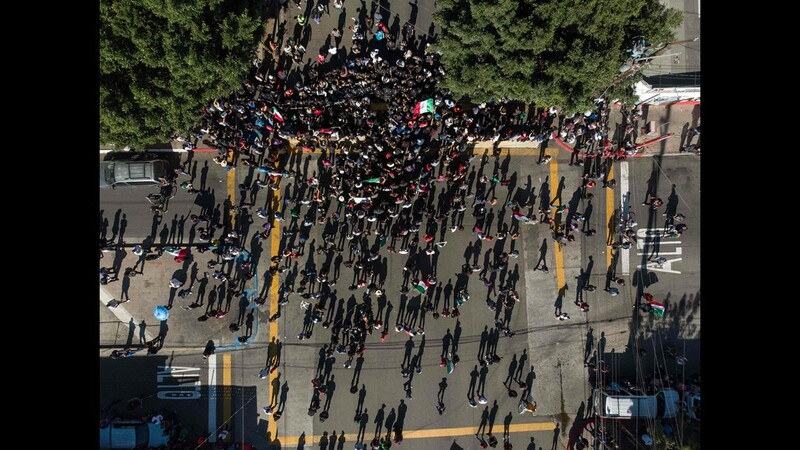 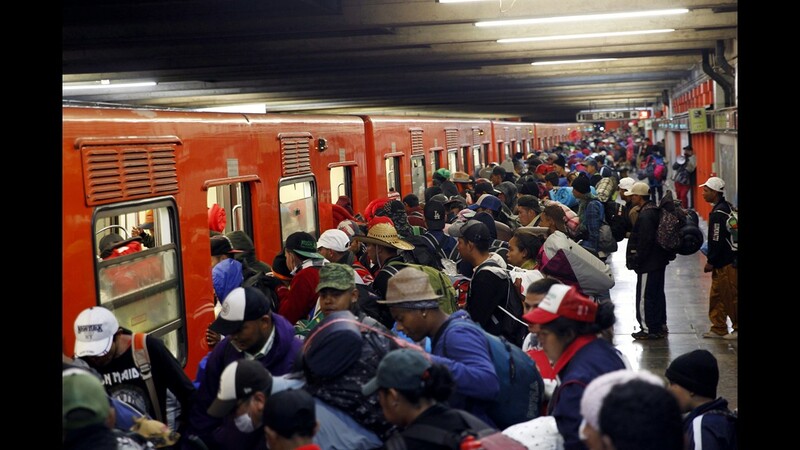 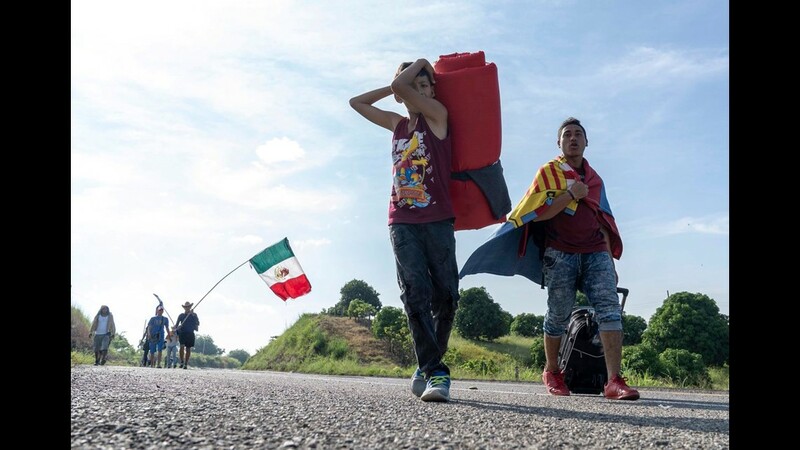 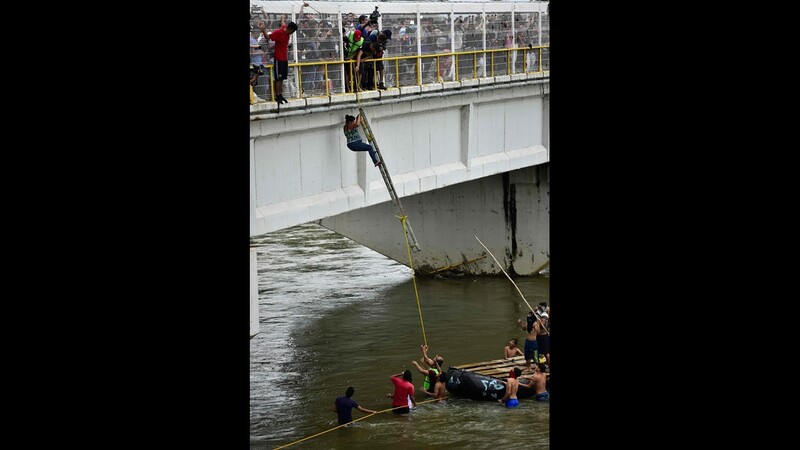 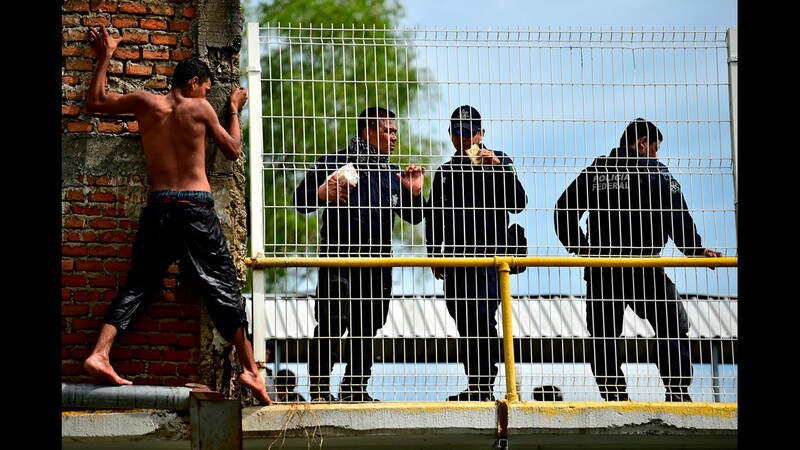 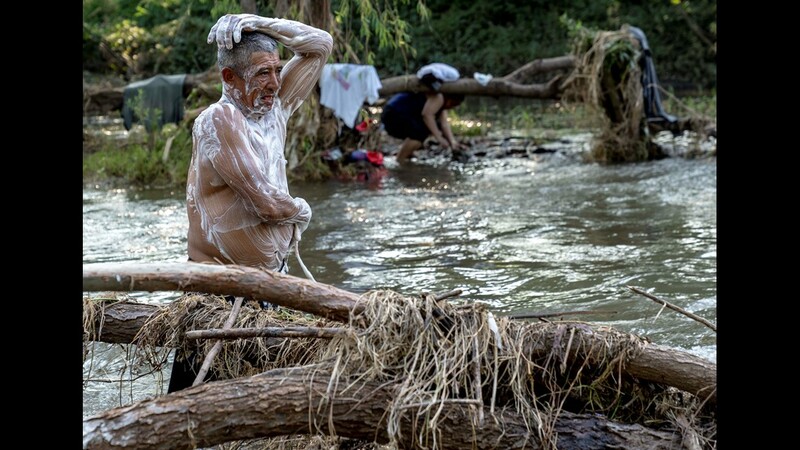 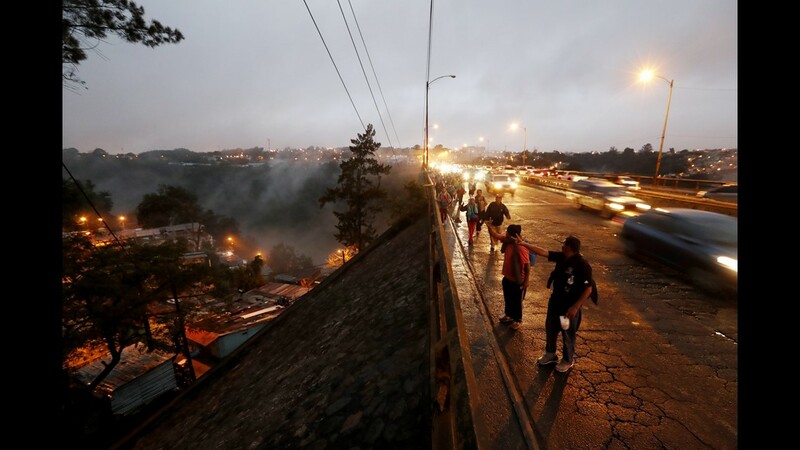 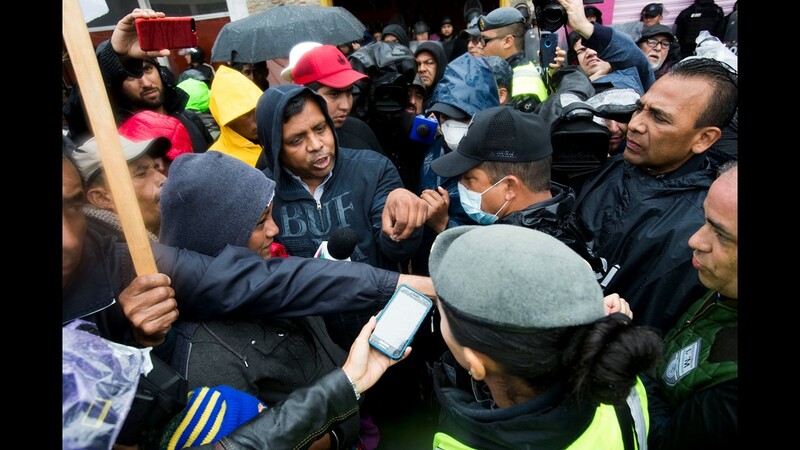 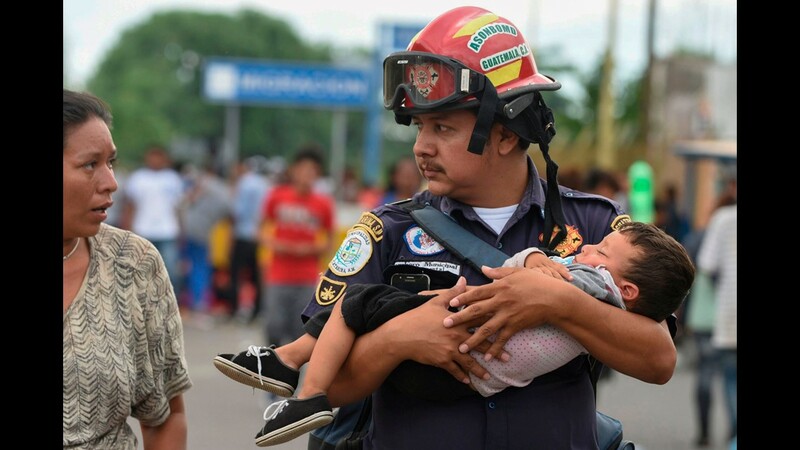 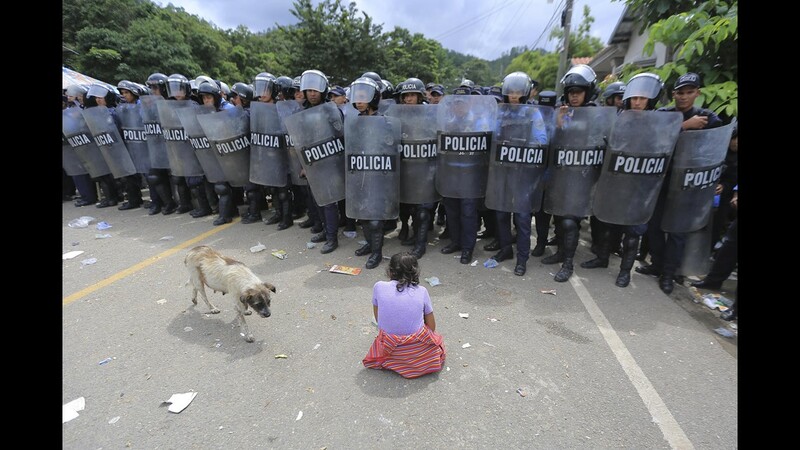 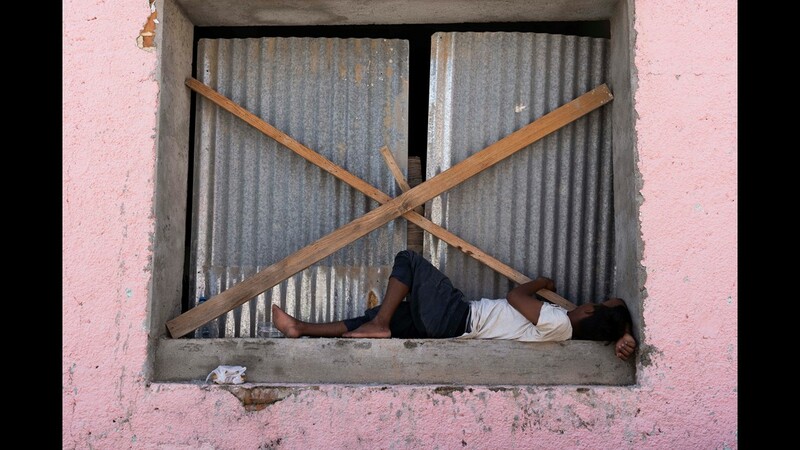 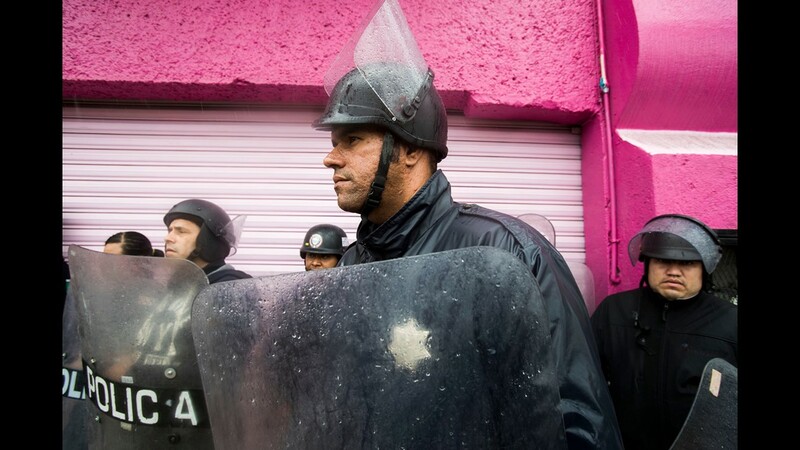 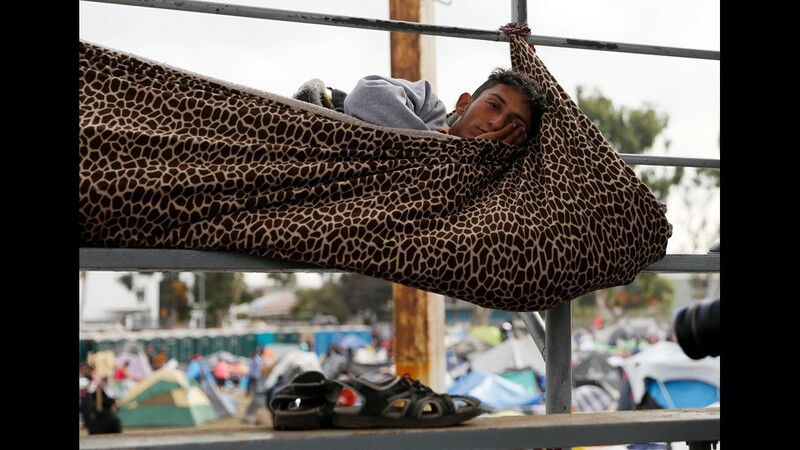 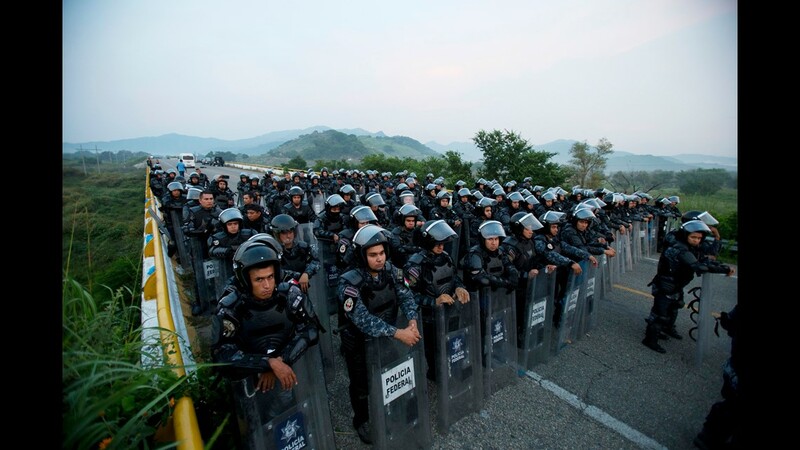 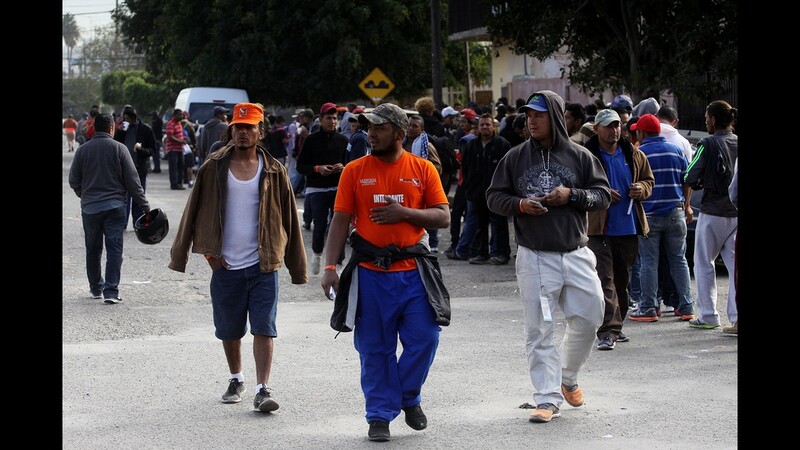 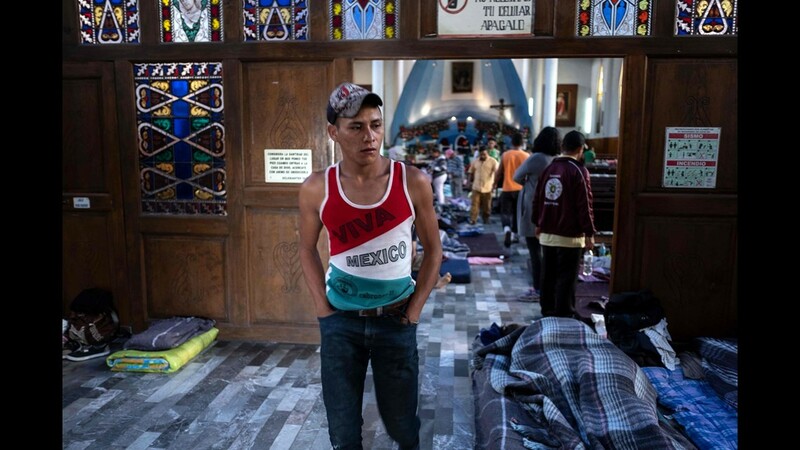 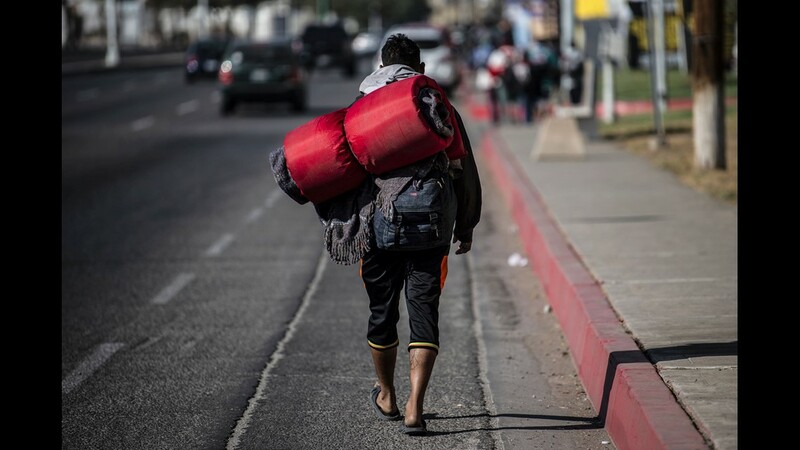 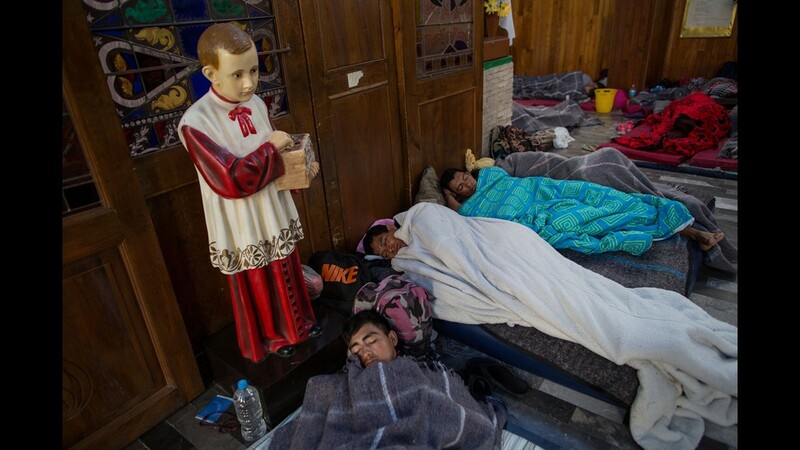 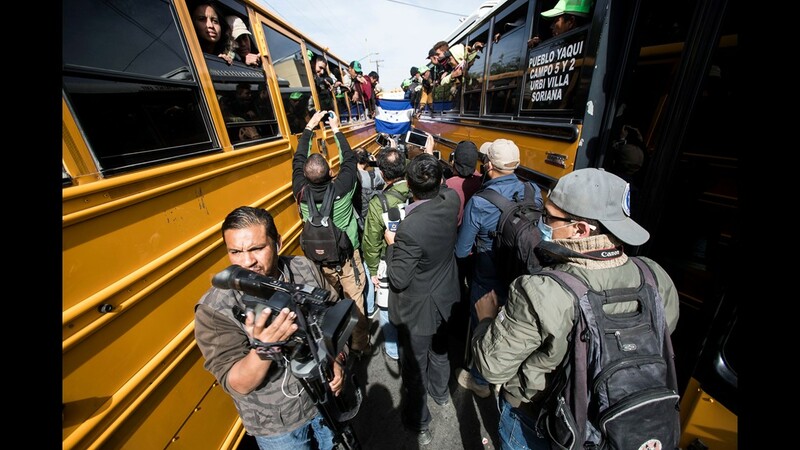 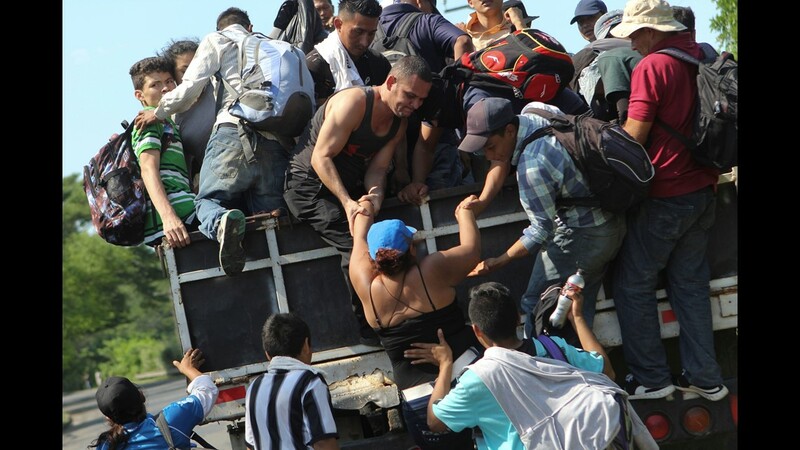 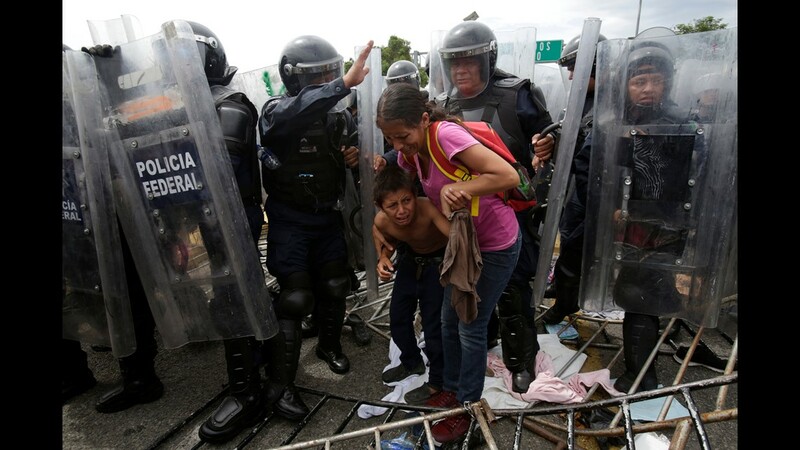 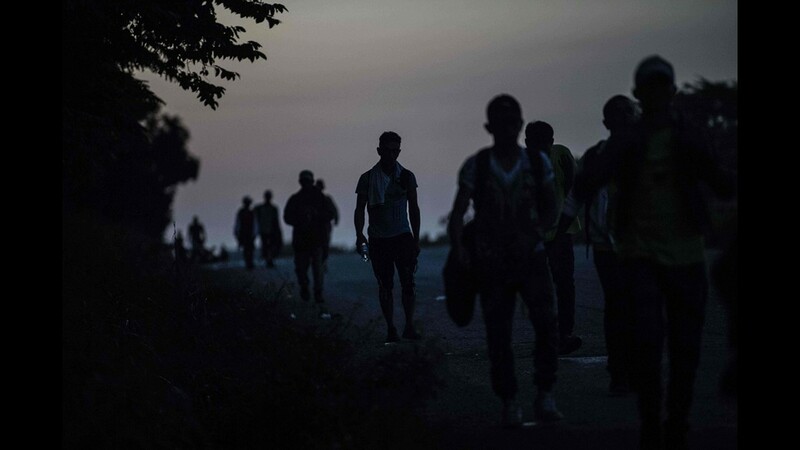 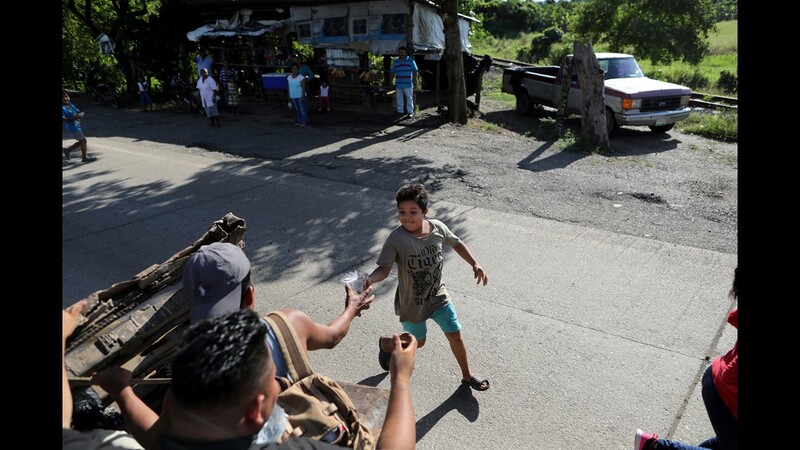 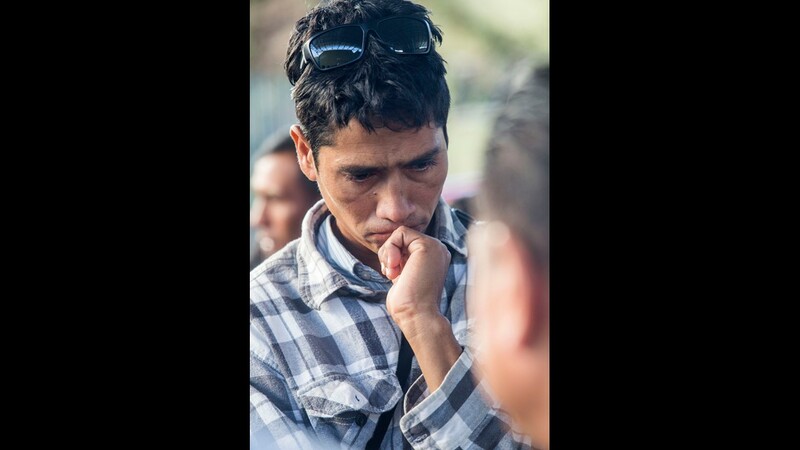 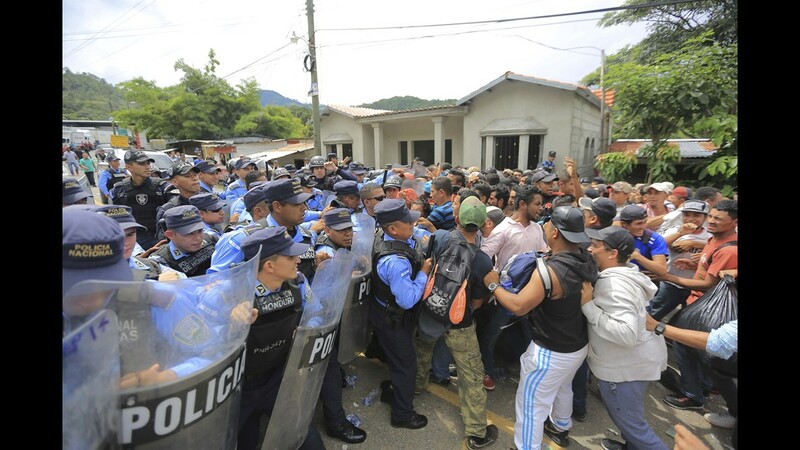 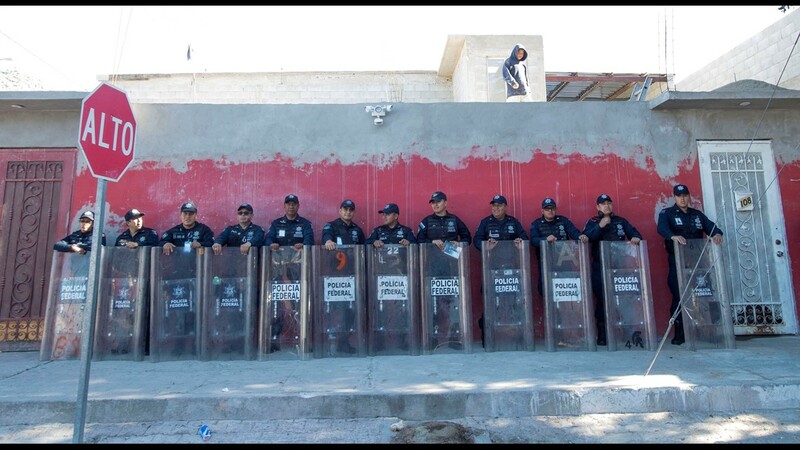 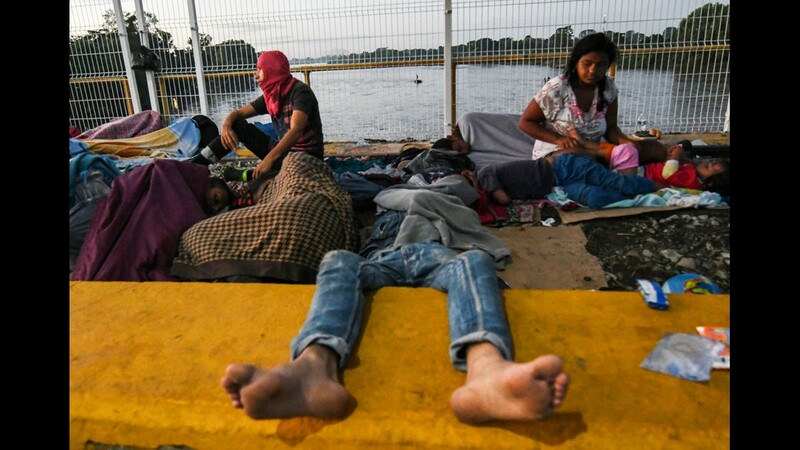 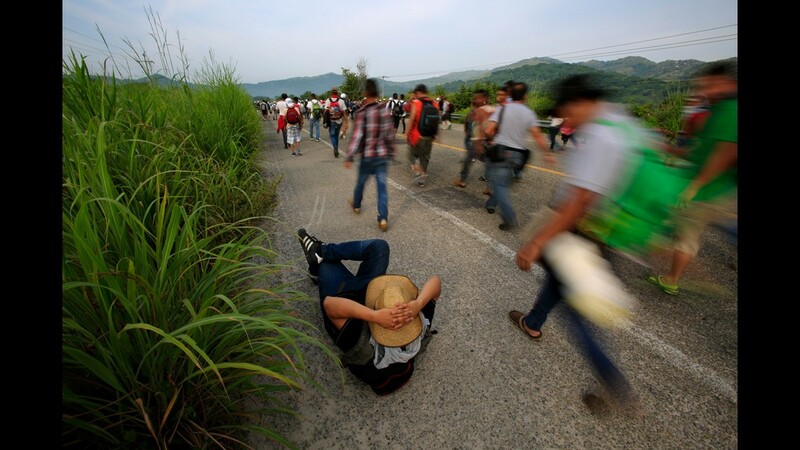 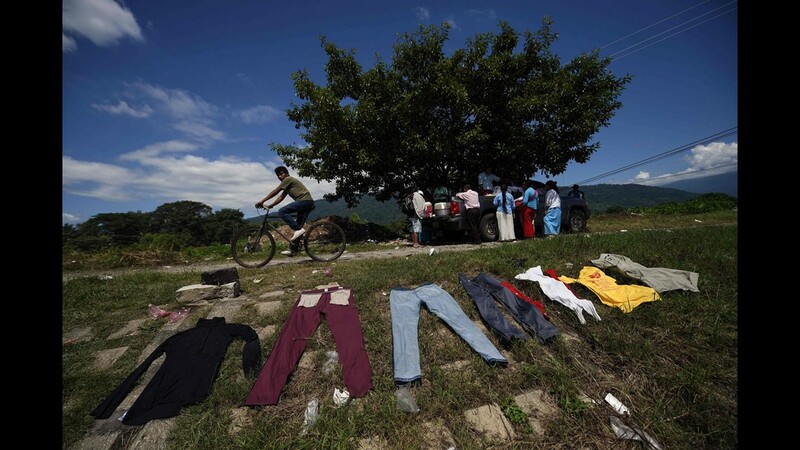 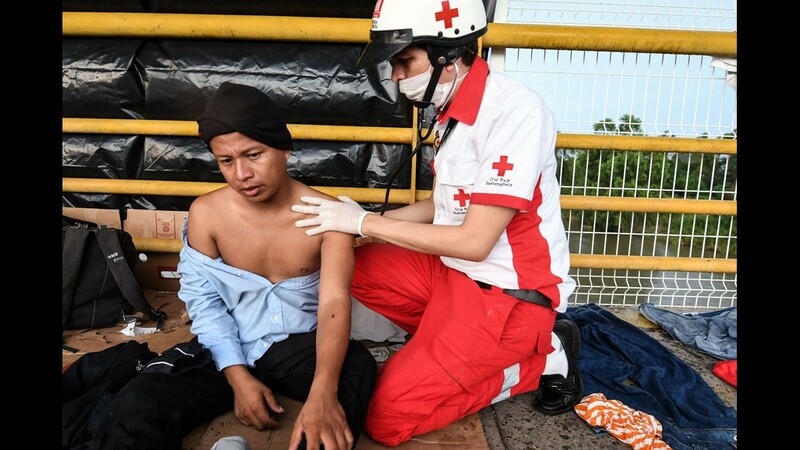 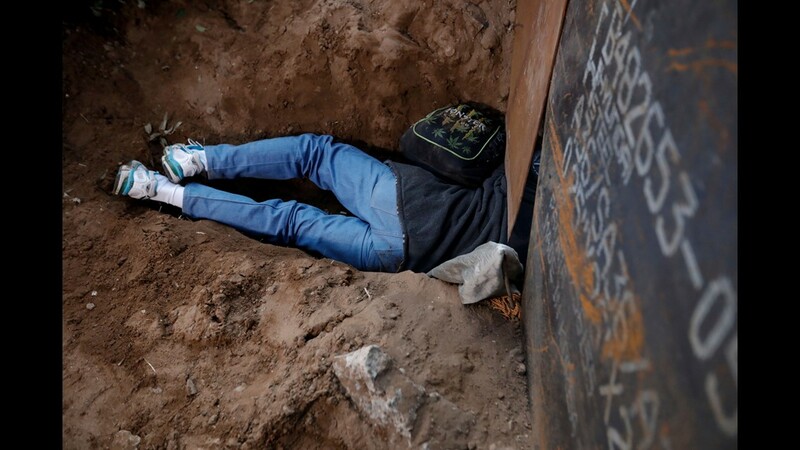 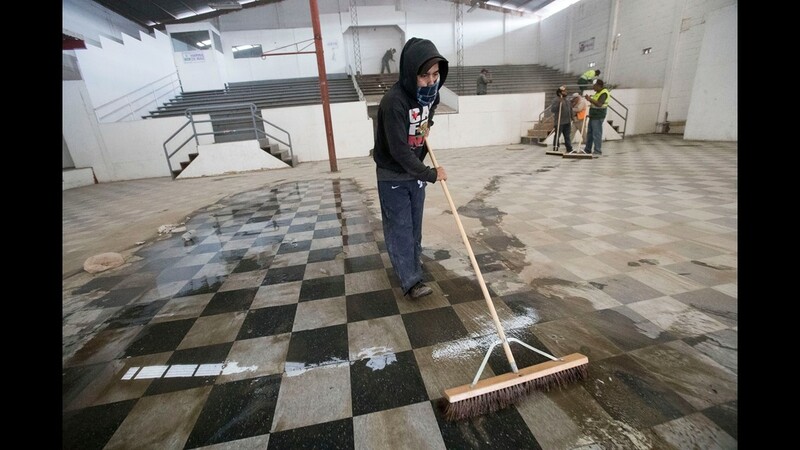 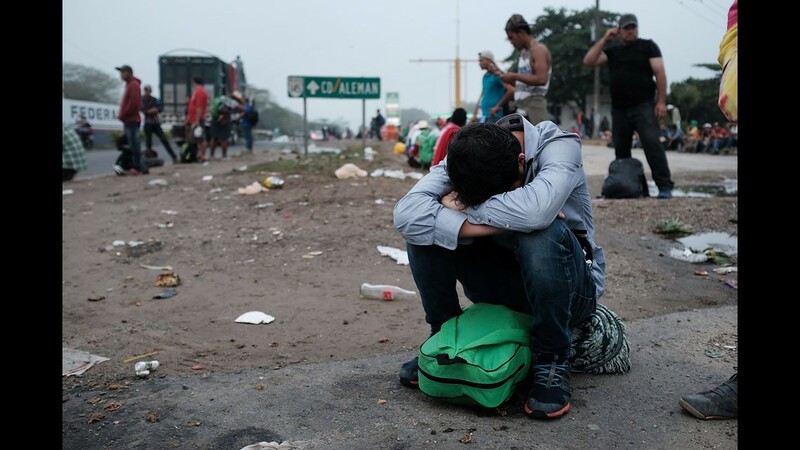 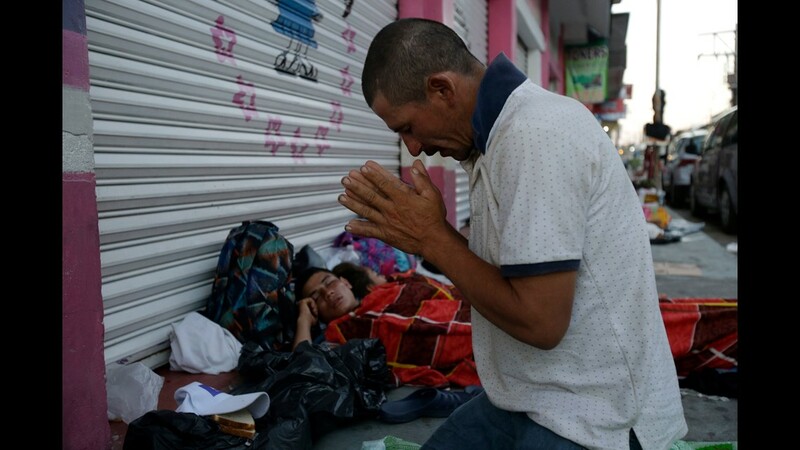 He said 69 immigrants were detained Sunday during the clashes for crossing illegally. 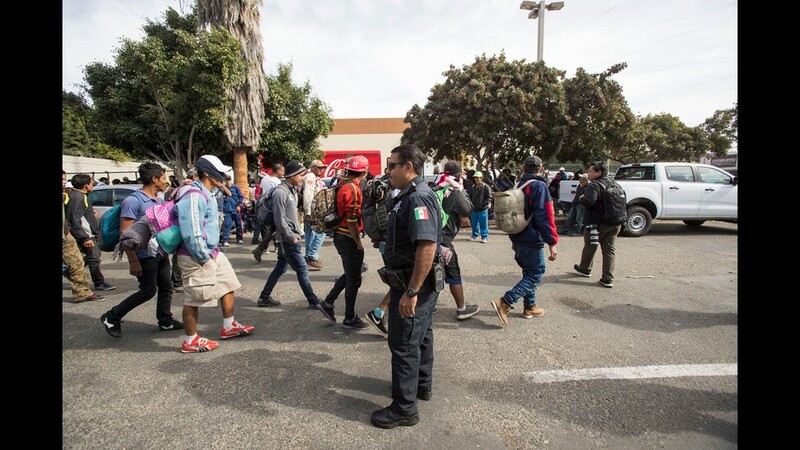 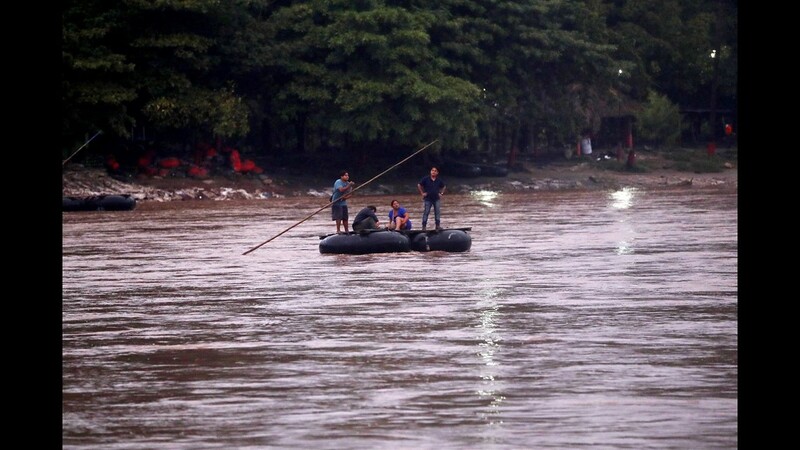 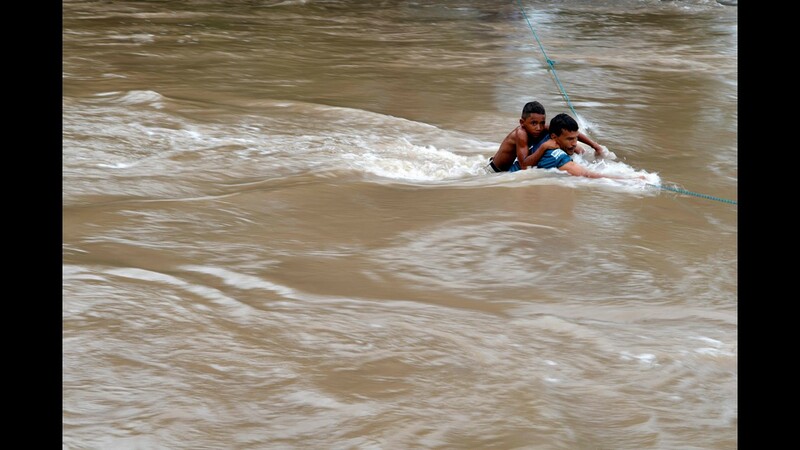 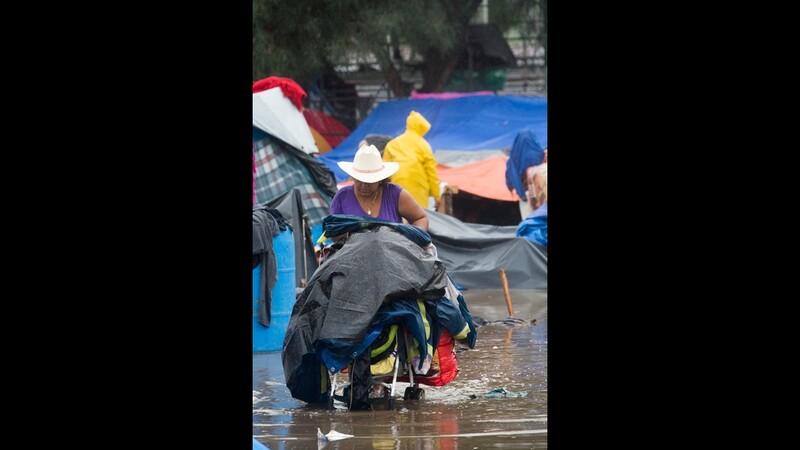 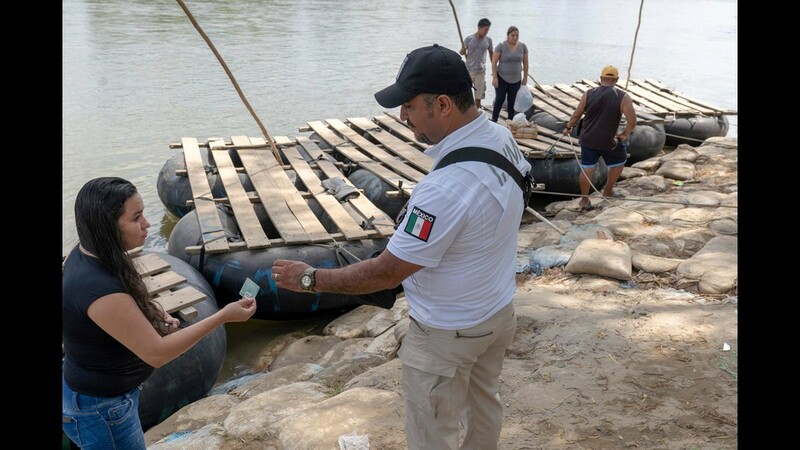 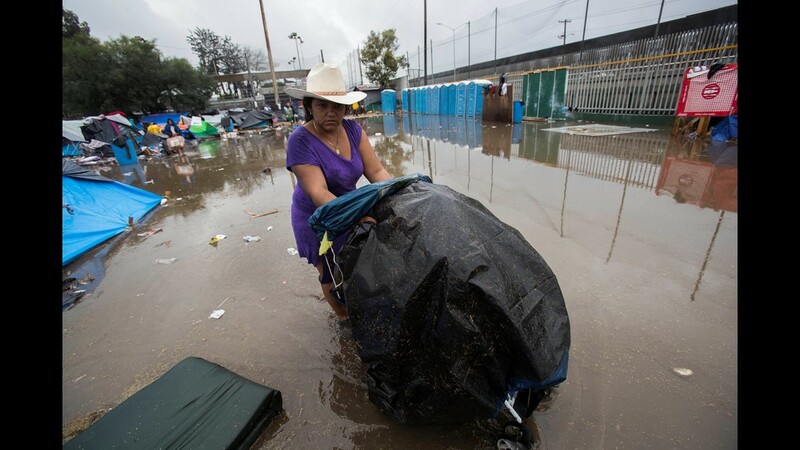 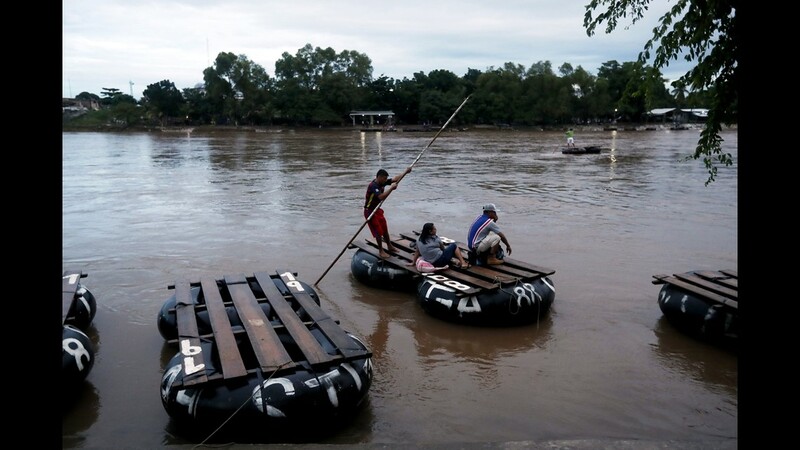 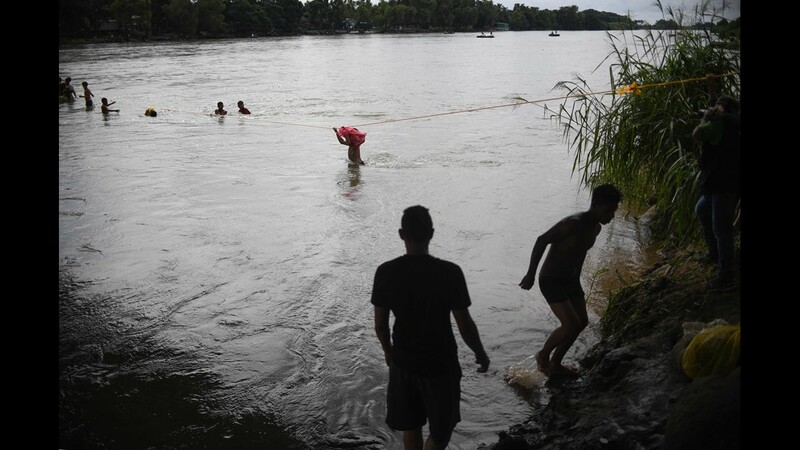 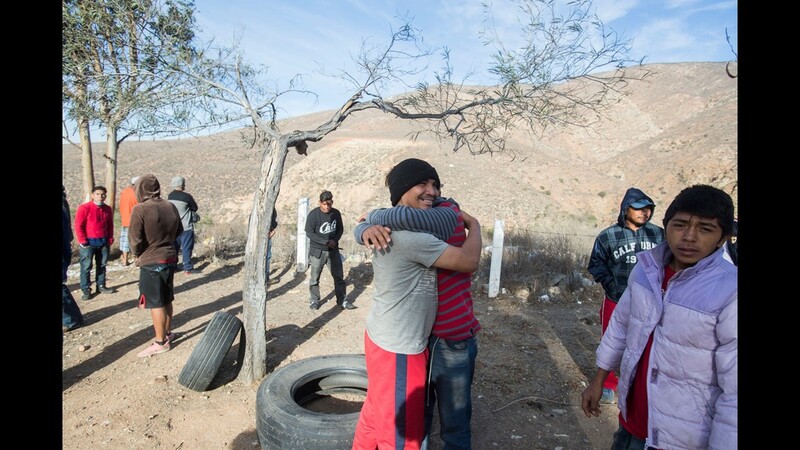 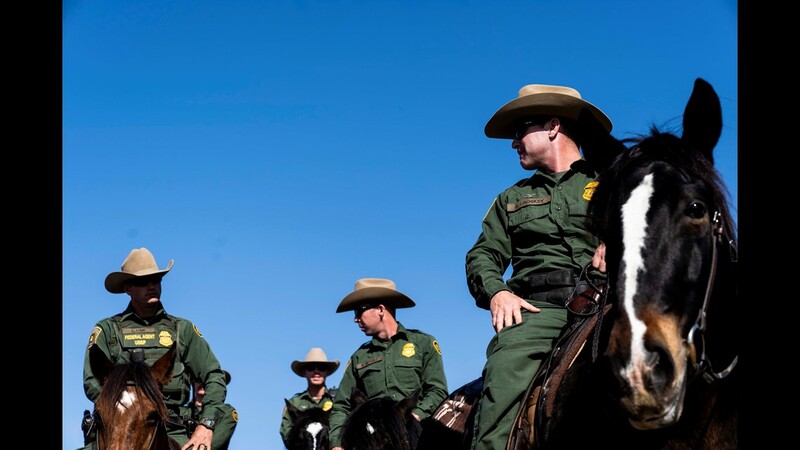 CBP deployed 500 officers from other field offices, 250 members of the special operations group and 300 Border Patrol agents from other sectors, including the northern border, to help in the San Diego area. 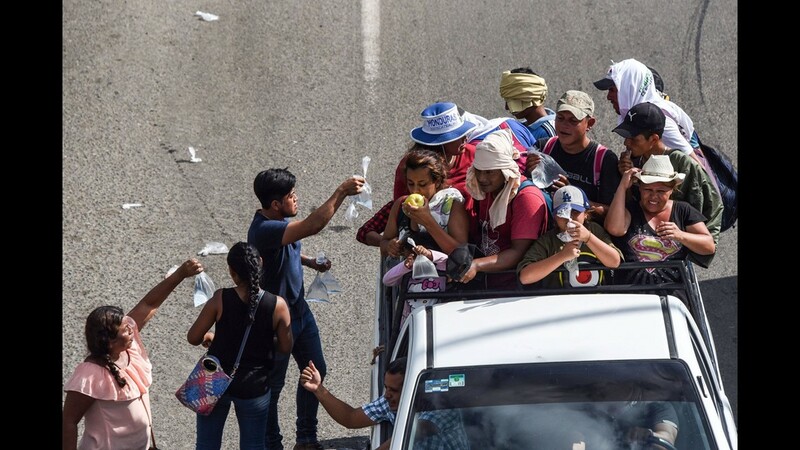 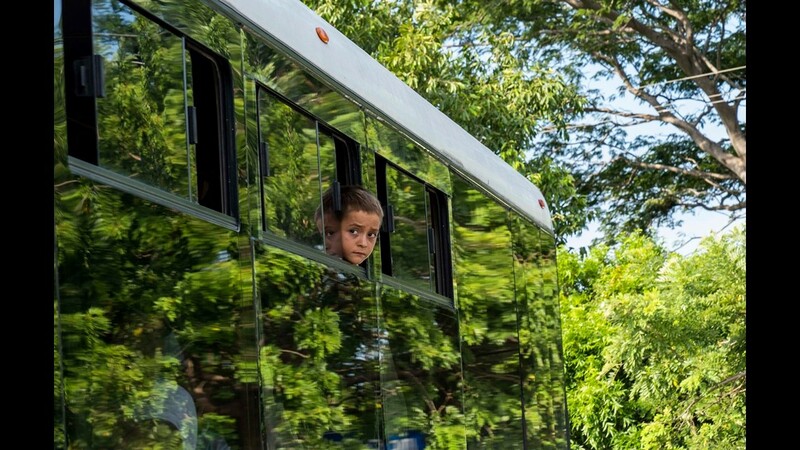 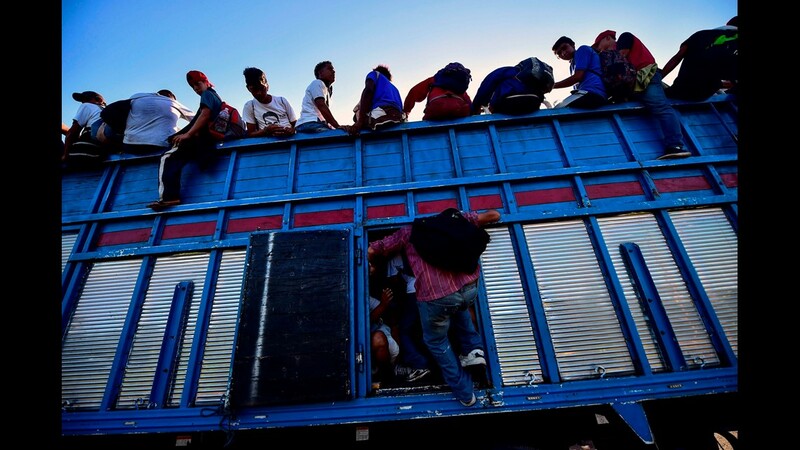 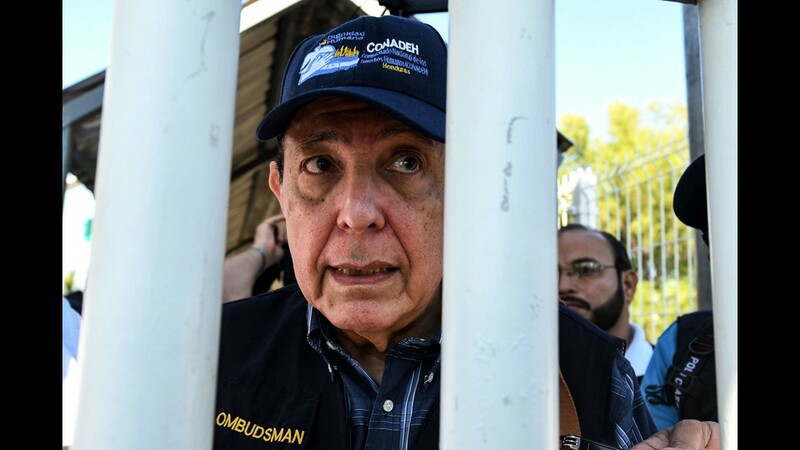 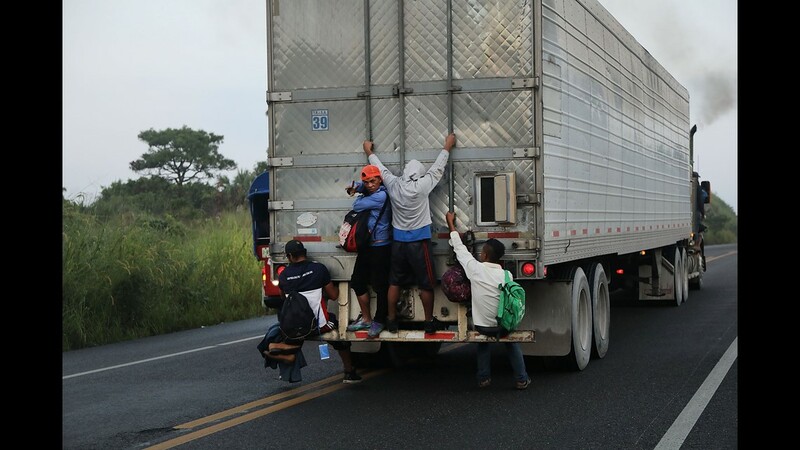 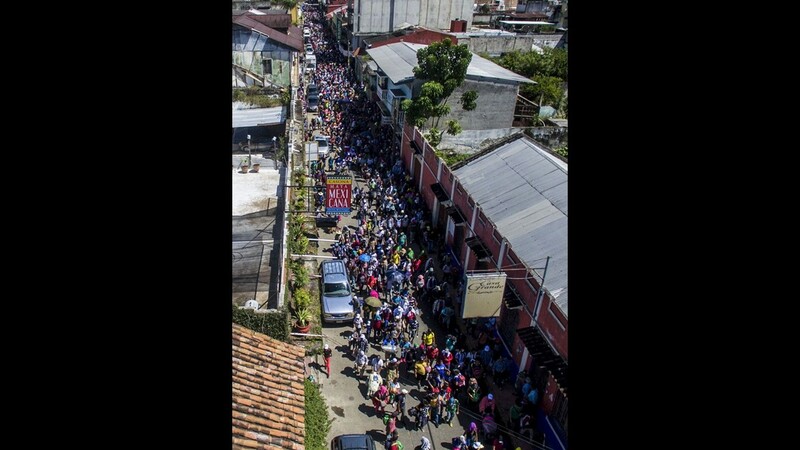 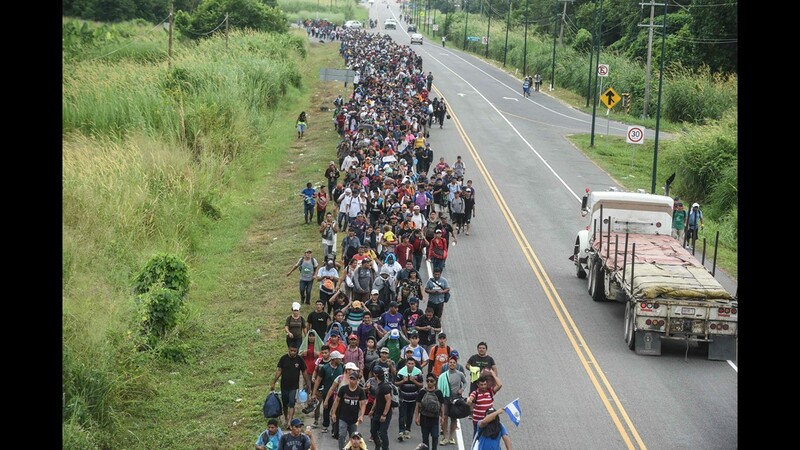 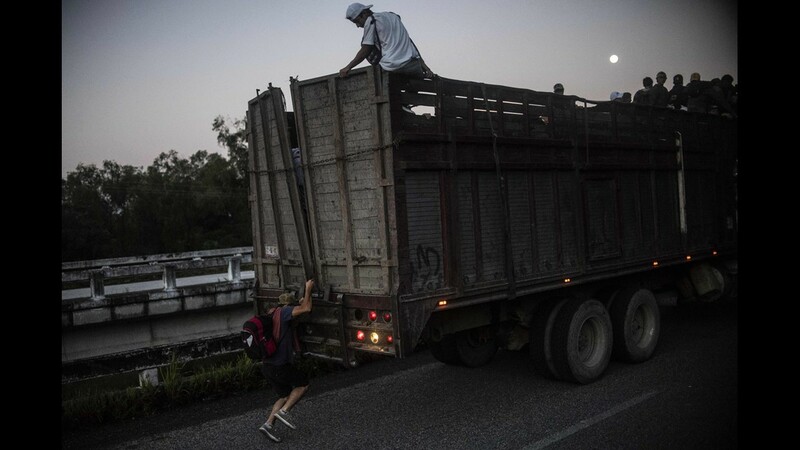 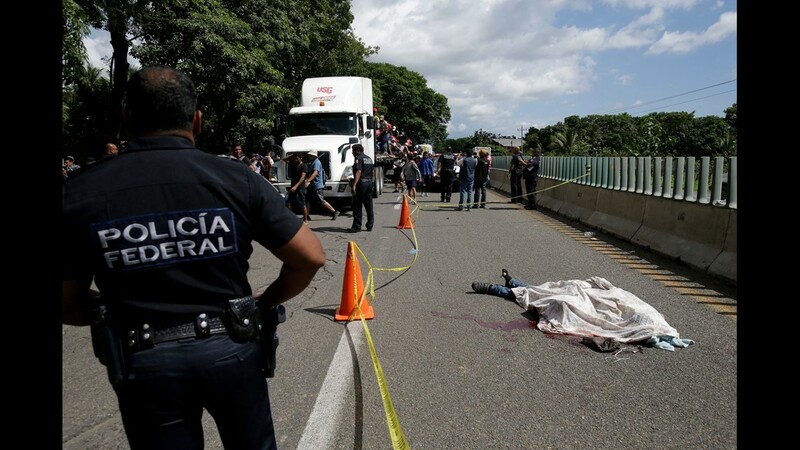 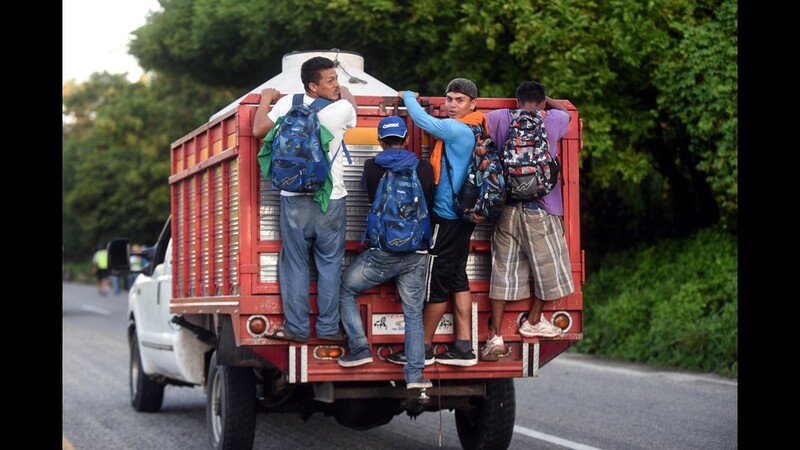 Are criminals traveling with the caravan? 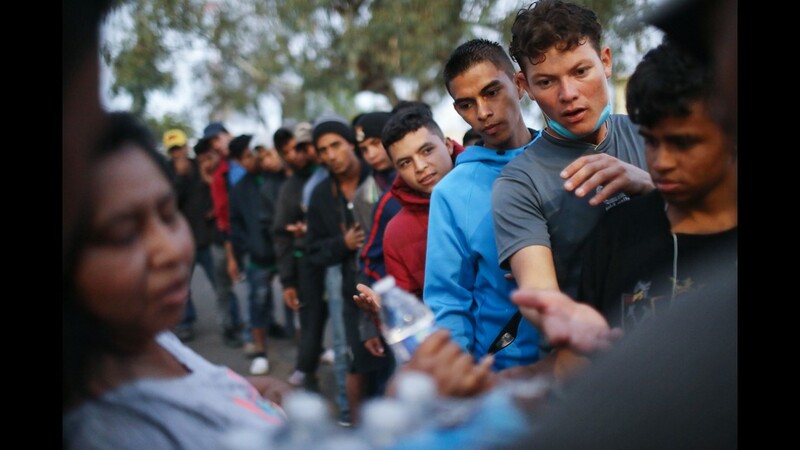 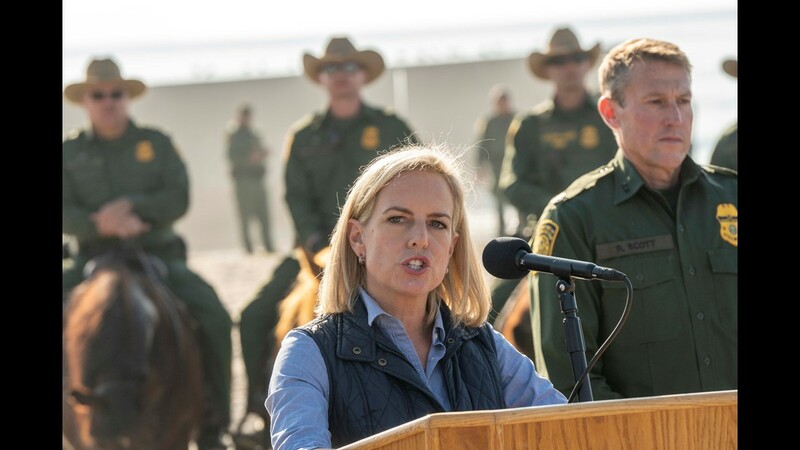 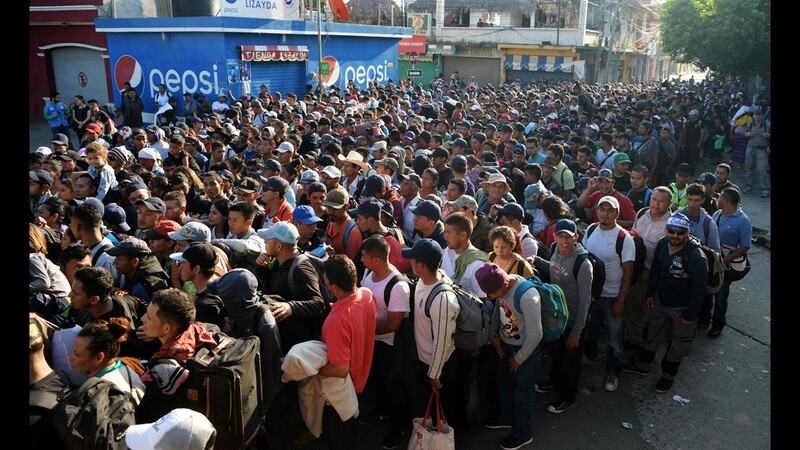 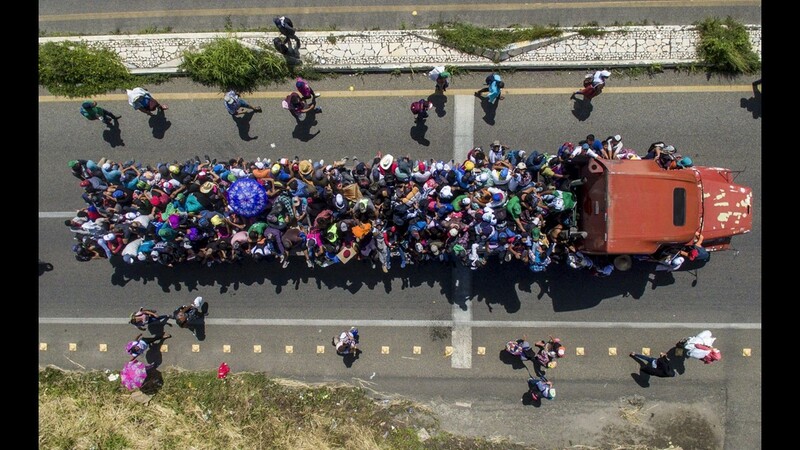 Homeland Security Secretary Kirstjen Nielsen said last week while visiting San Diego, and McAleenan repeated Monday, that 500 criminals are suspected of traveling with the caravan. 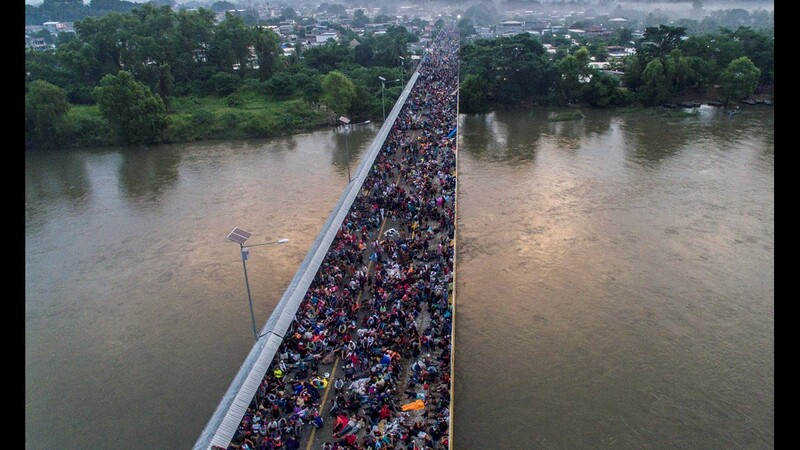 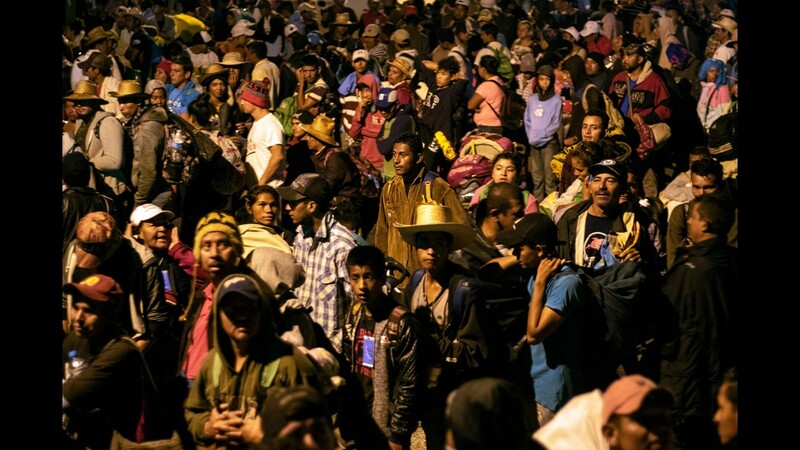 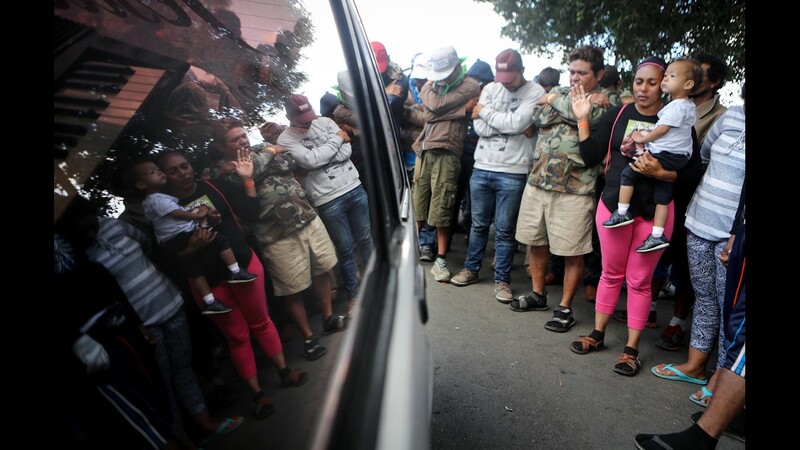 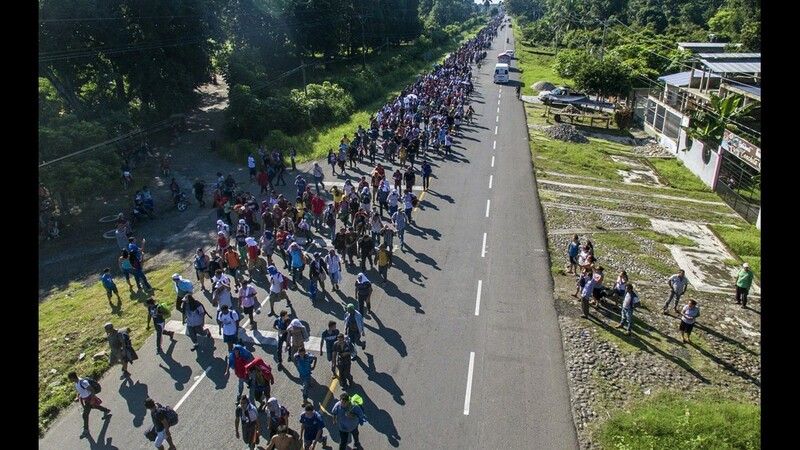 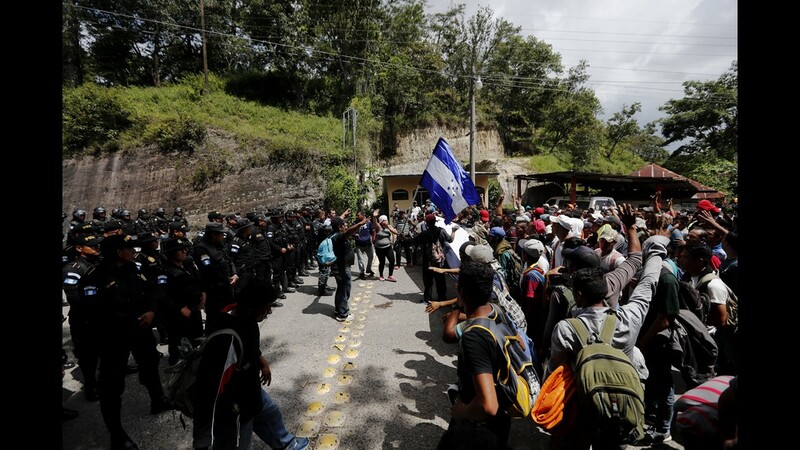 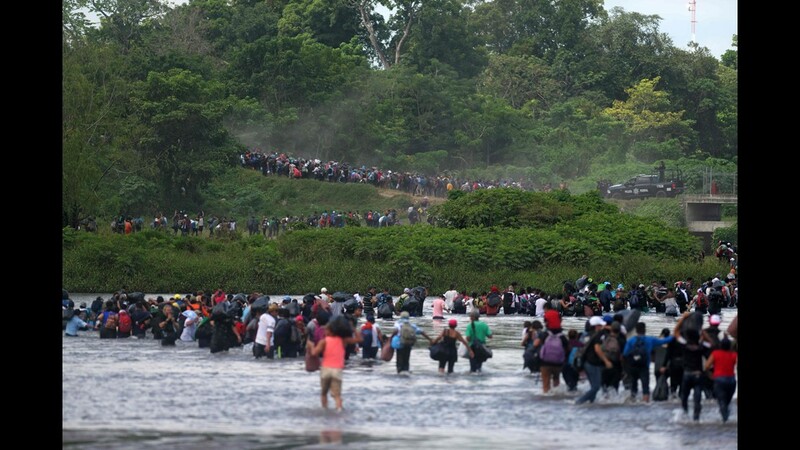 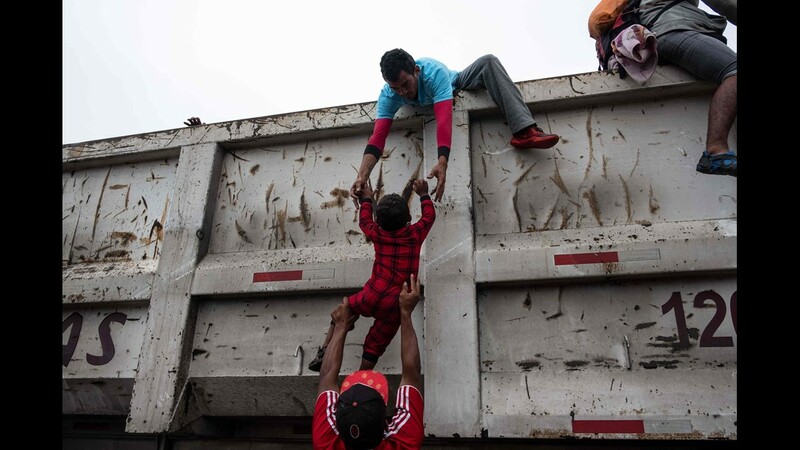 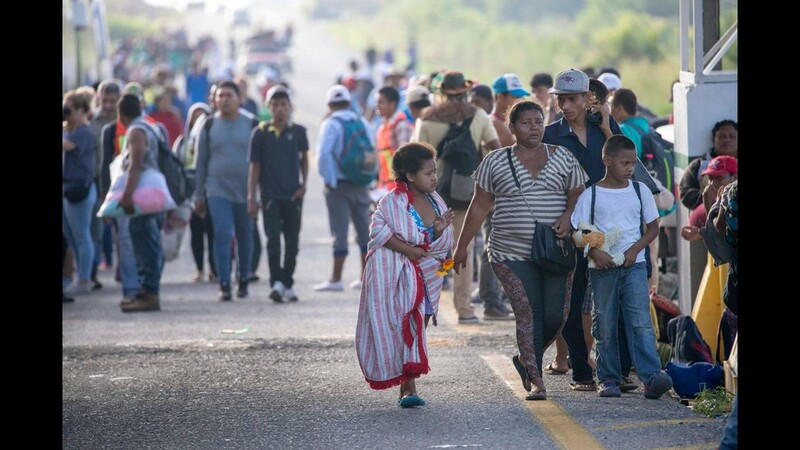 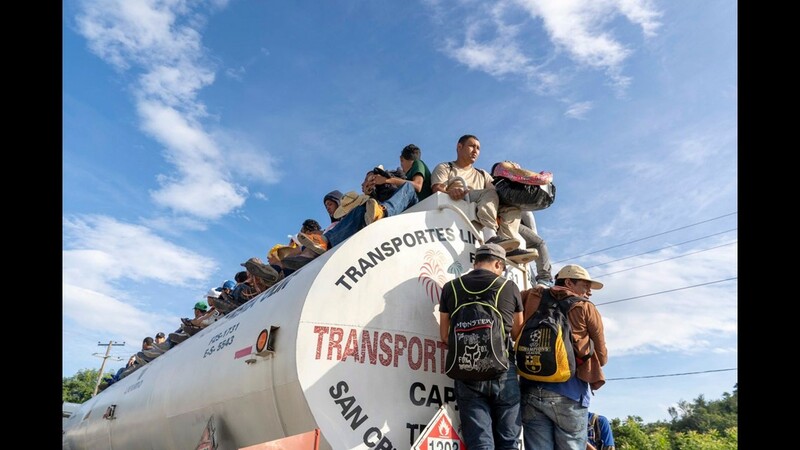 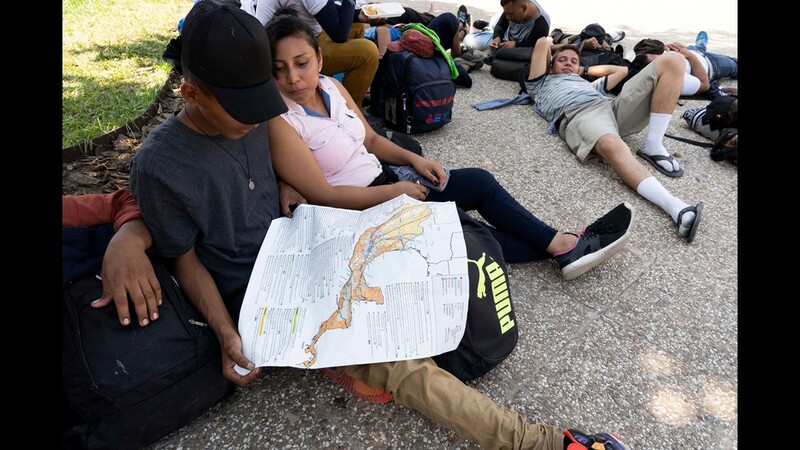 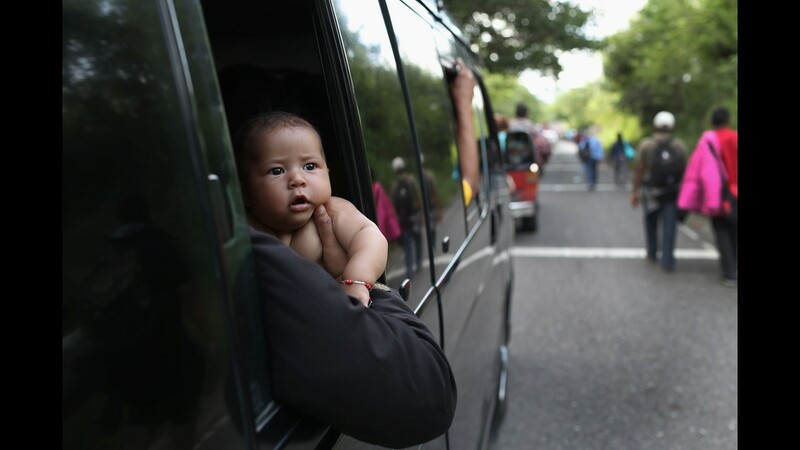 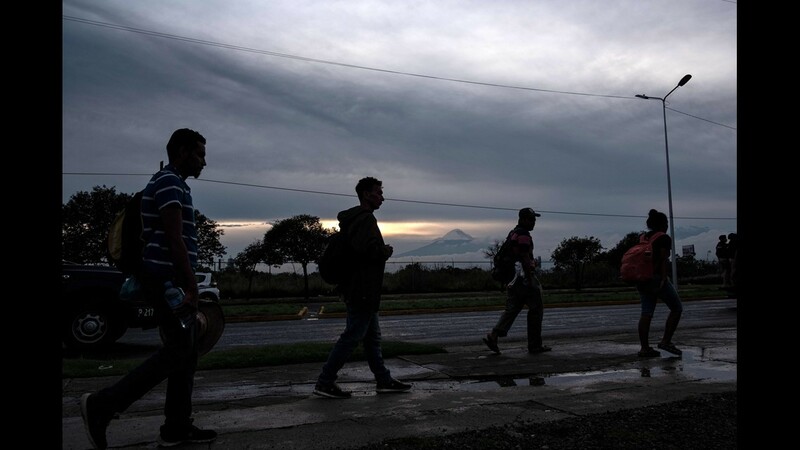 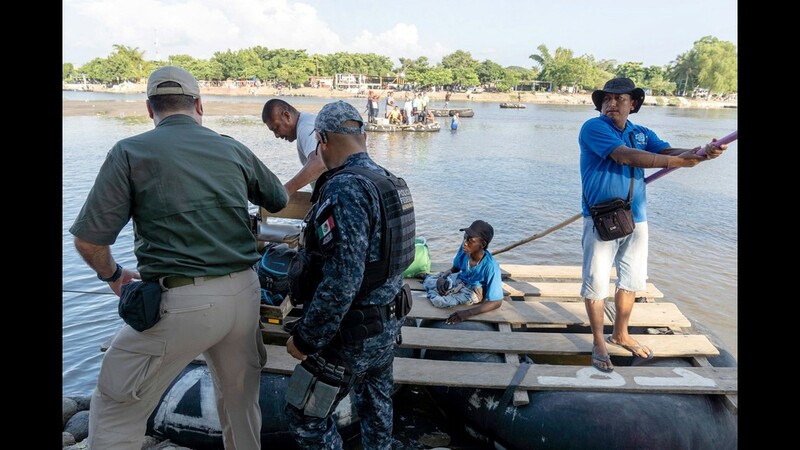 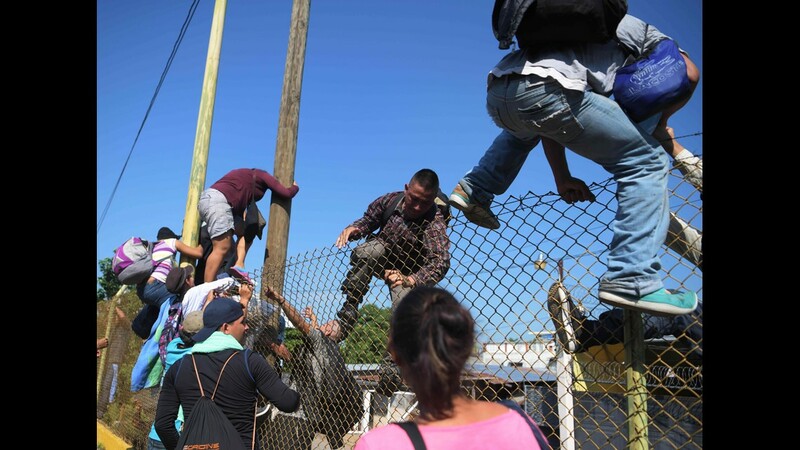 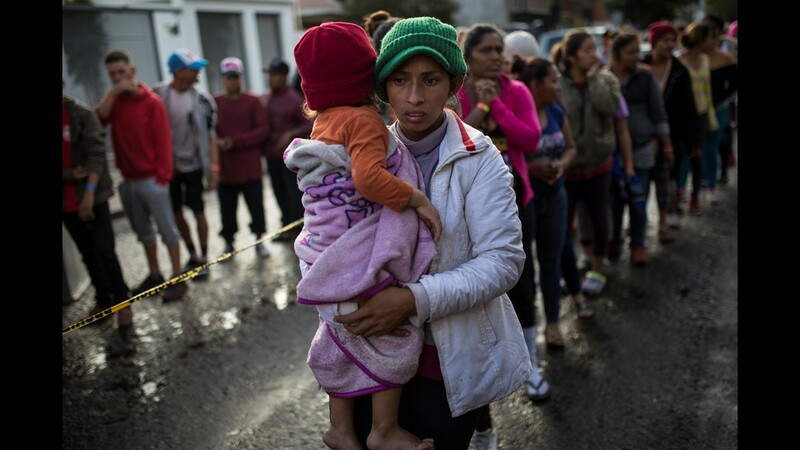 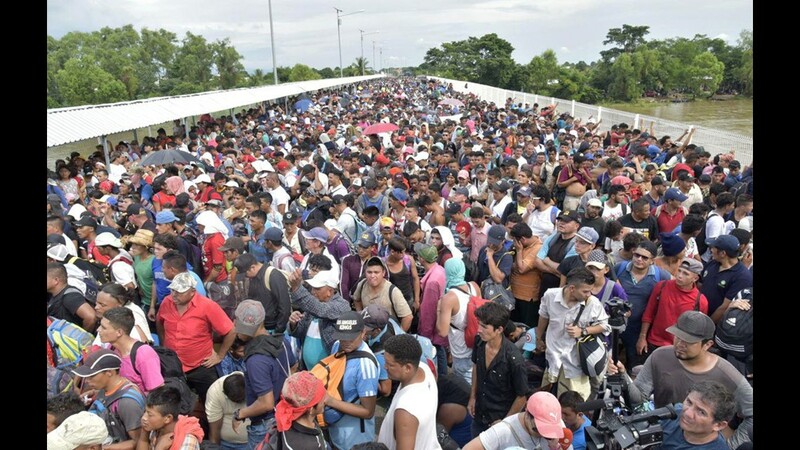 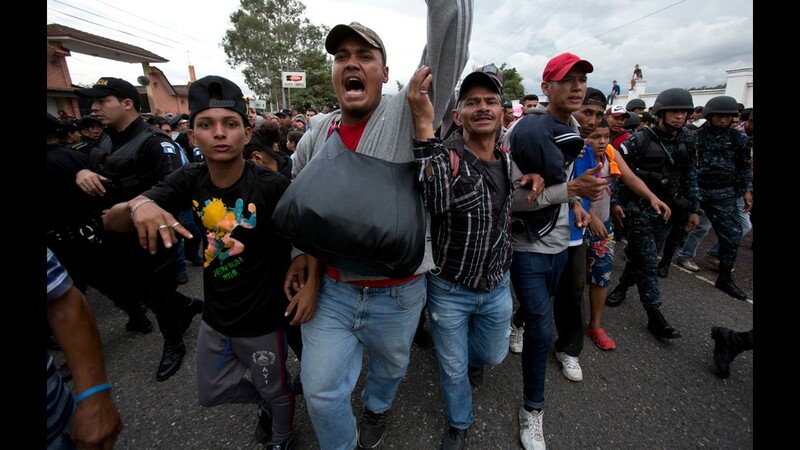 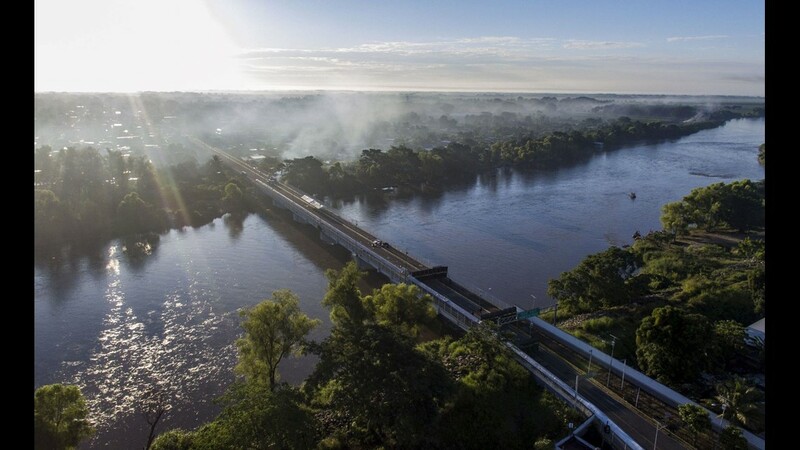 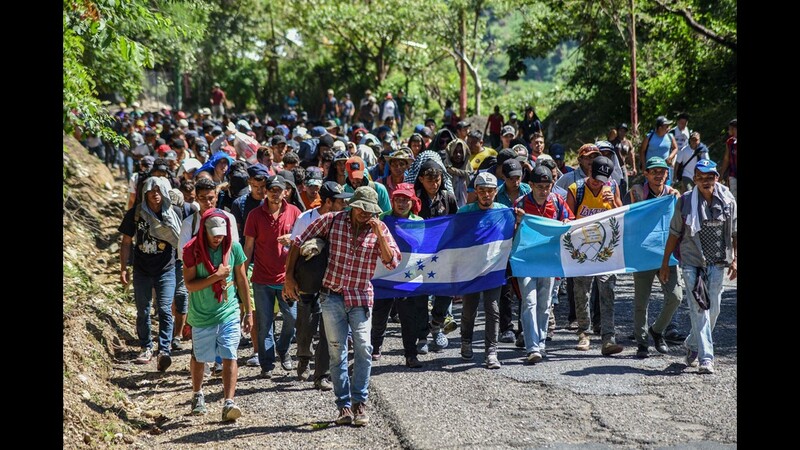 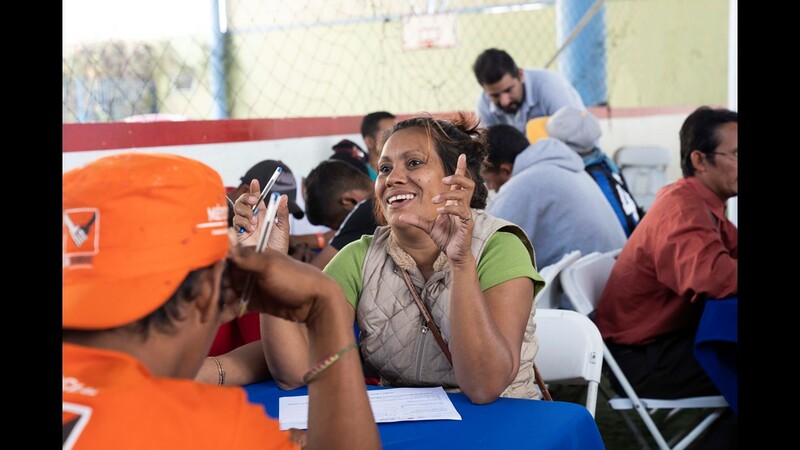 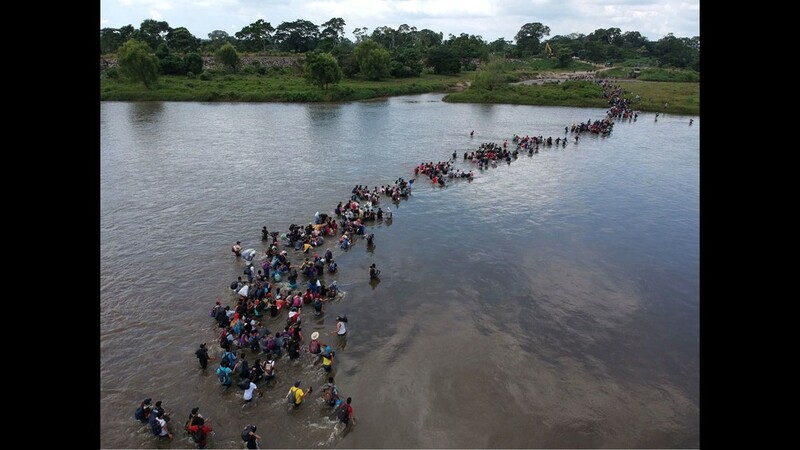 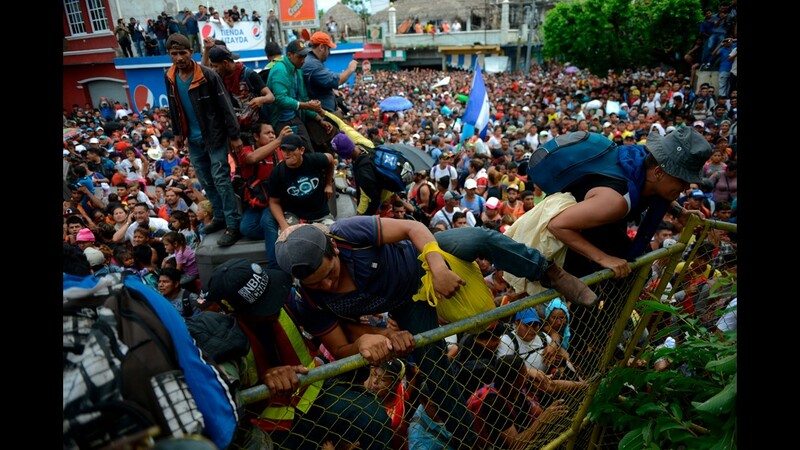 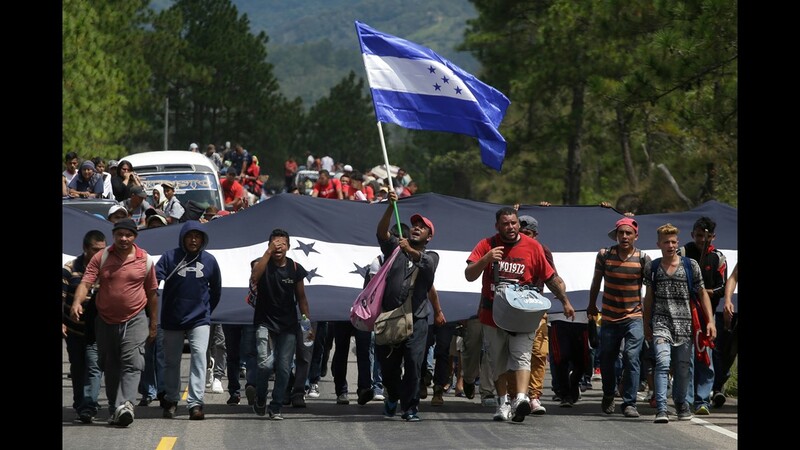 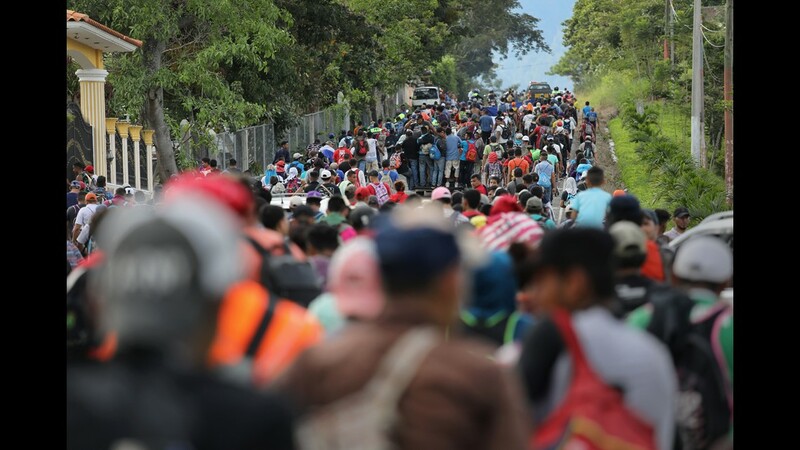 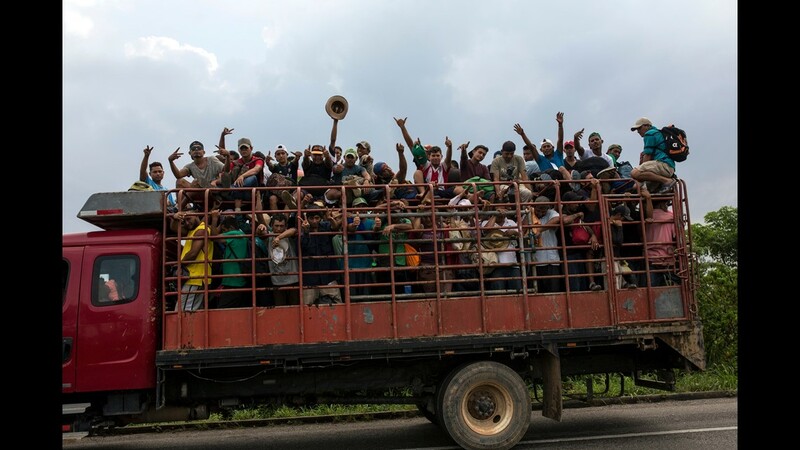 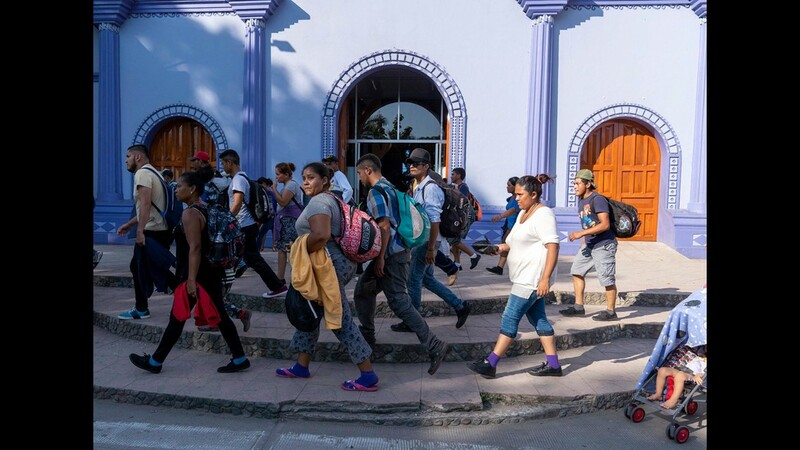 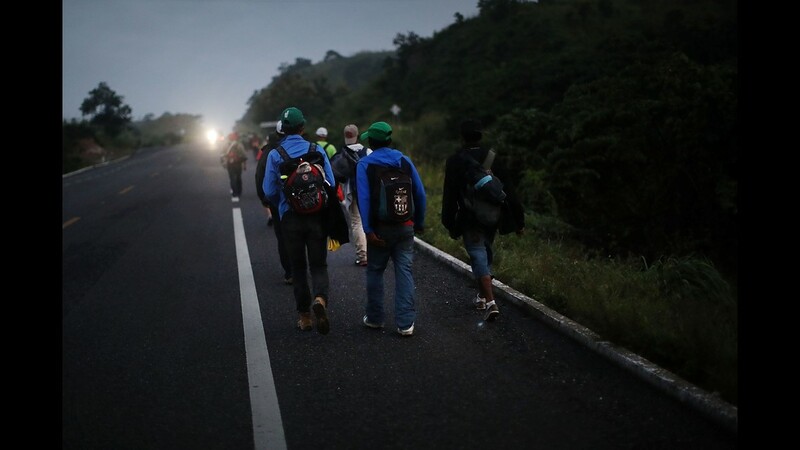 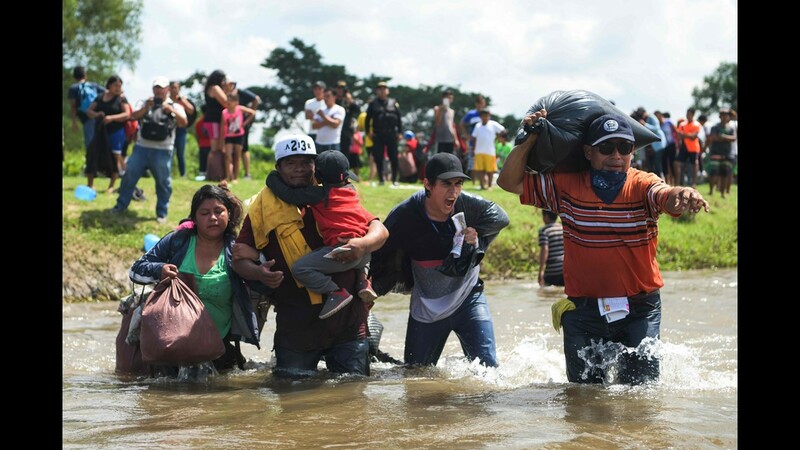 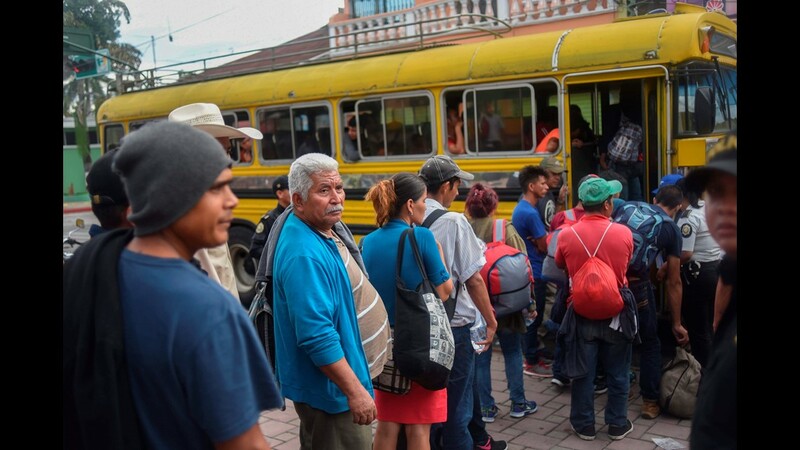 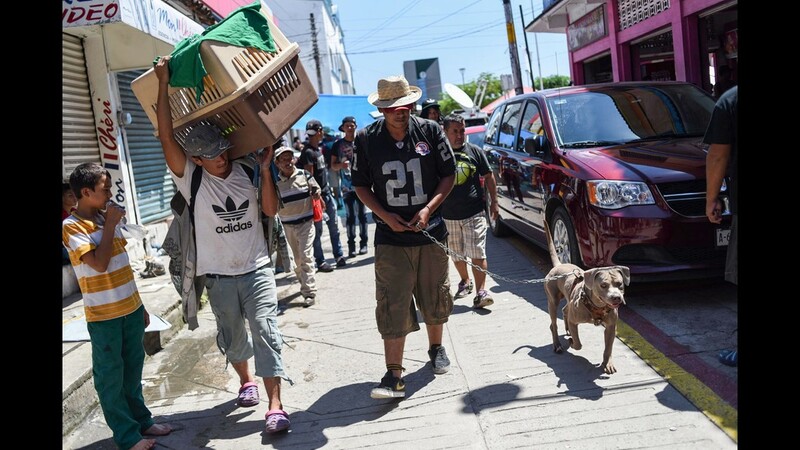 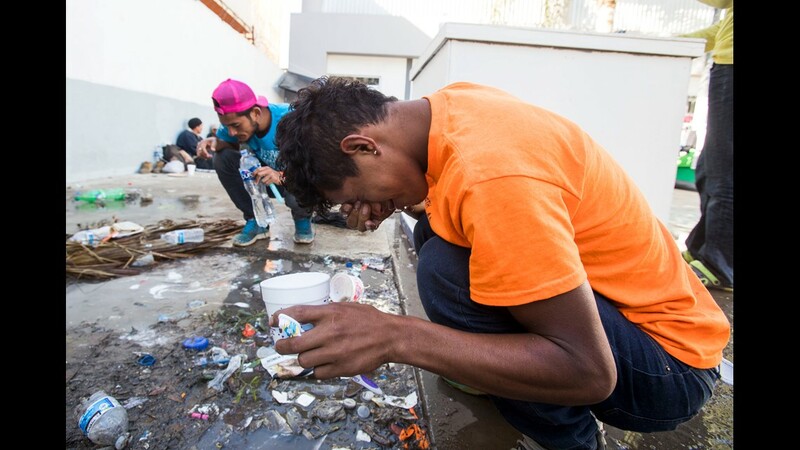 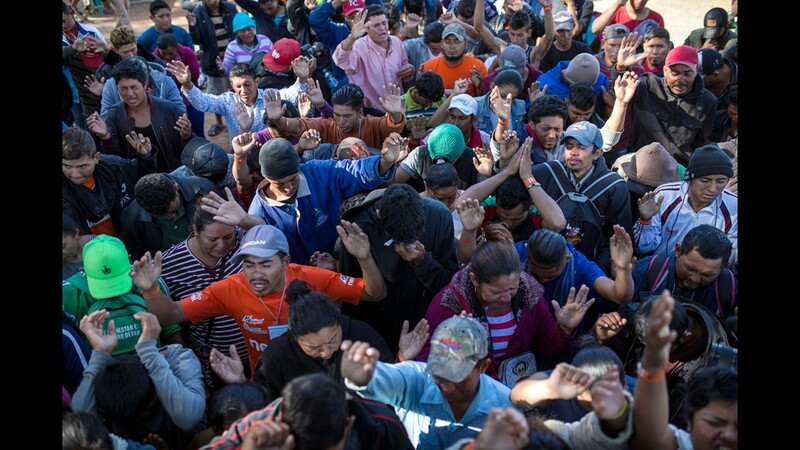 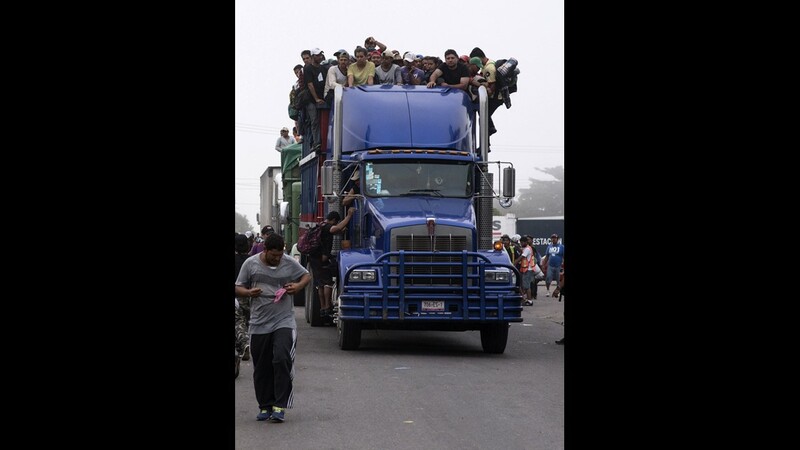 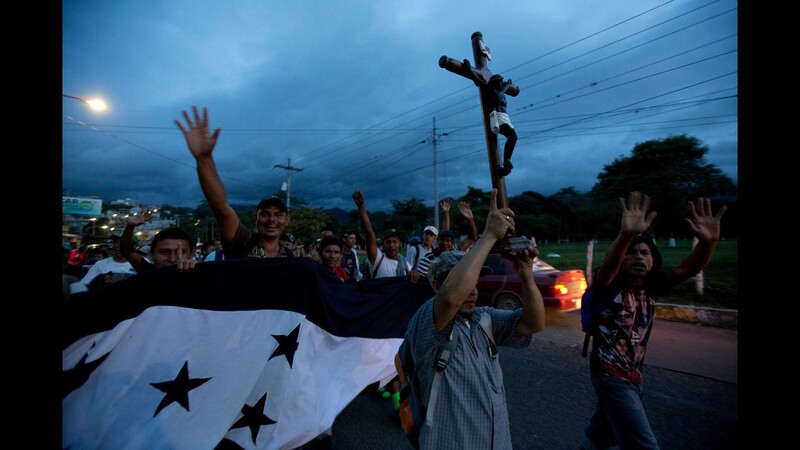 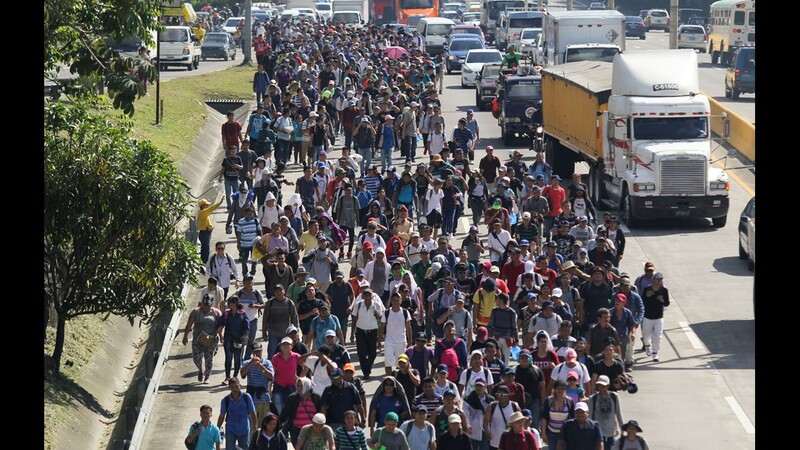 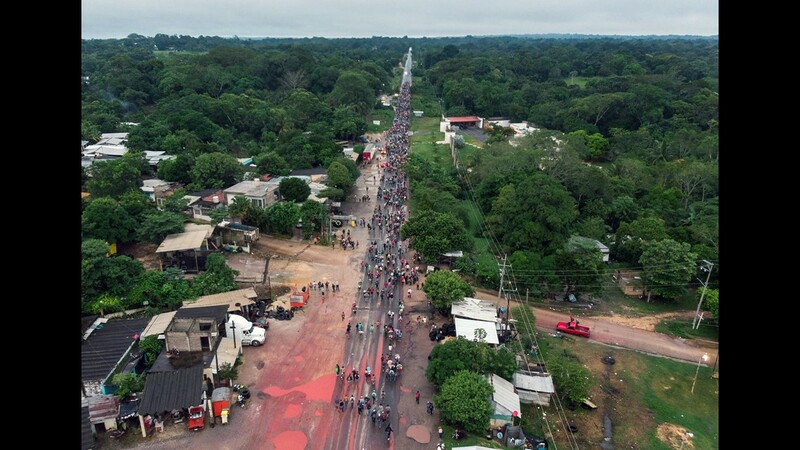 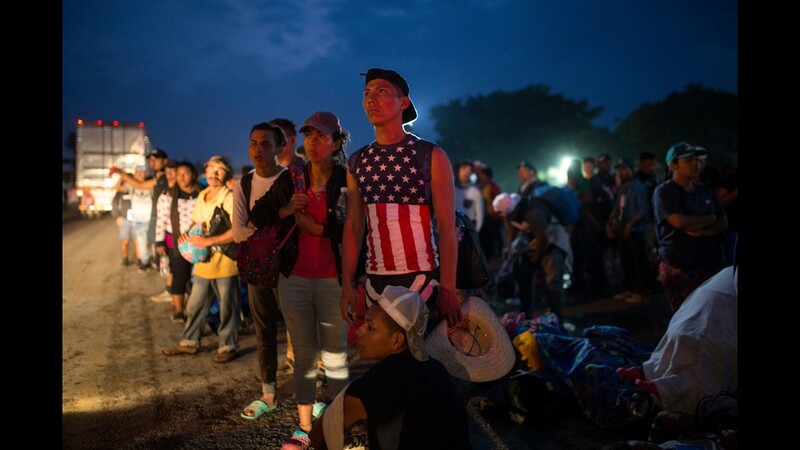 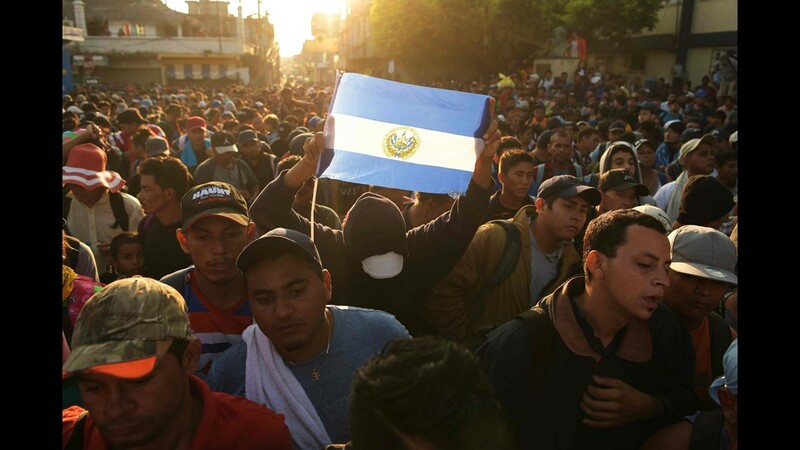 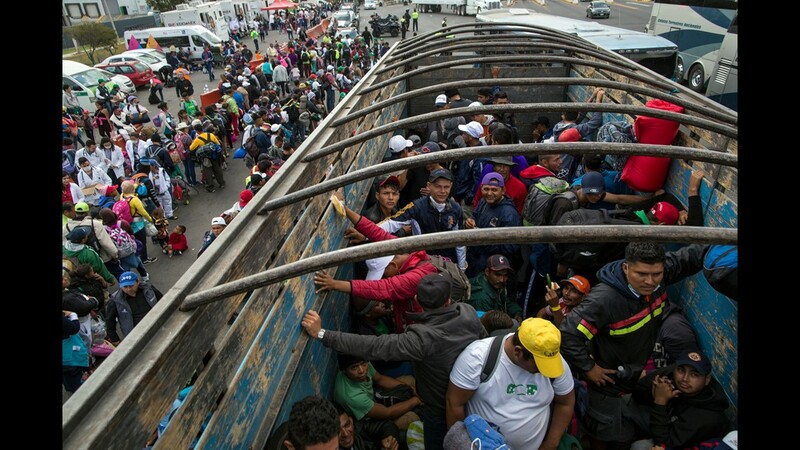 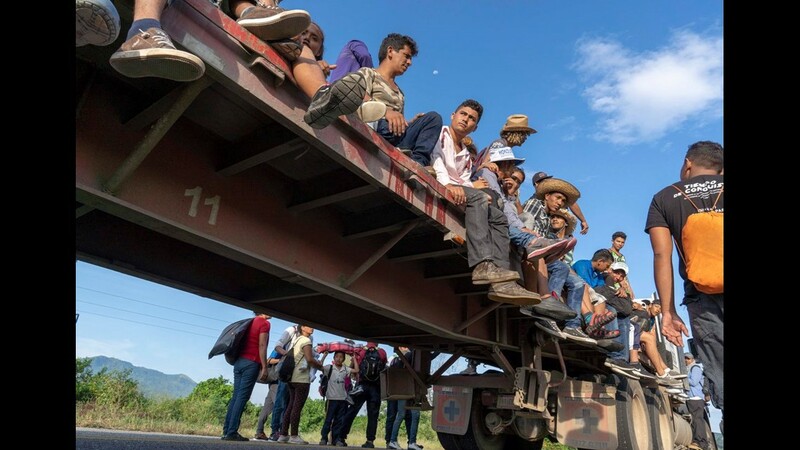 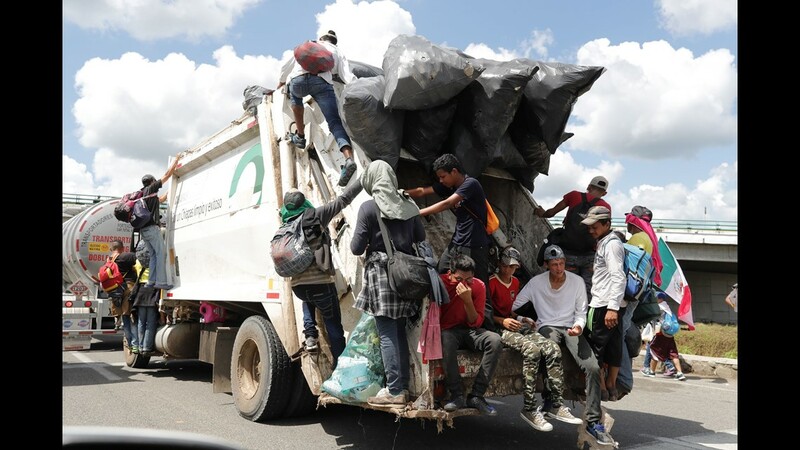 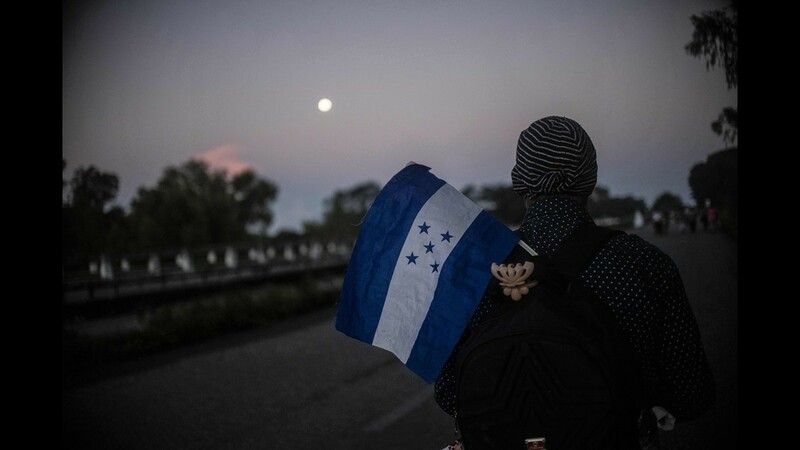 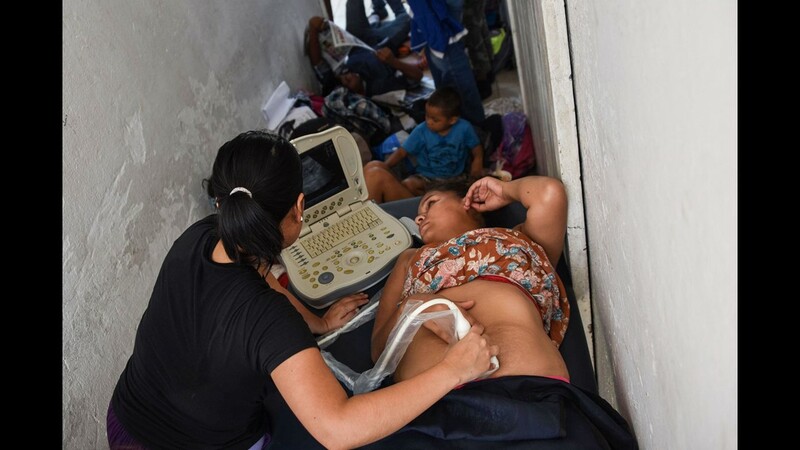 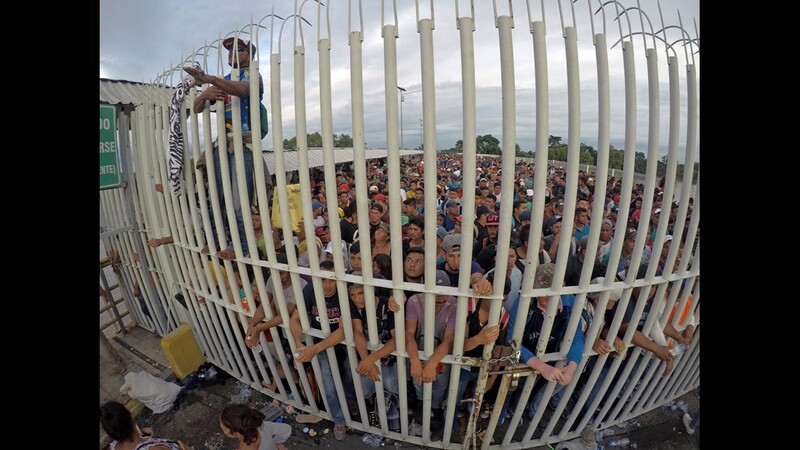 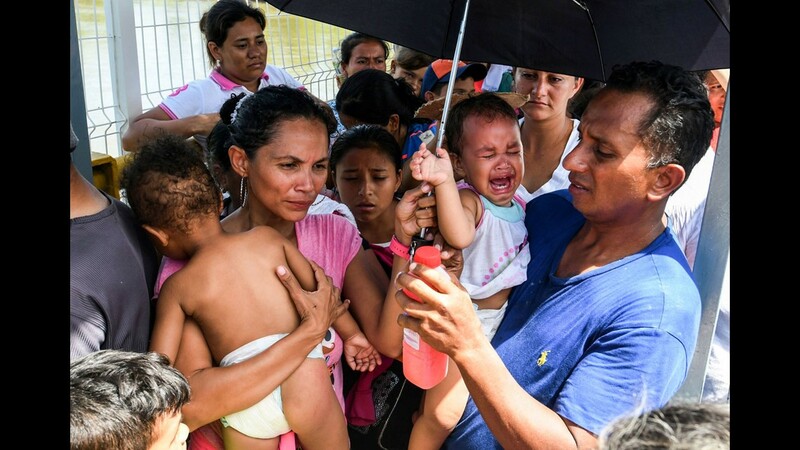 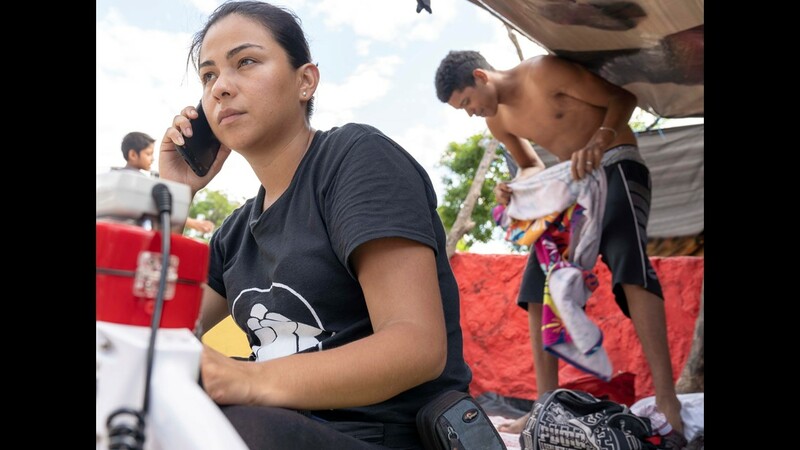 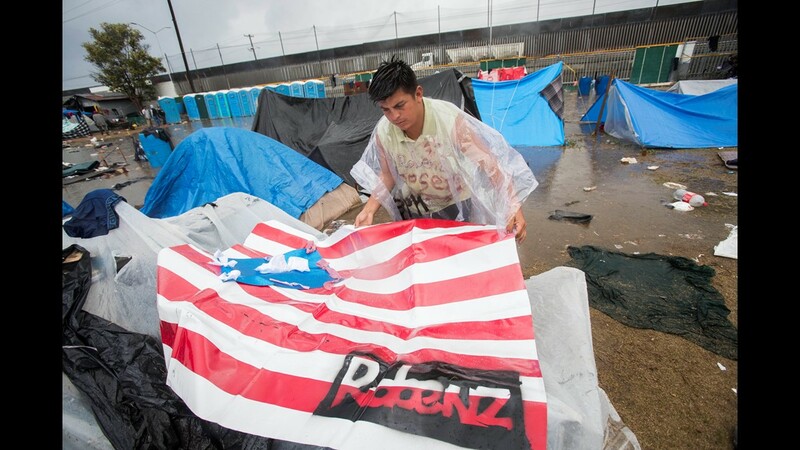 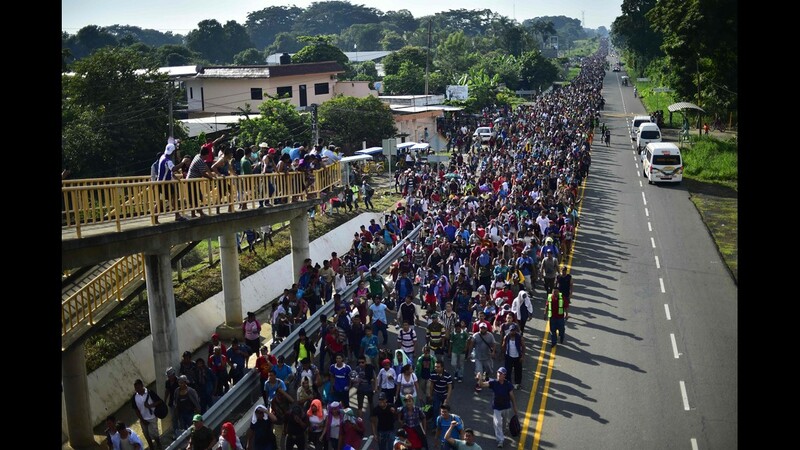 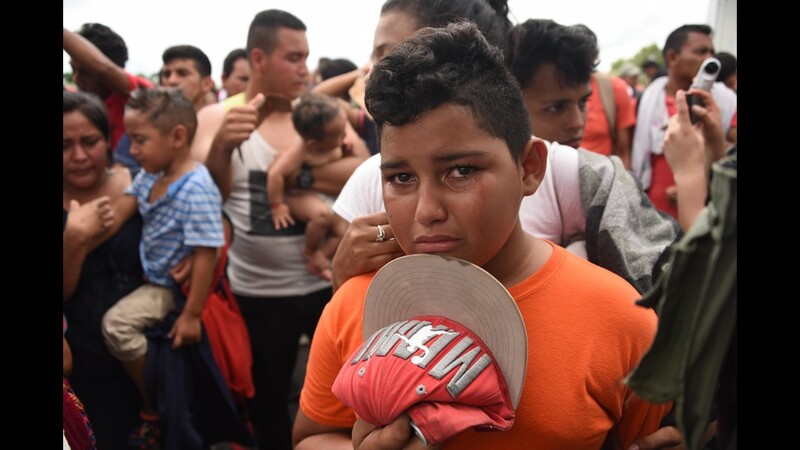 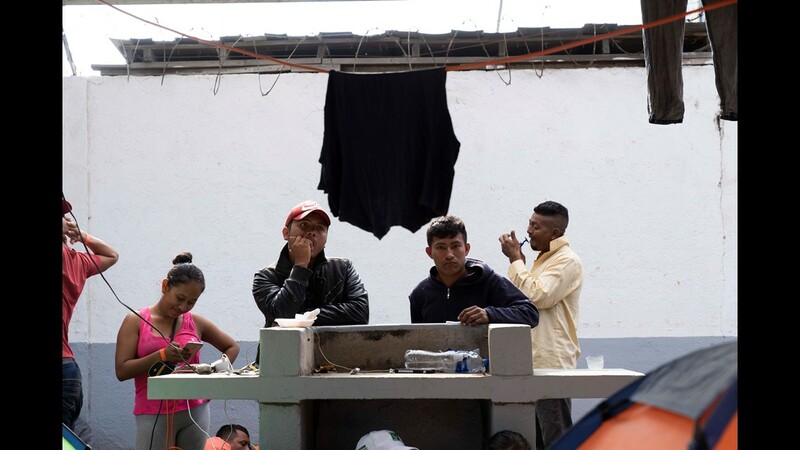 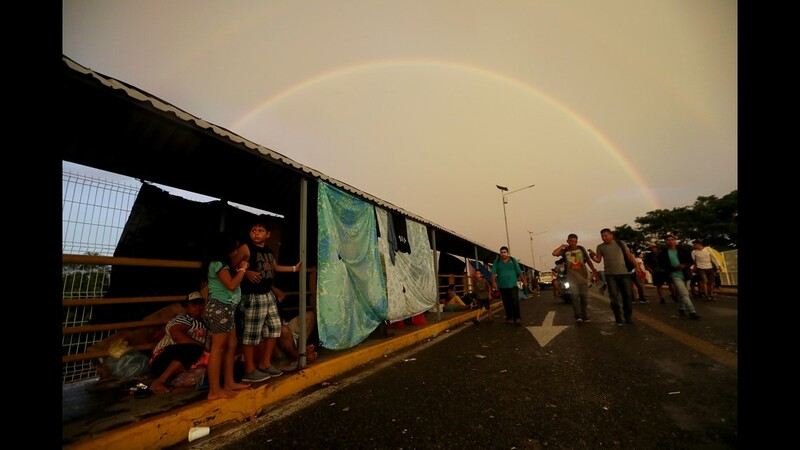 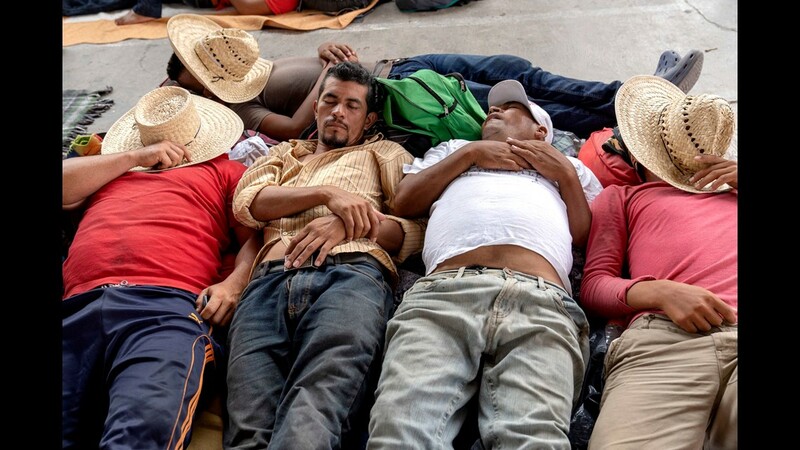 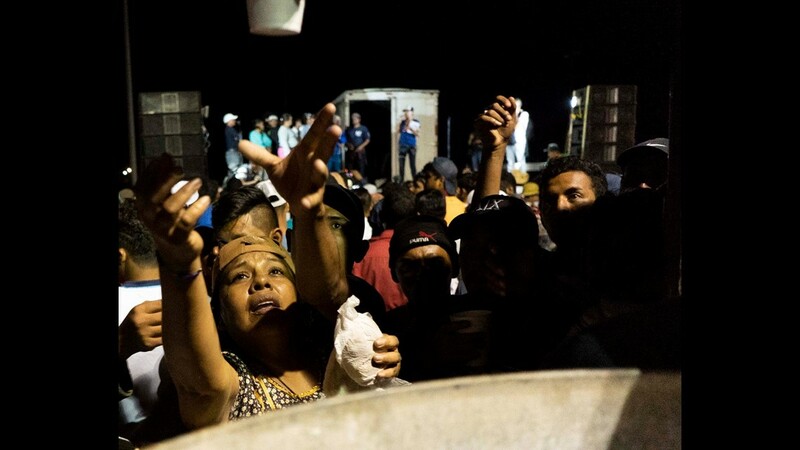 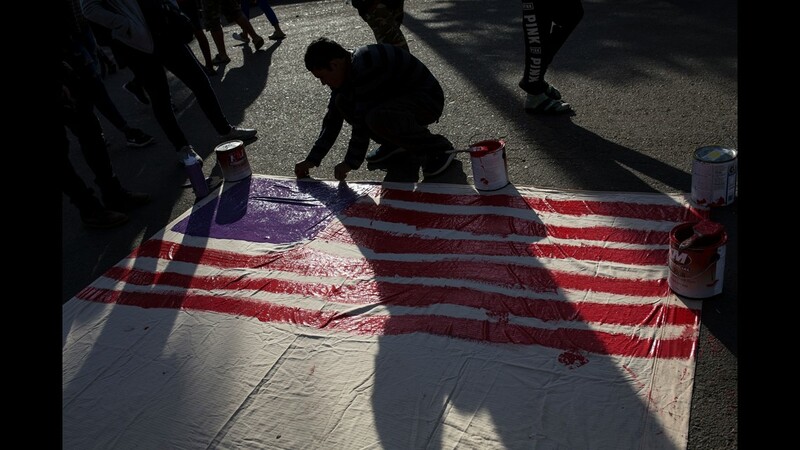 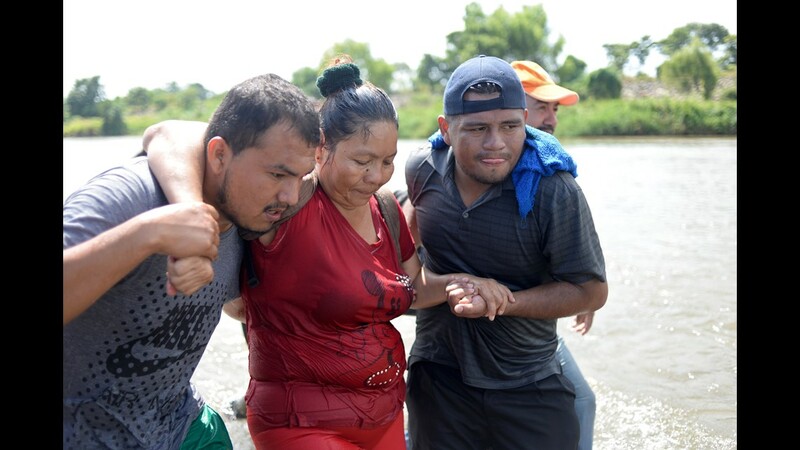 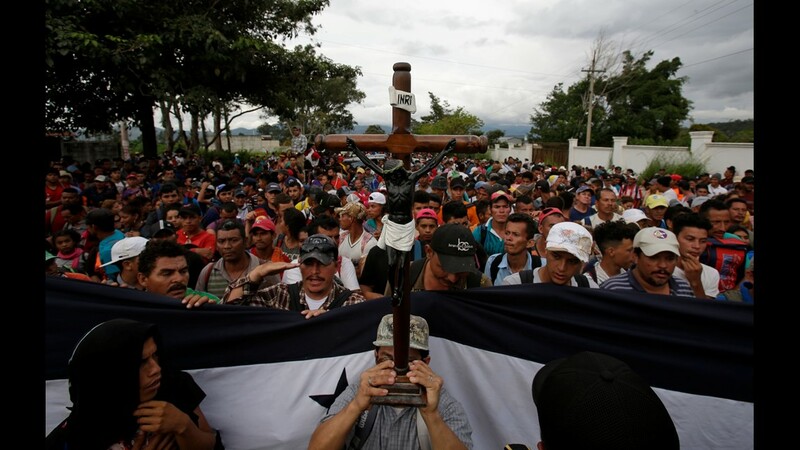 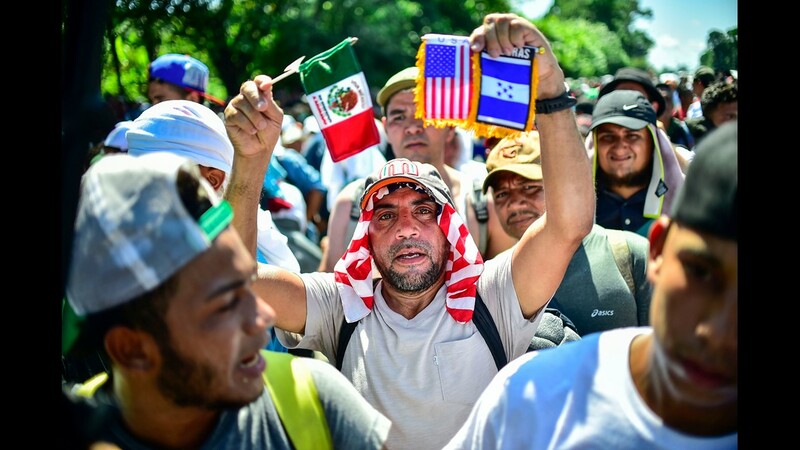 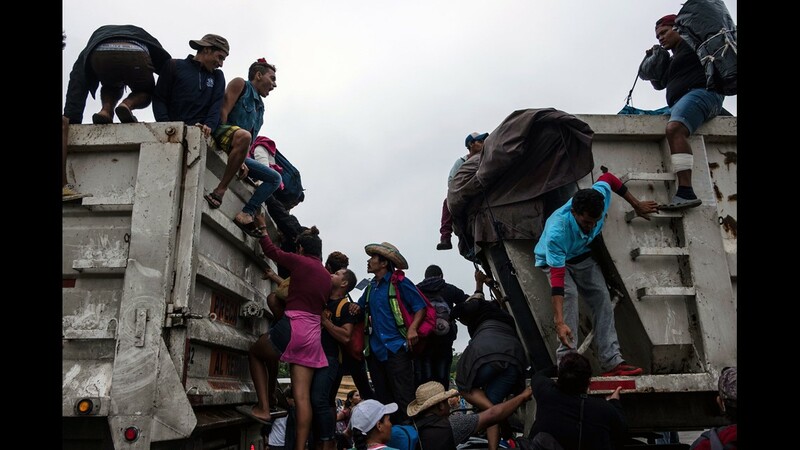 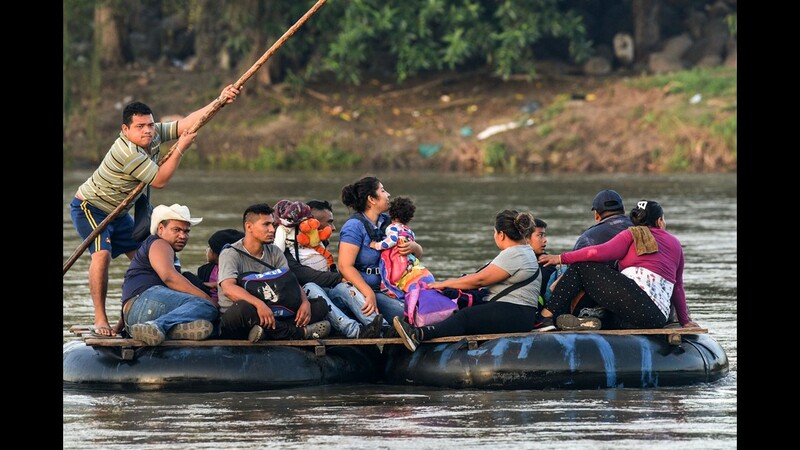 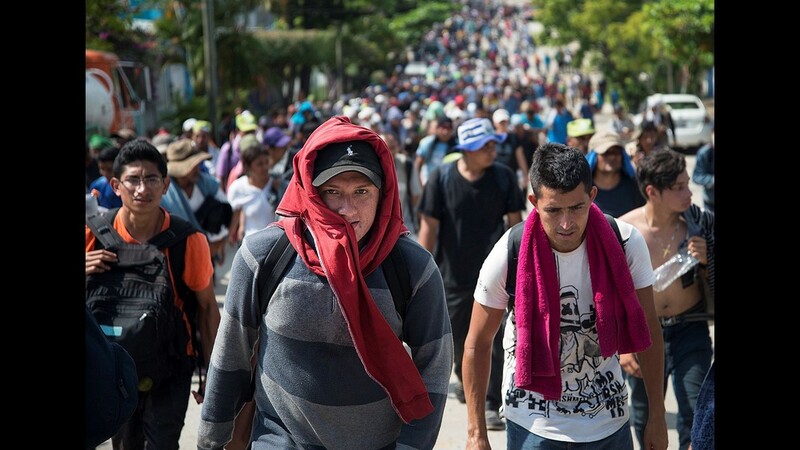 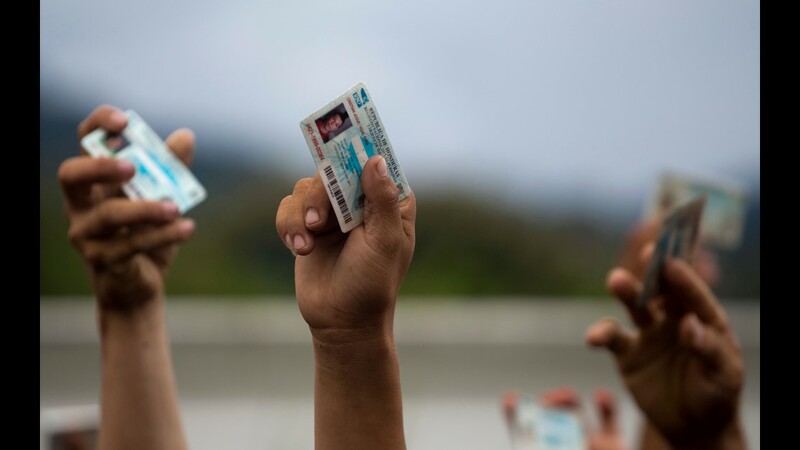 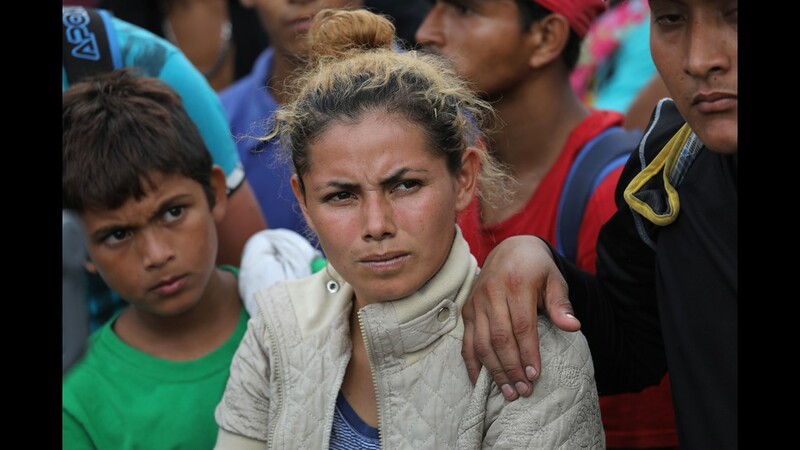 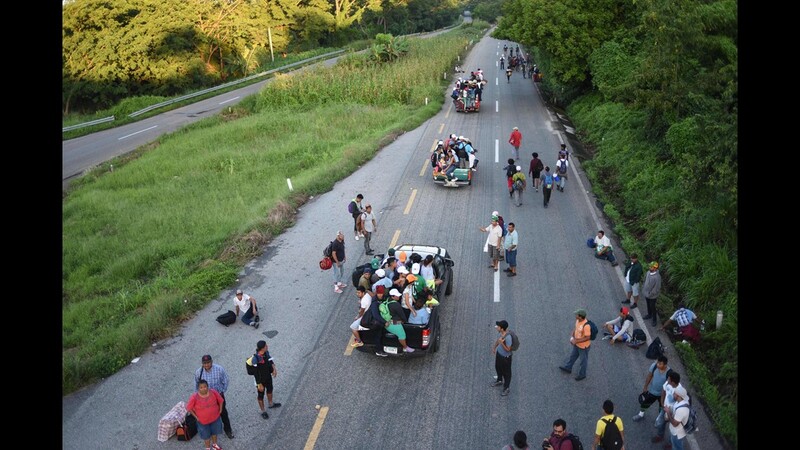 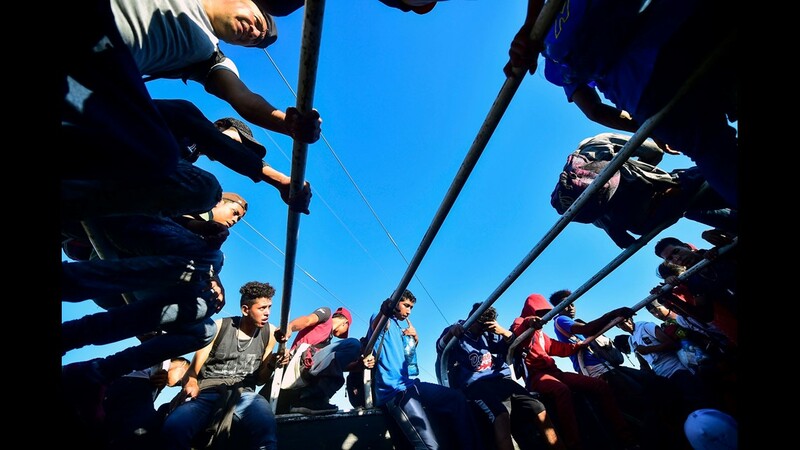 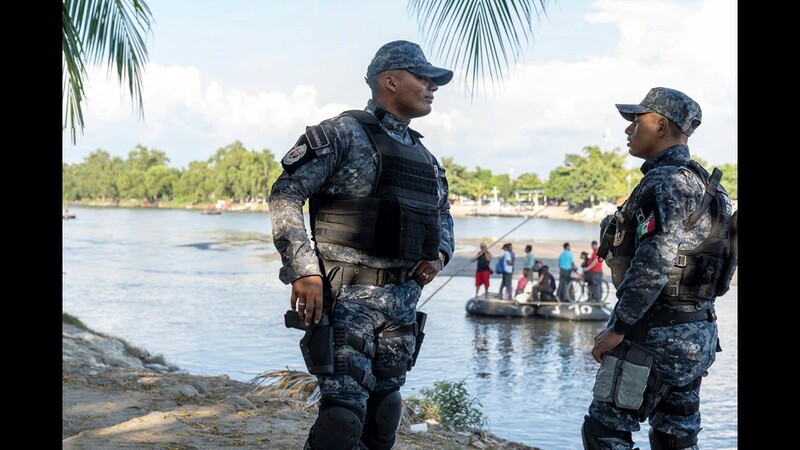 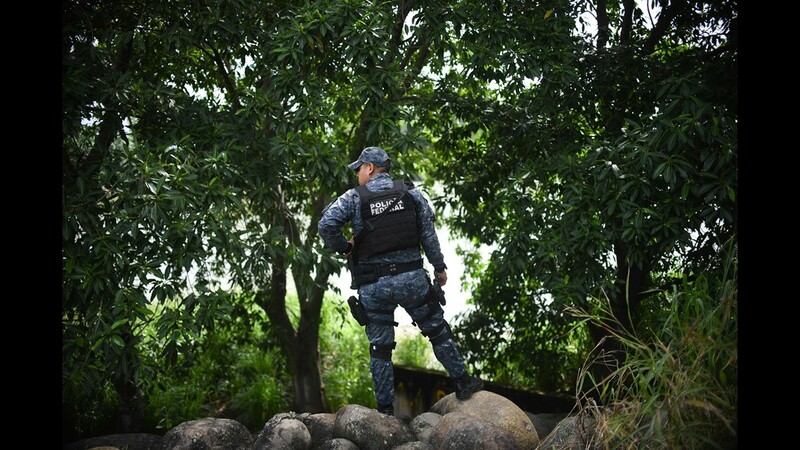 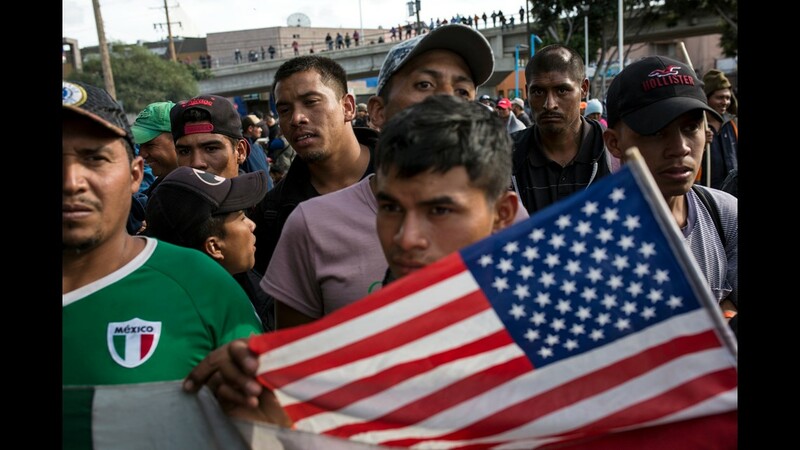 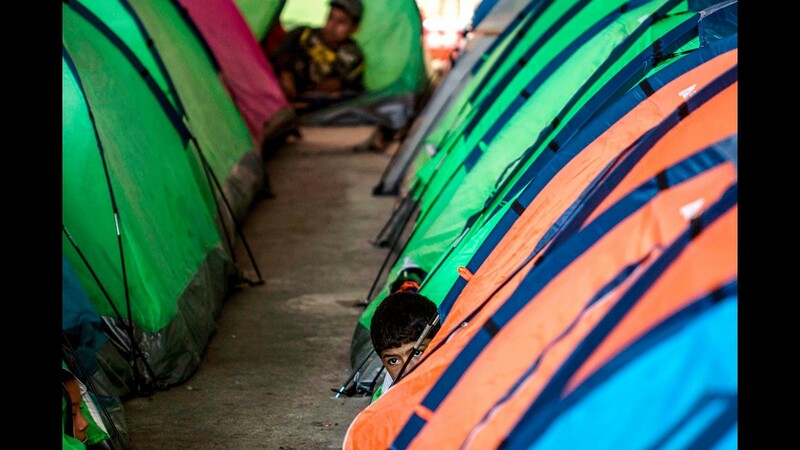 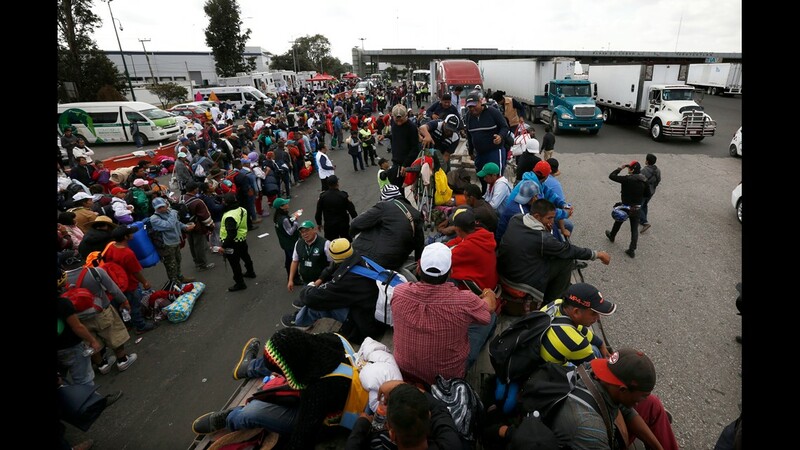 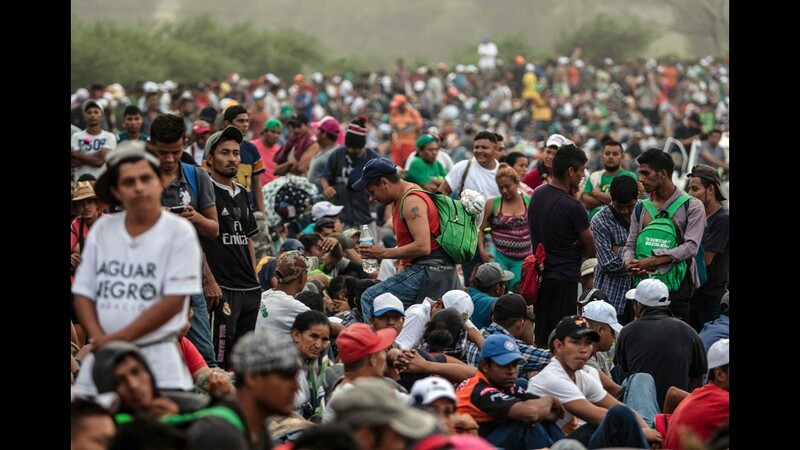 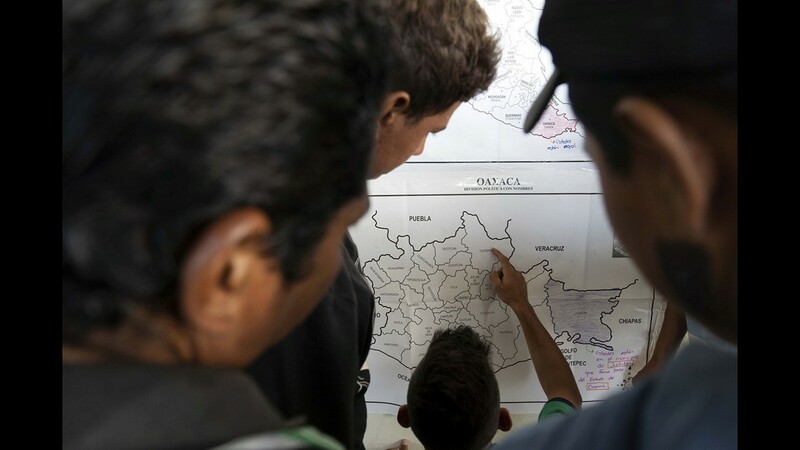 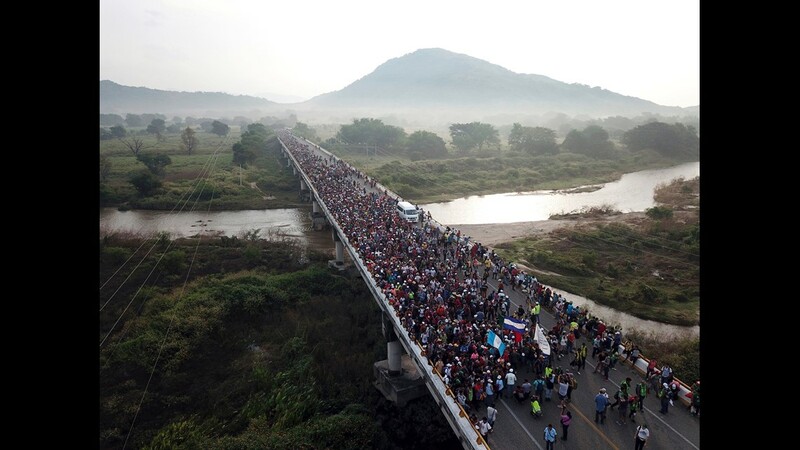 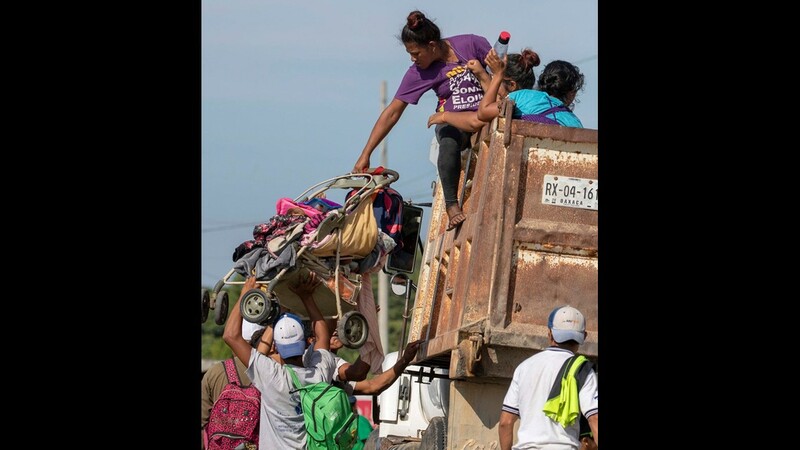 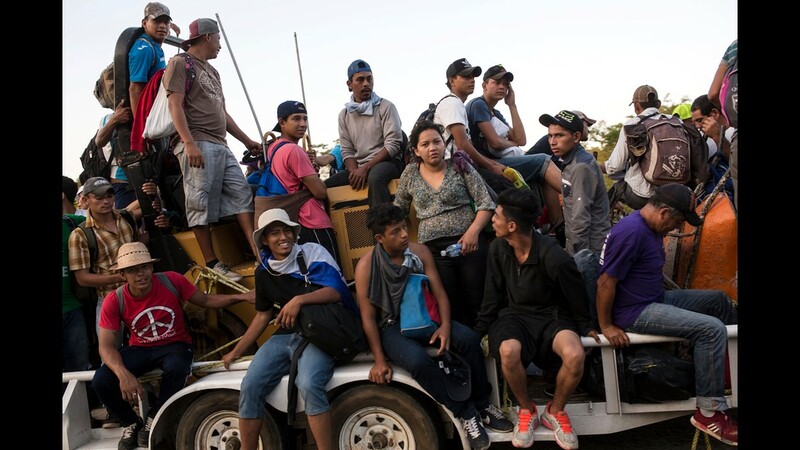 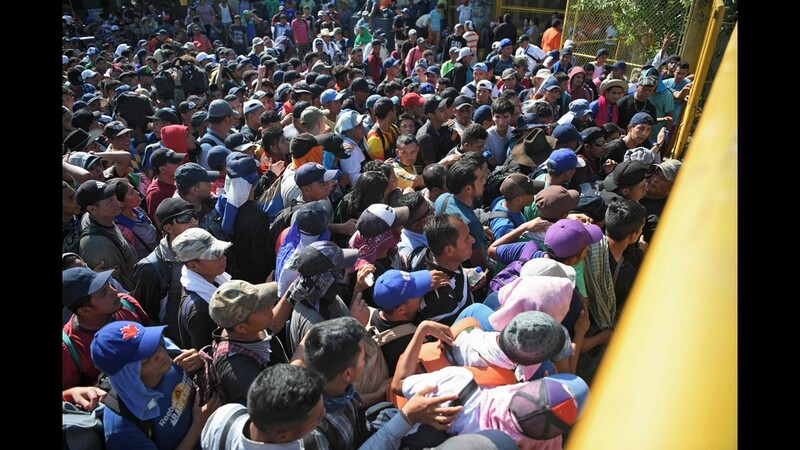 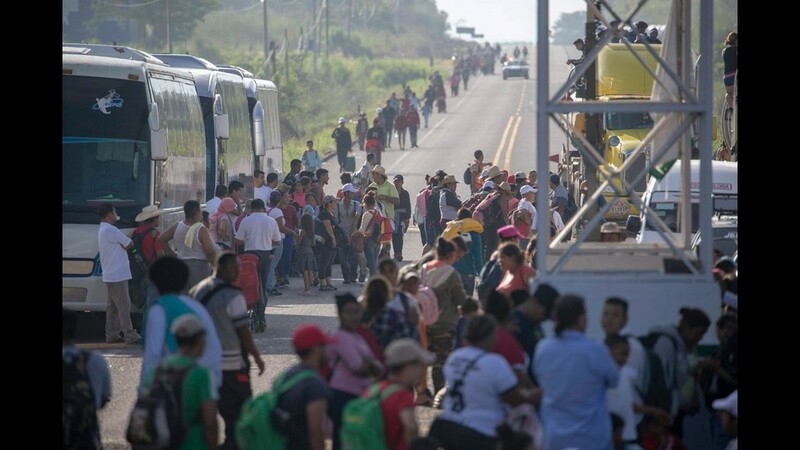 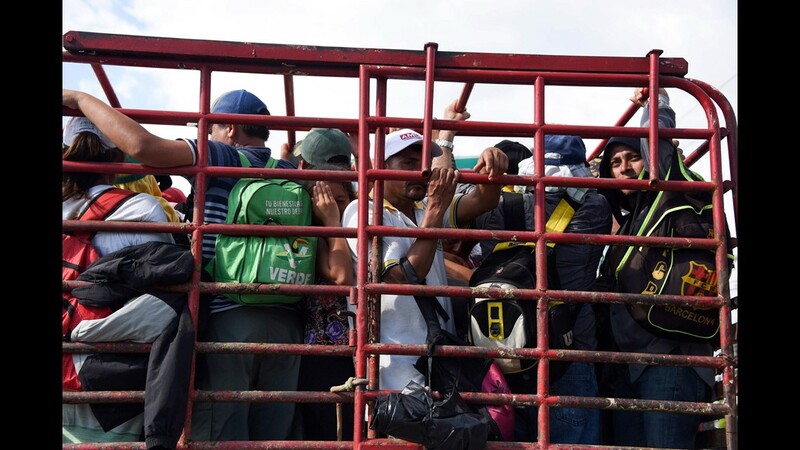 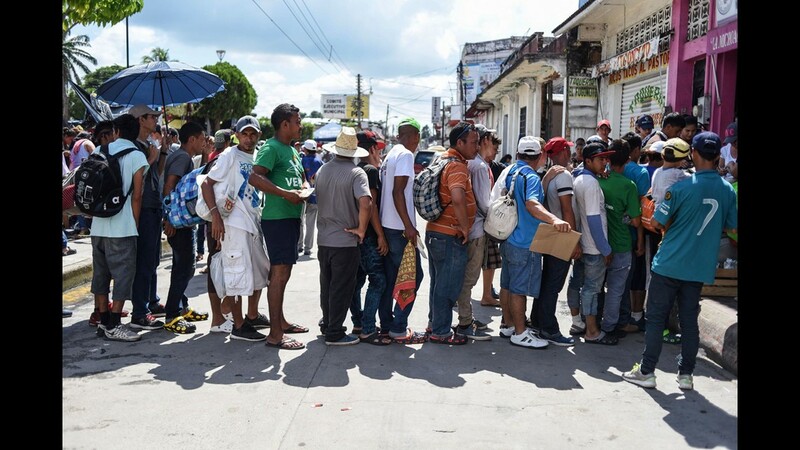 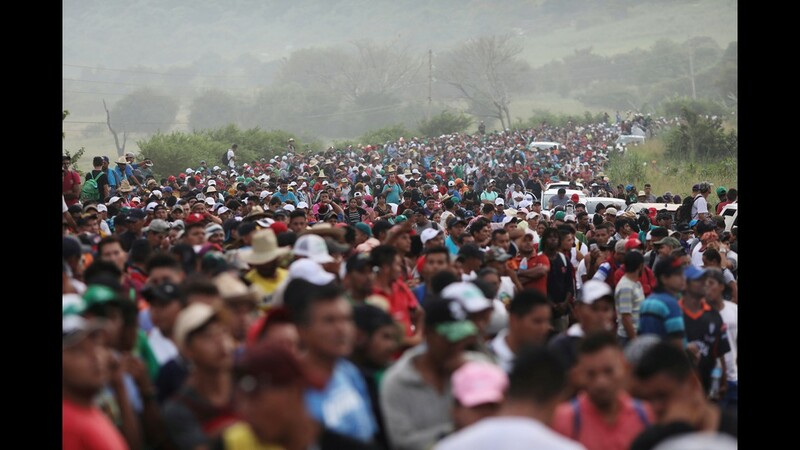 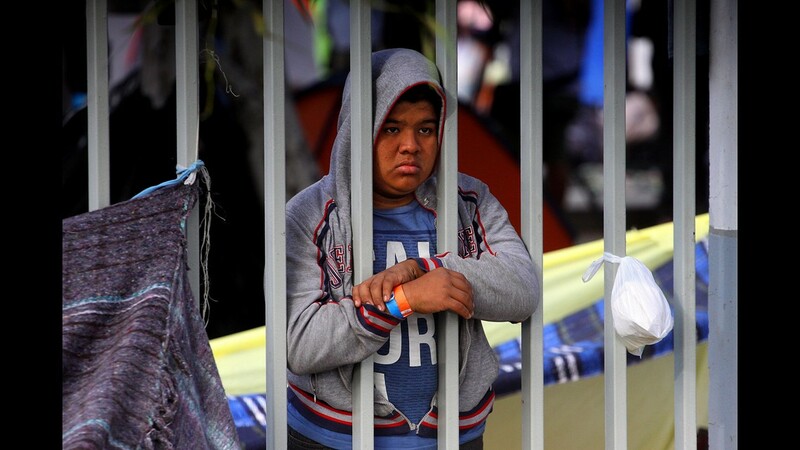 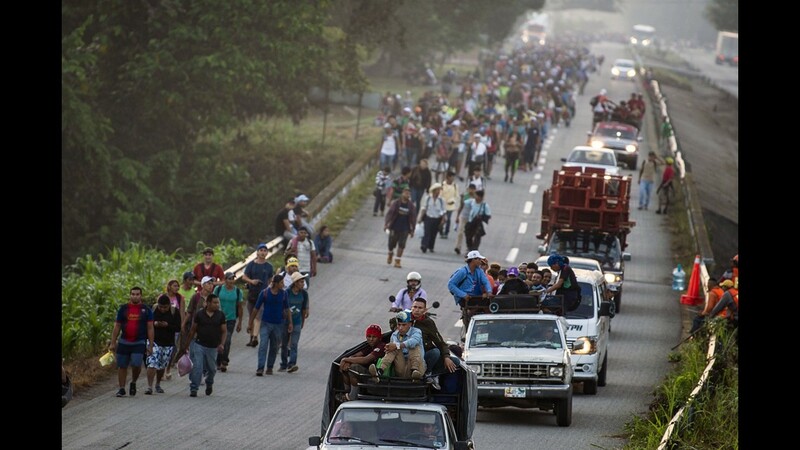 “We have information of participation of over 500 individuals with criminal records as part of the caravan," McAleenan said. 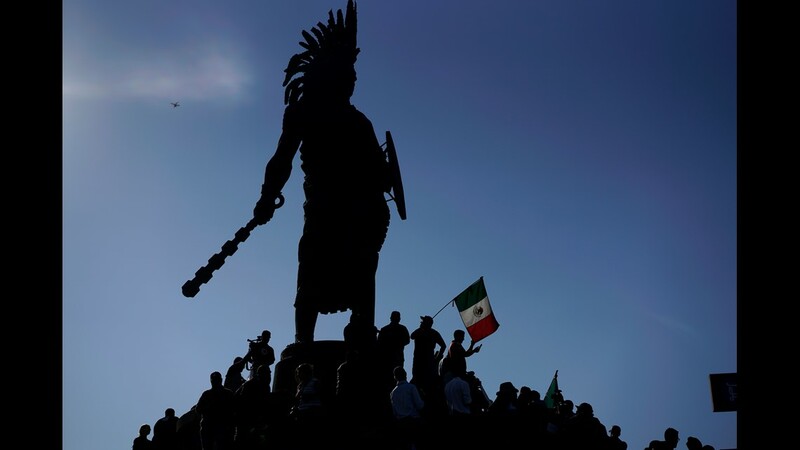 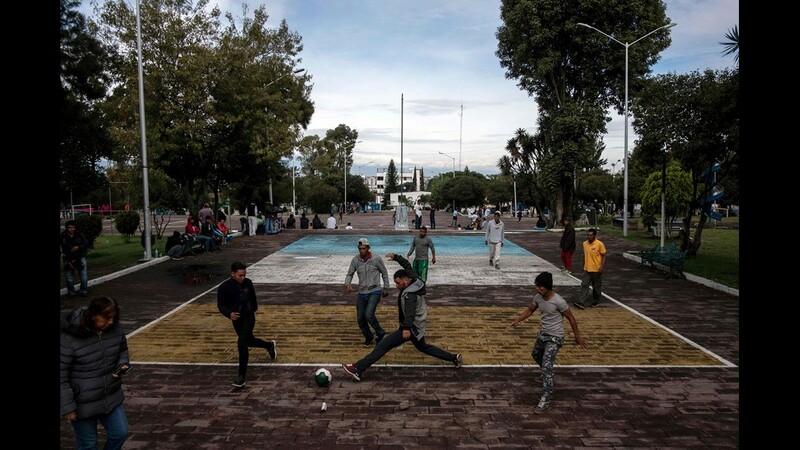 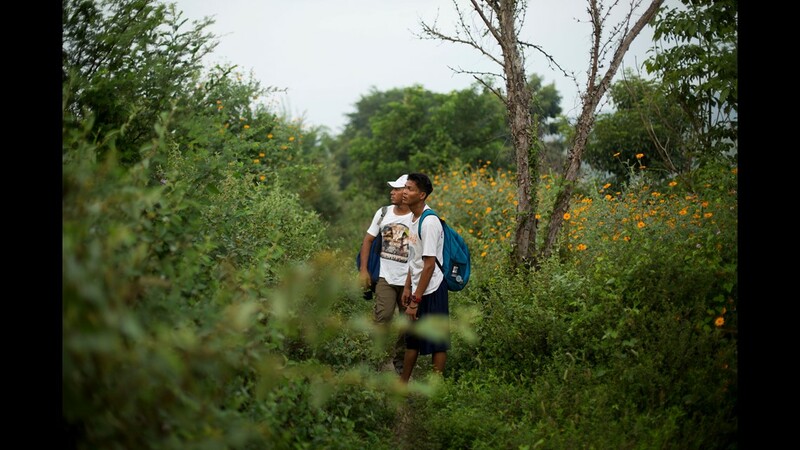 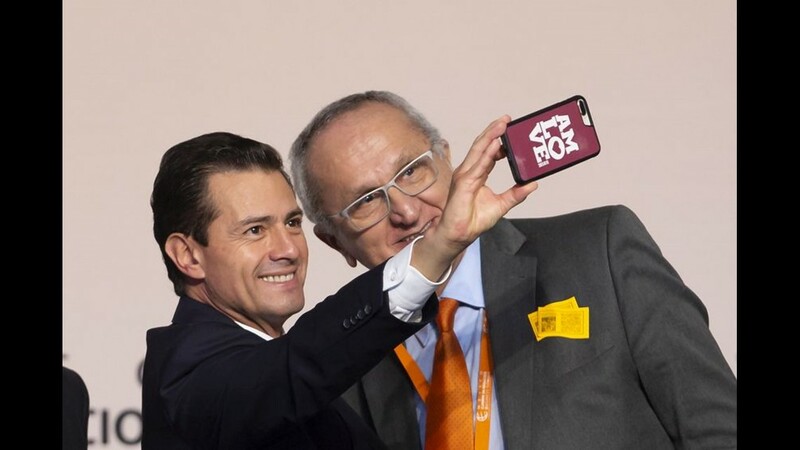 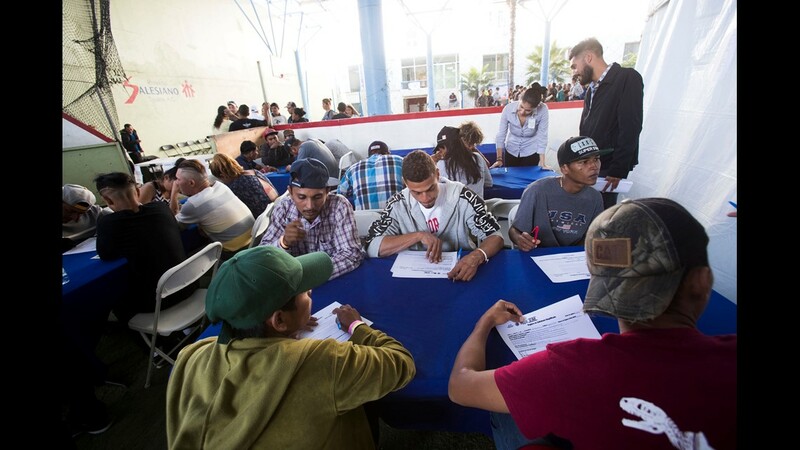 "That is gathered through direct engagement, as well as information sharing with our government of Mexico partners." 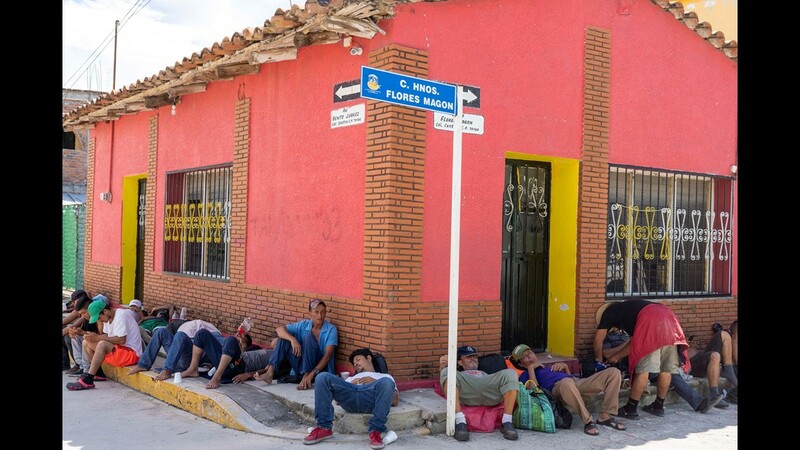 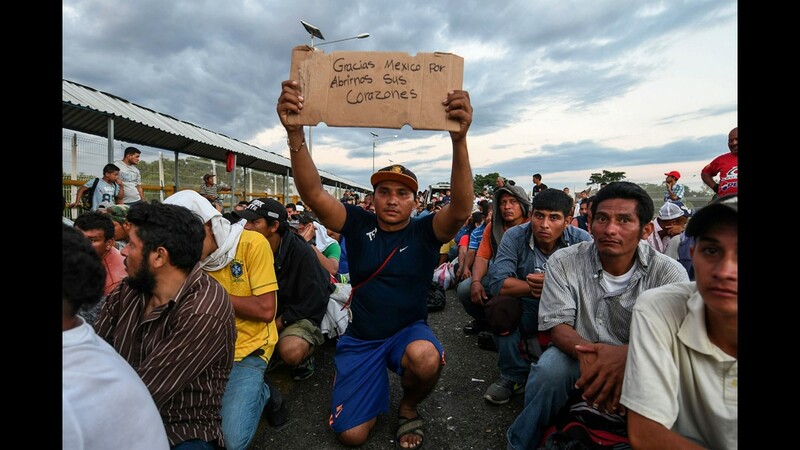 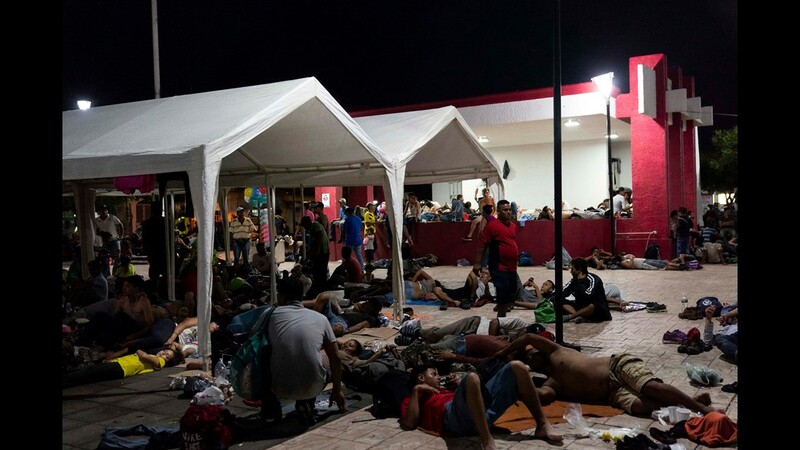 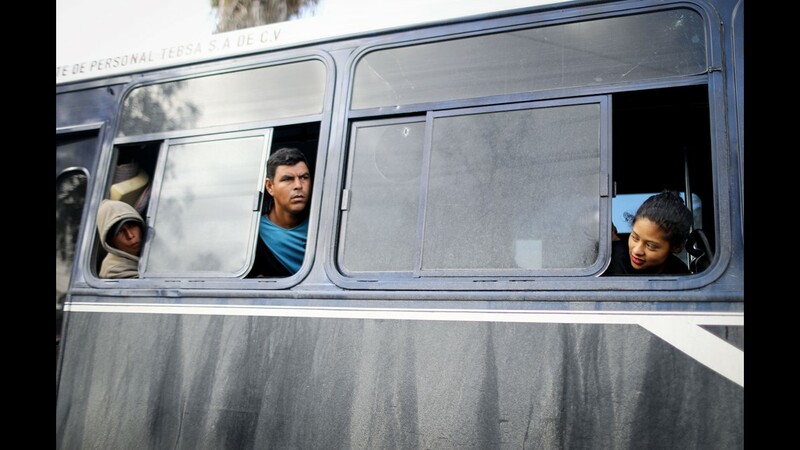 McAleenan pointed out that the government of Mexico arrested more than 100 members of the caravan for what it described as "criminal activity" during their time in Mexico. 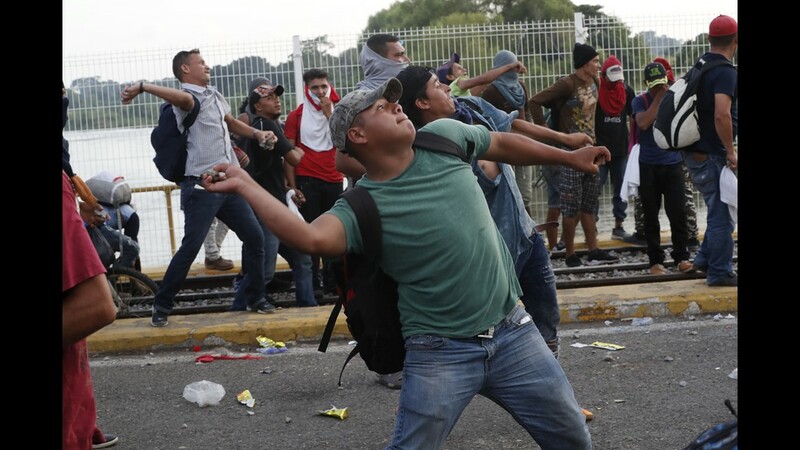 The administration has not provided any details on caravan members it considers criminals or how it got that information. 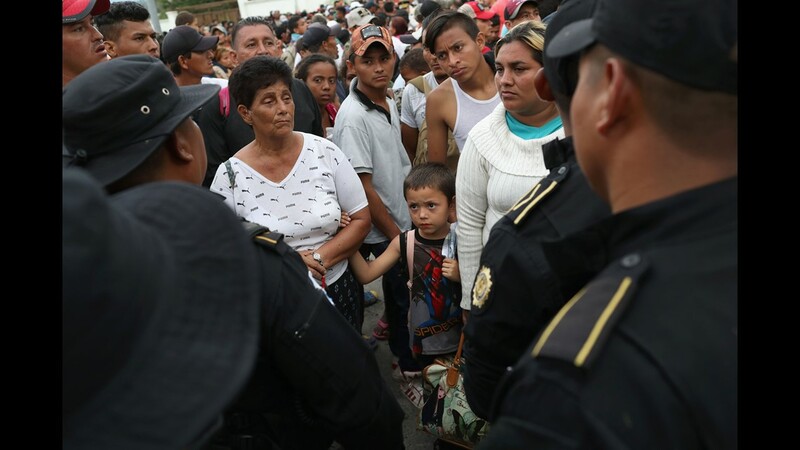 That is similar to what happened in October, when Trump claimed that members of the caravan were “criminals” and “Middle Easterners." 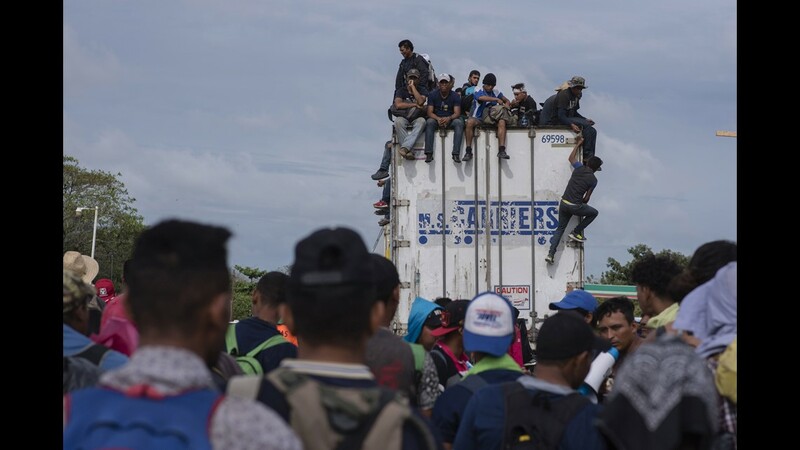 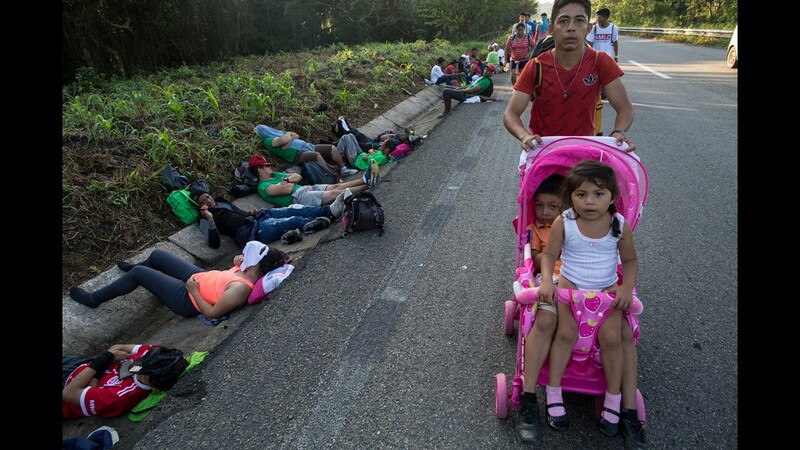 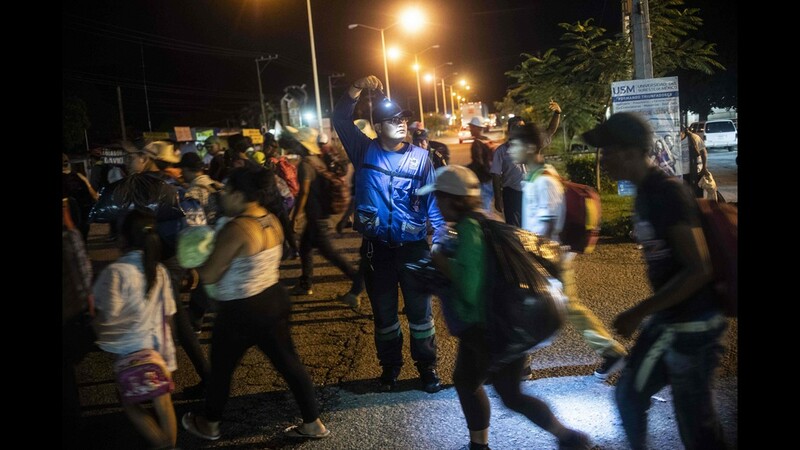 The Department of Homeland Security circulated data about annual arrest numbers in an attempt to show that criminals were likely to be part of the caravan. 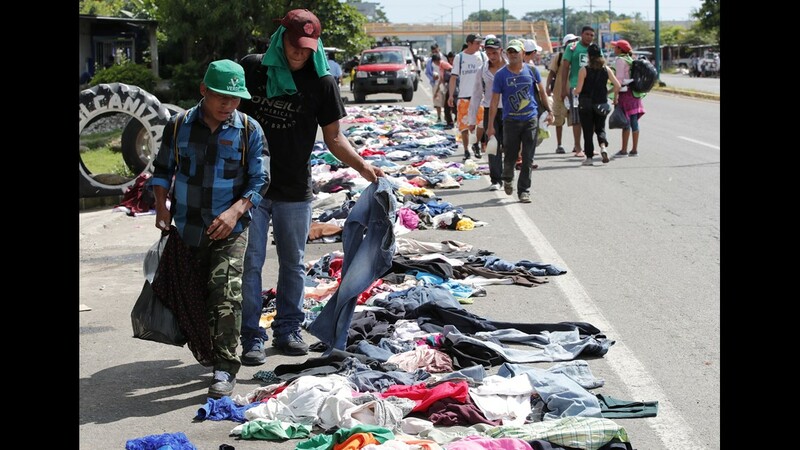 What caused the clash Sunday? 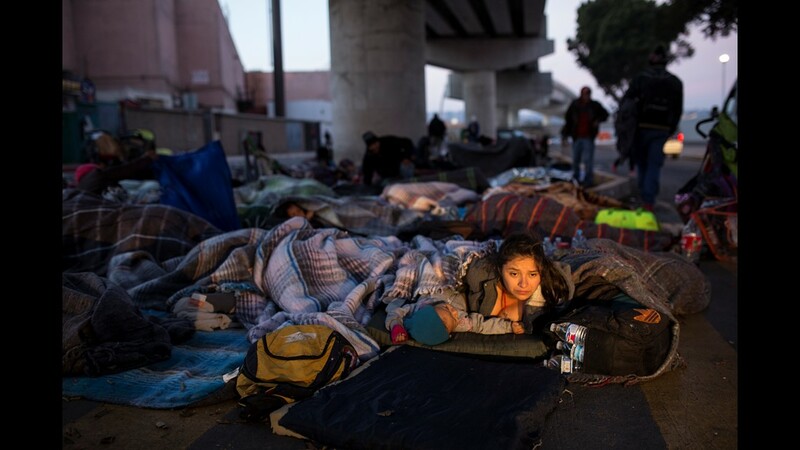 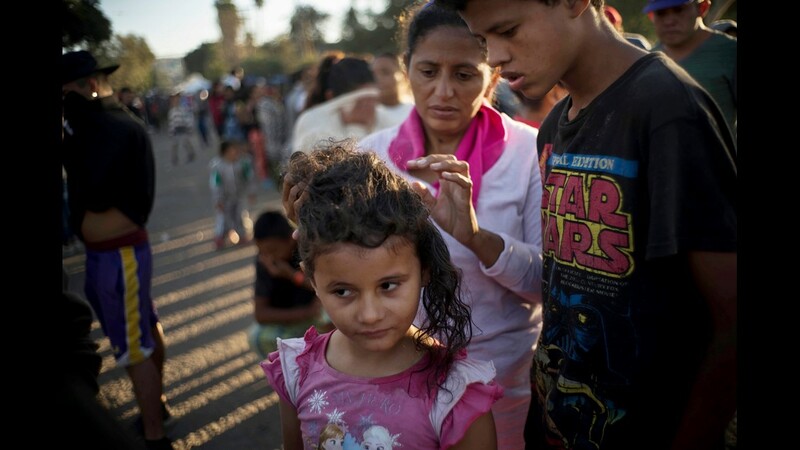 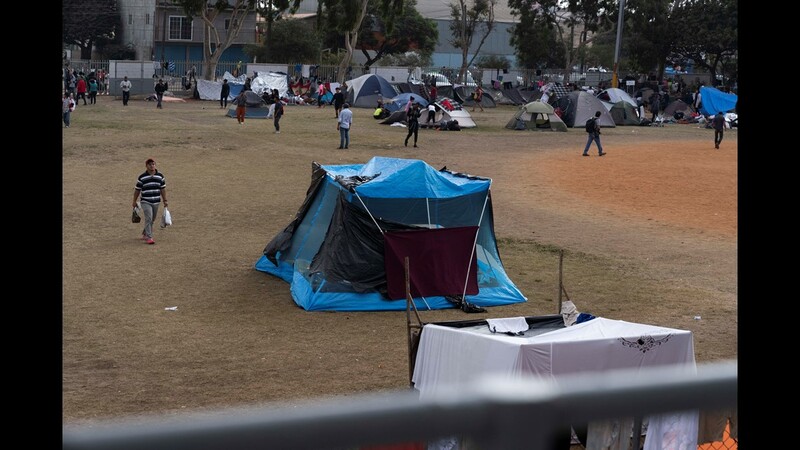 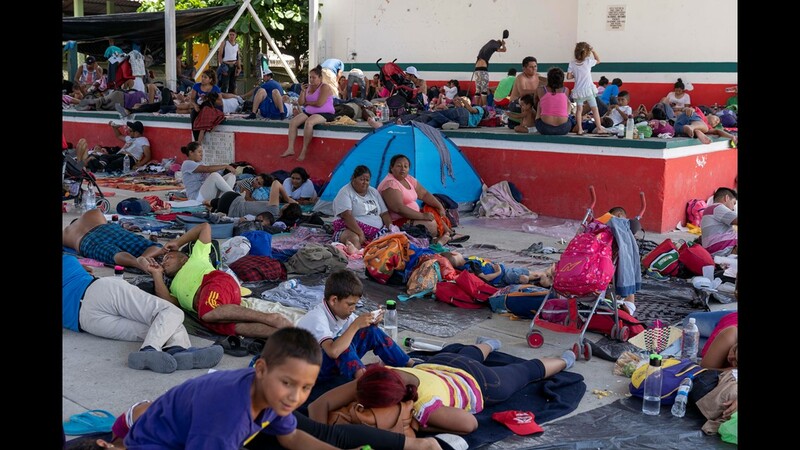 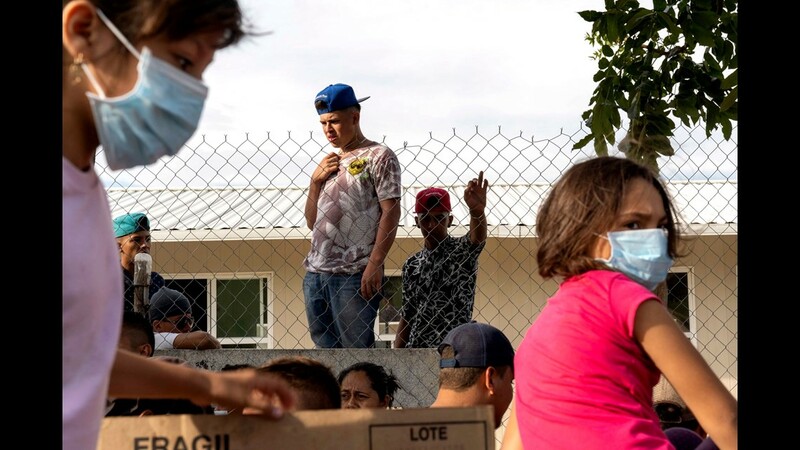 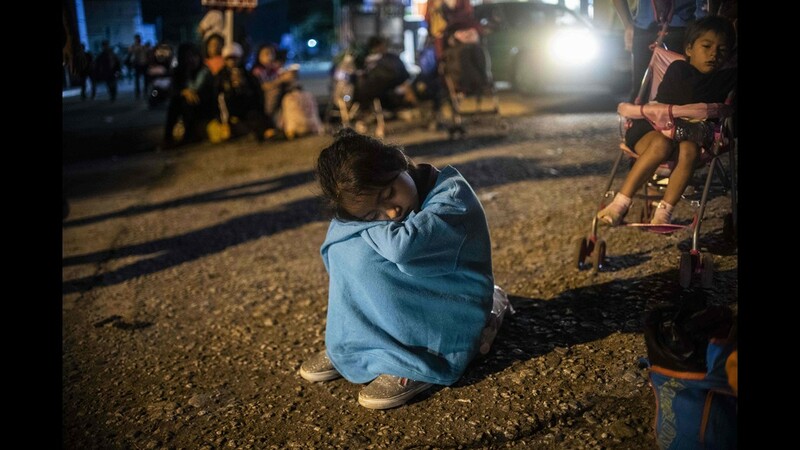 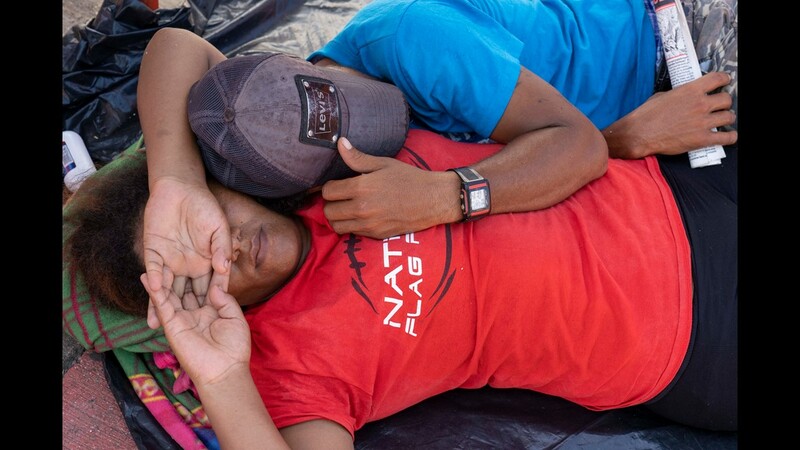 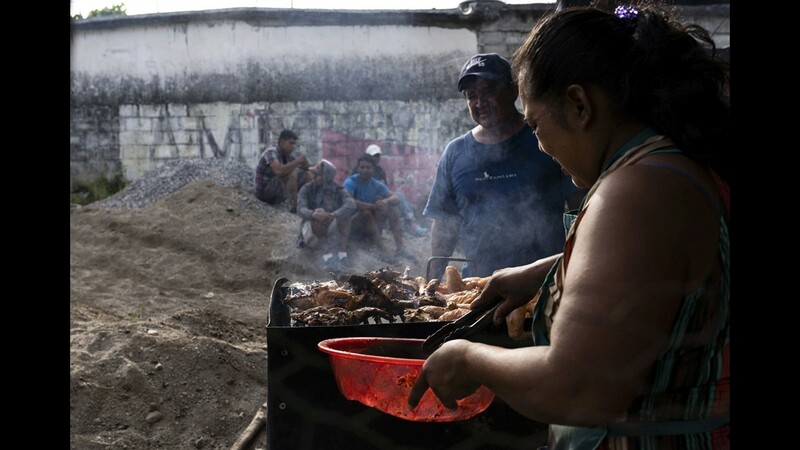 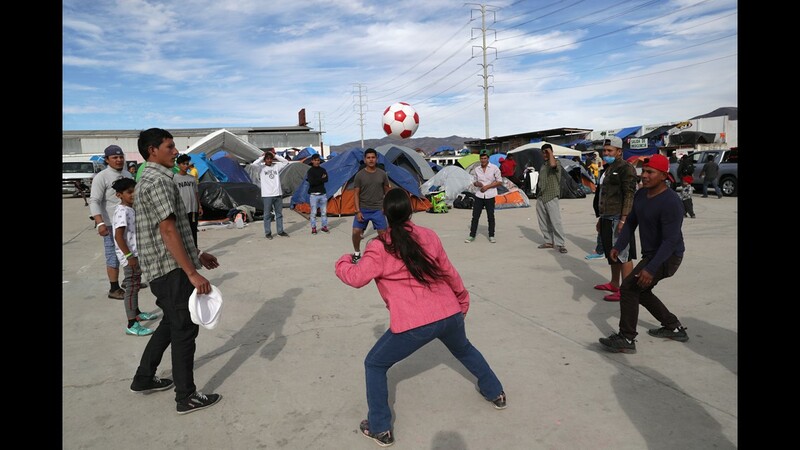 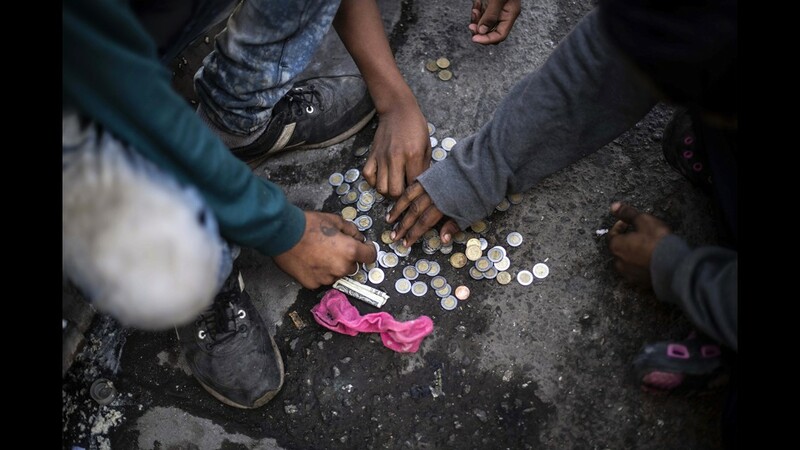 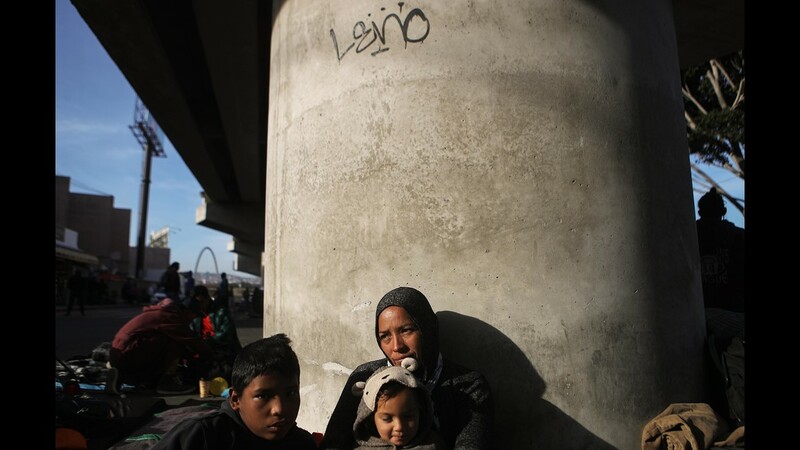 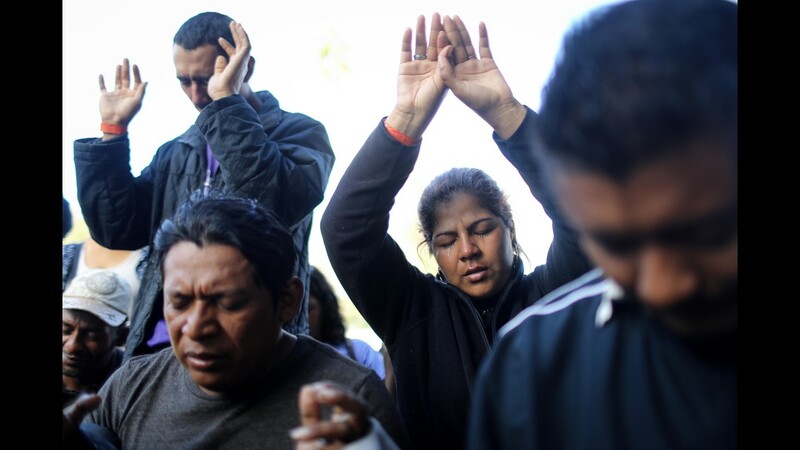 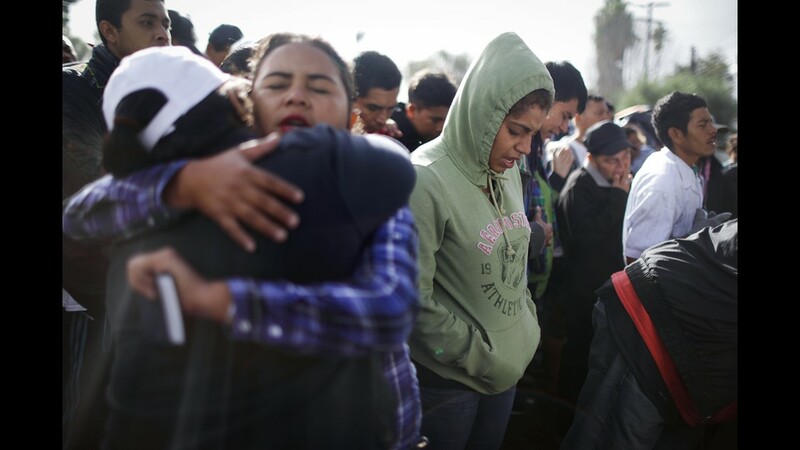 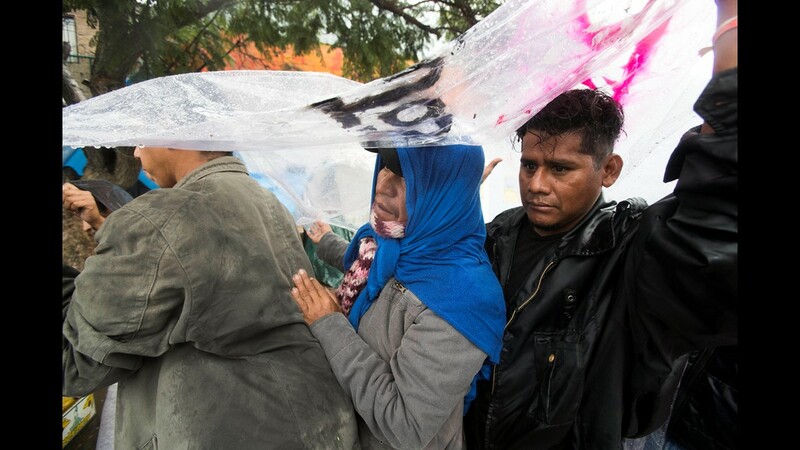 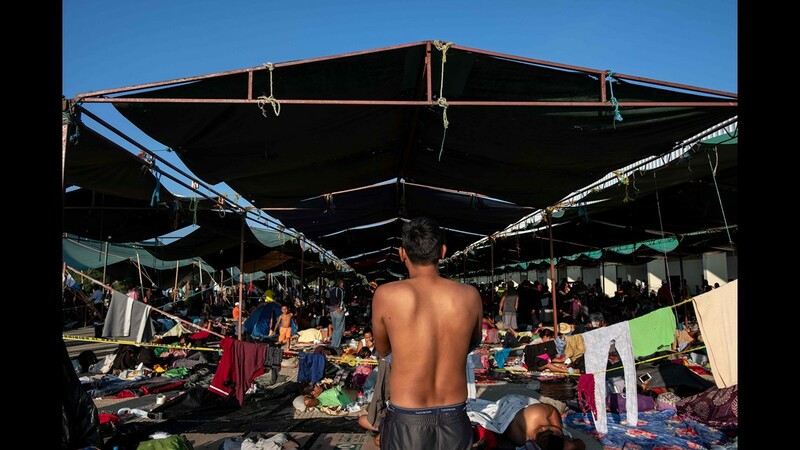 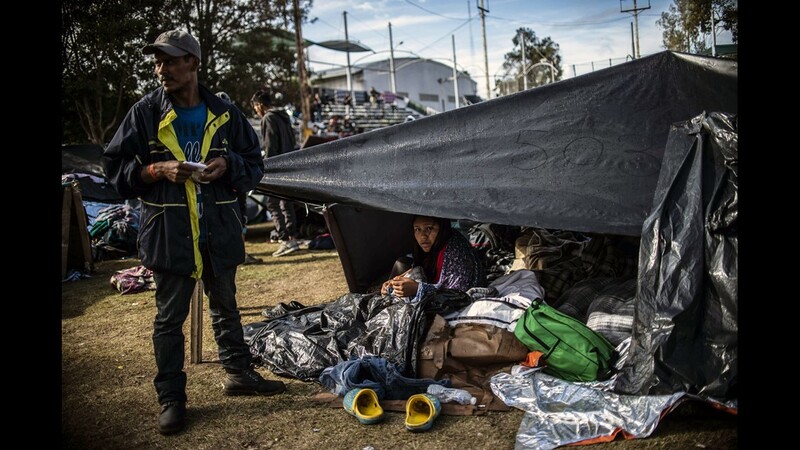 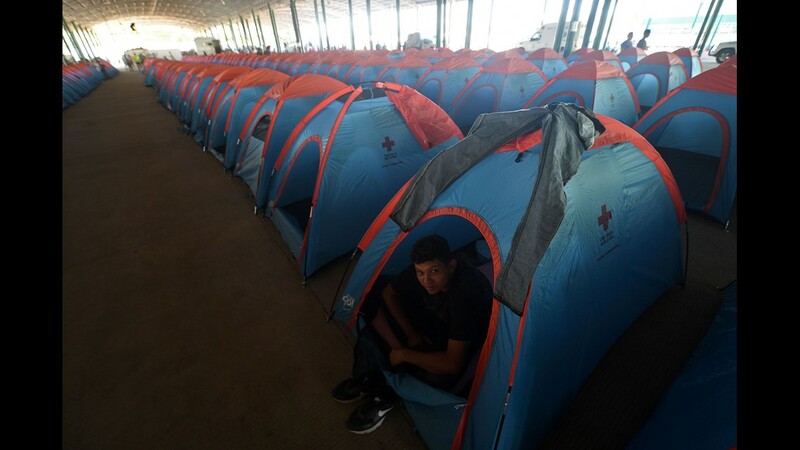 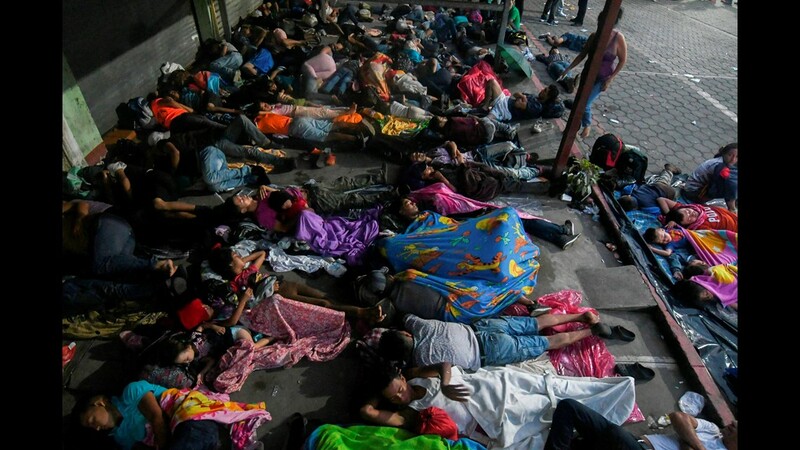 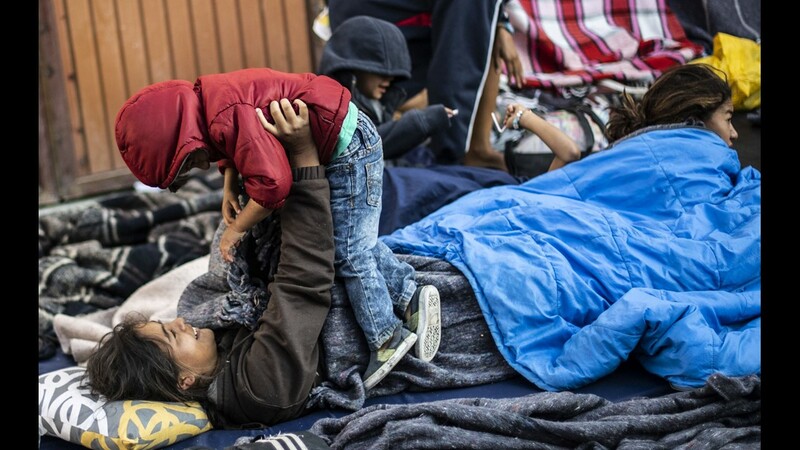 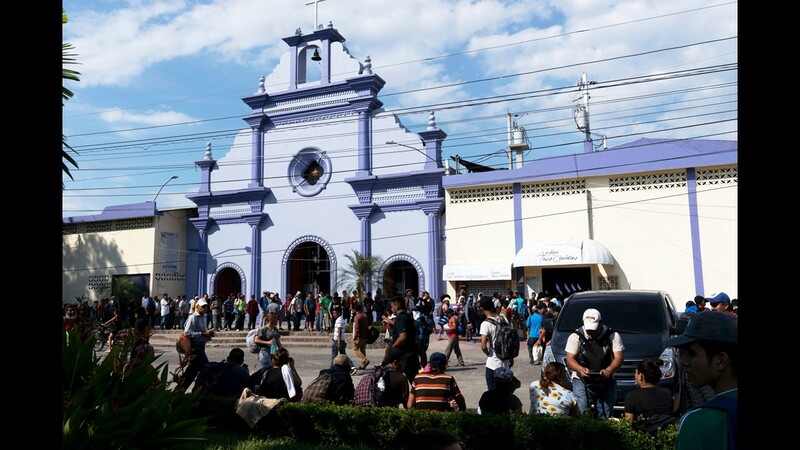 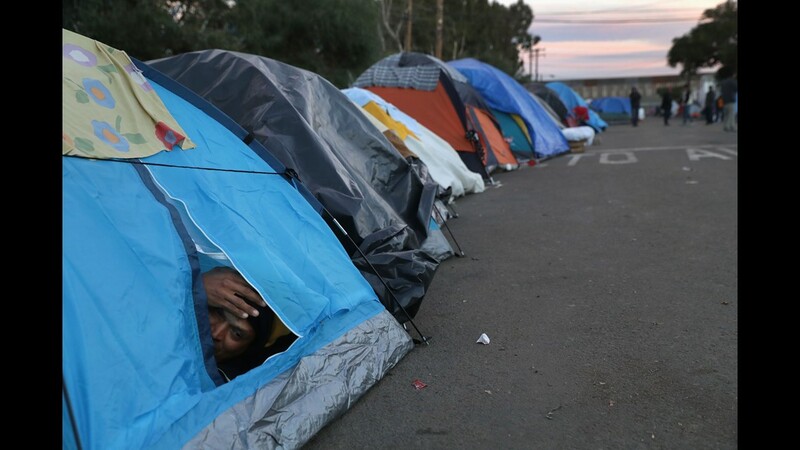 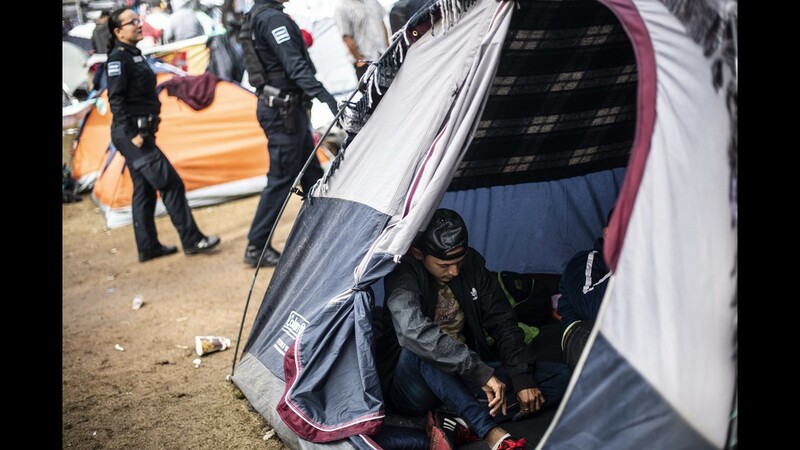 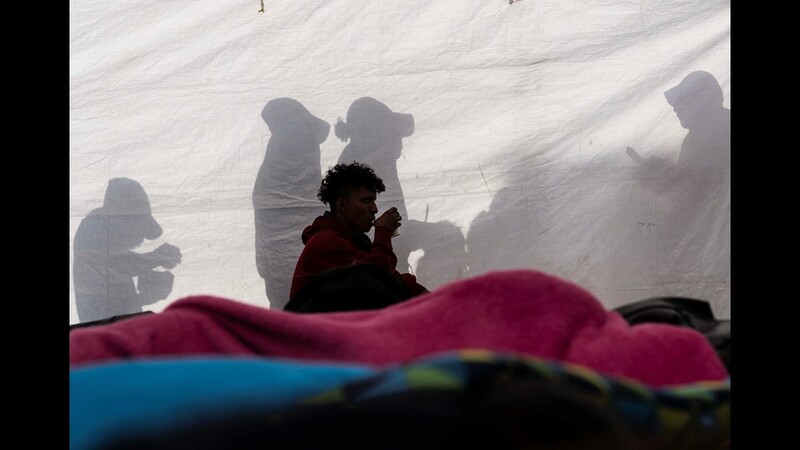 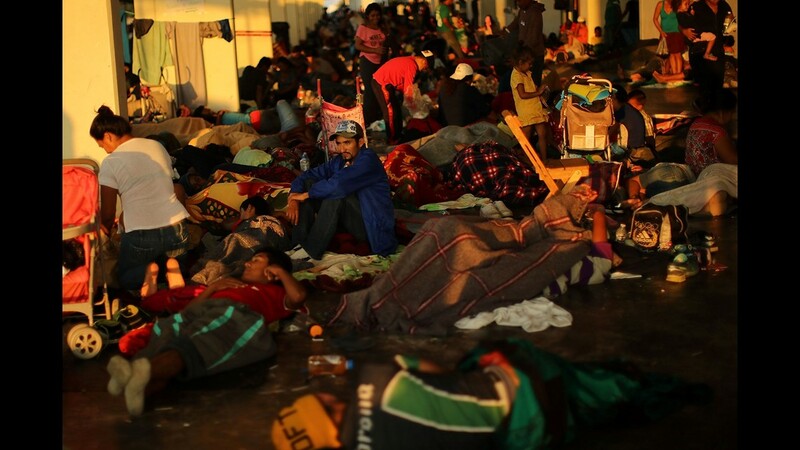 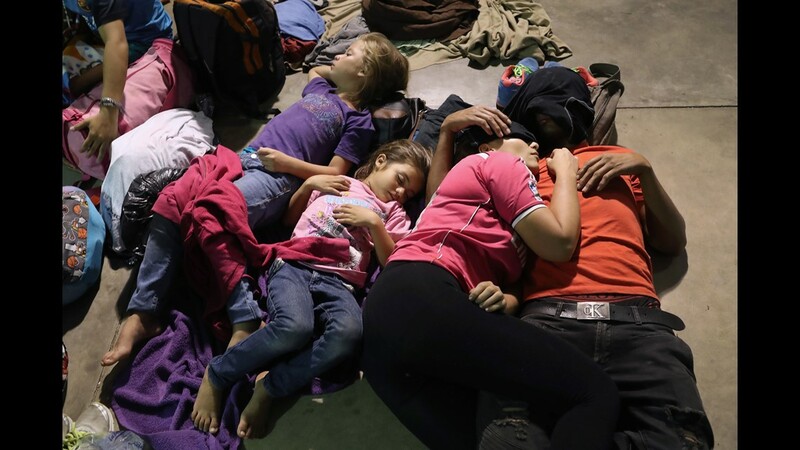 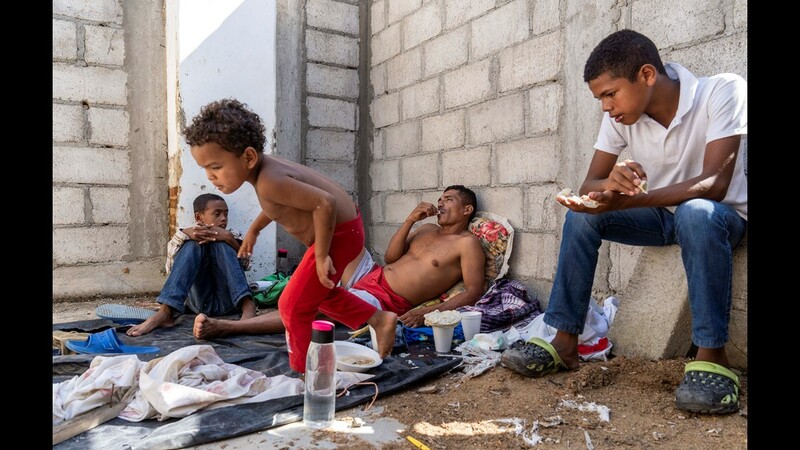 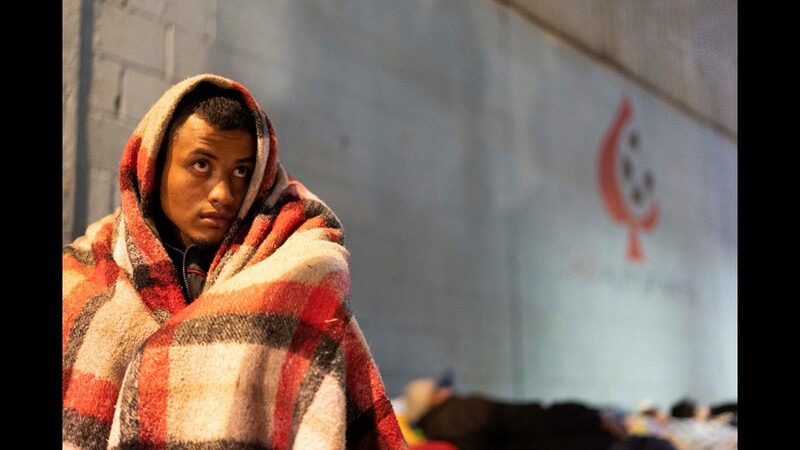 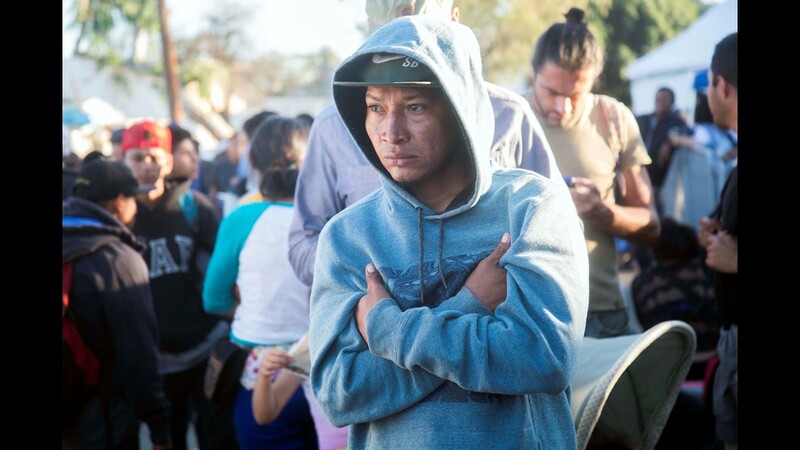 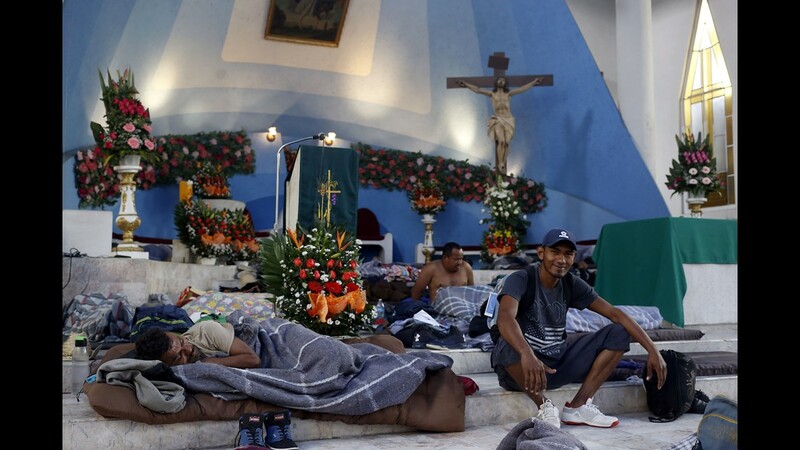 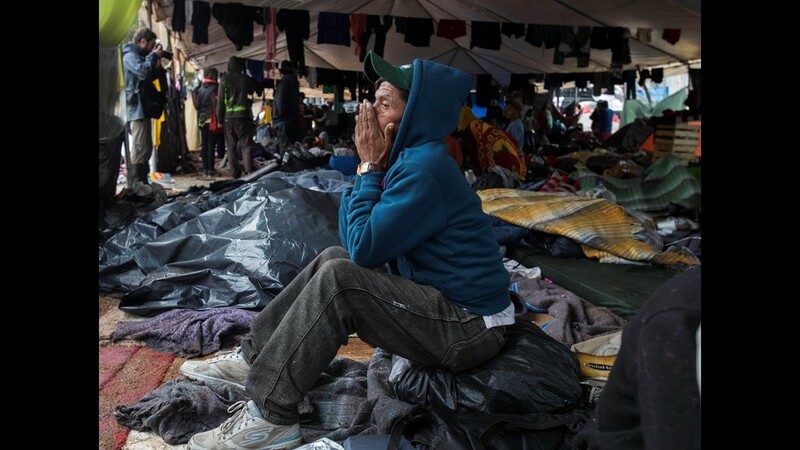 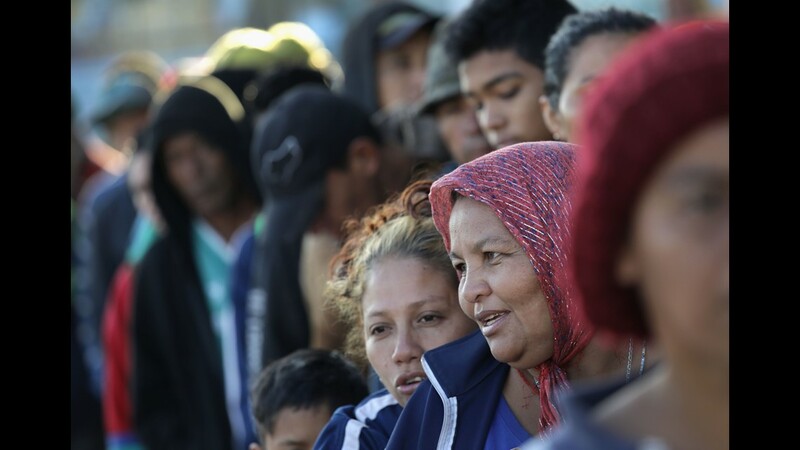 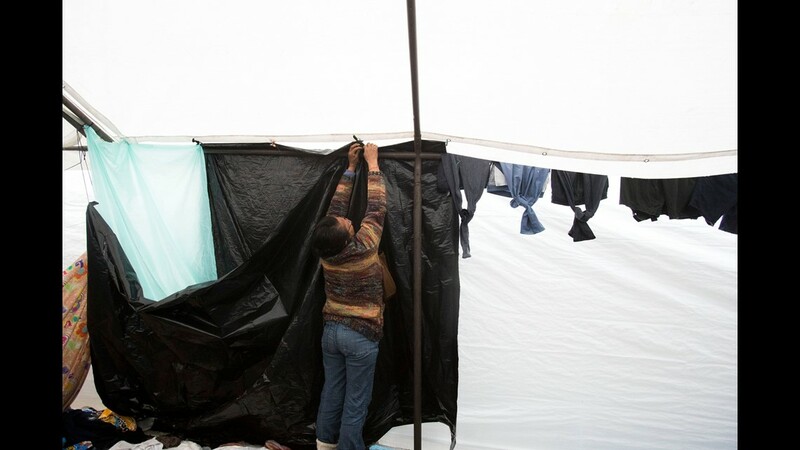 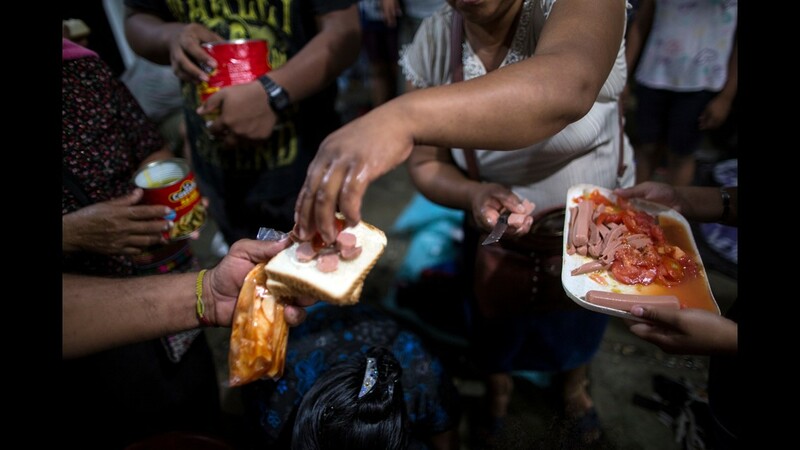 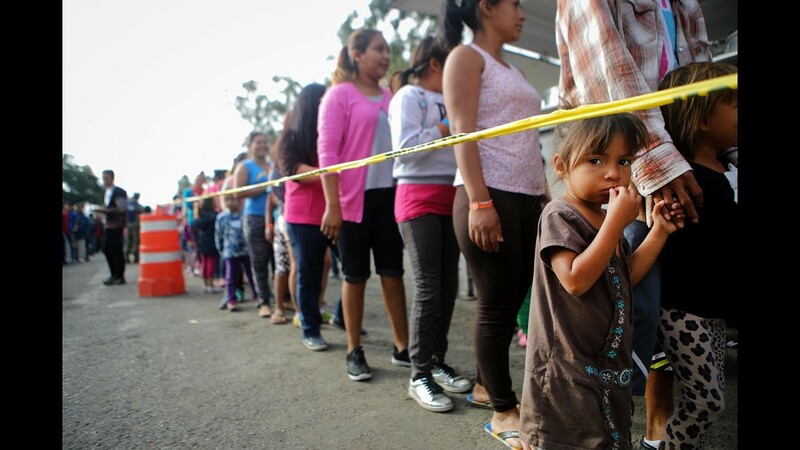 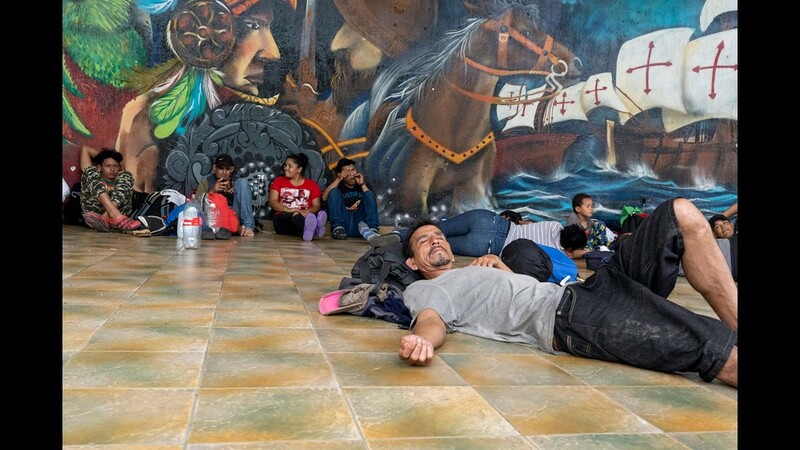 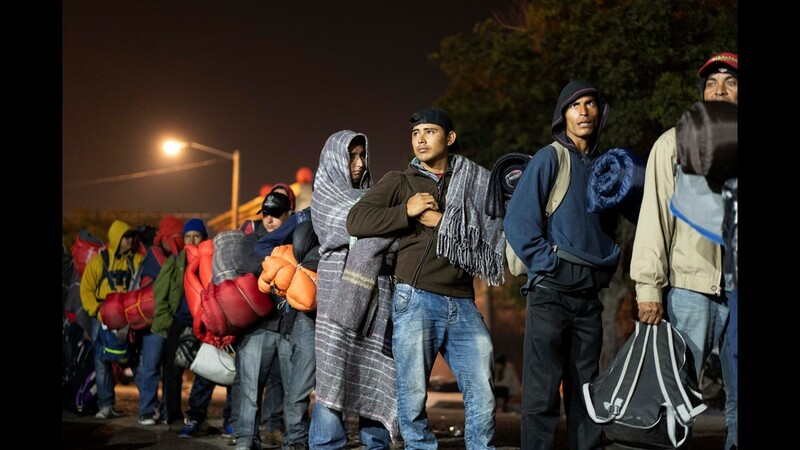 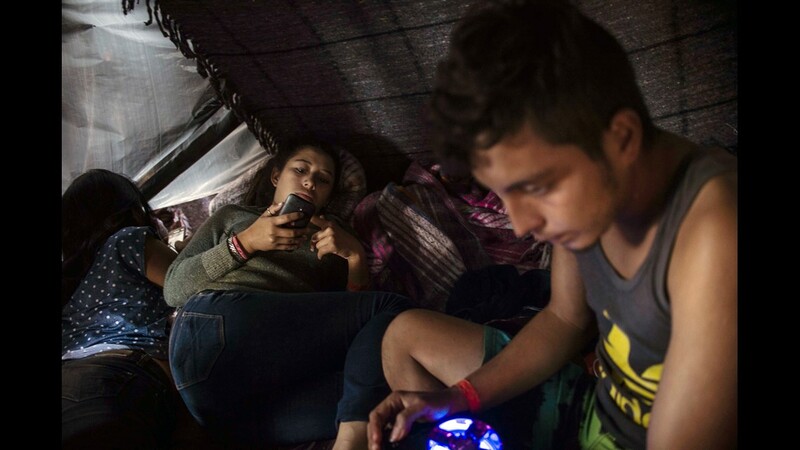 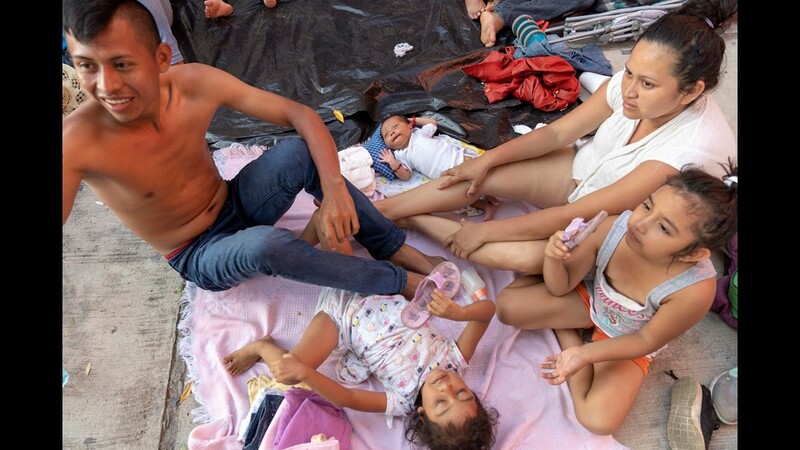 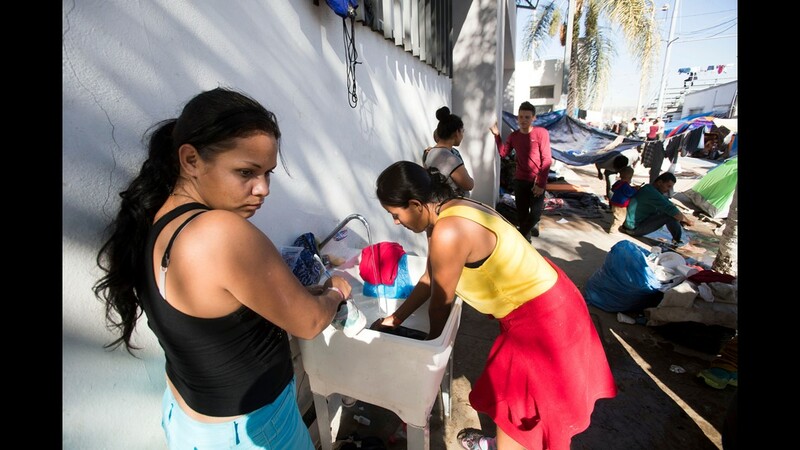 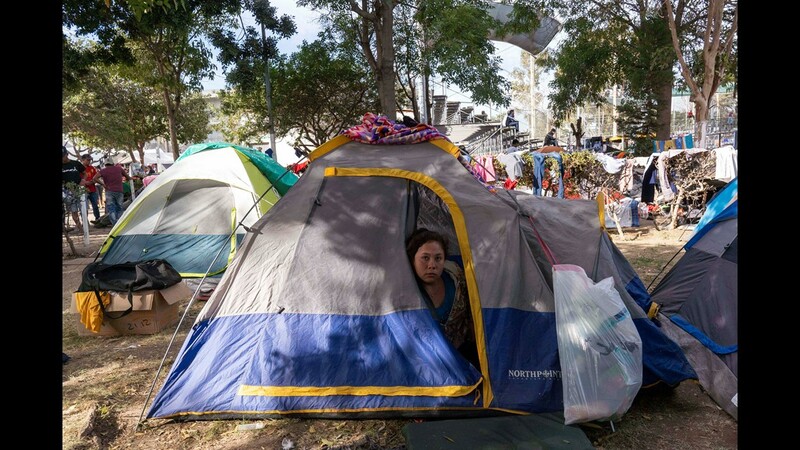 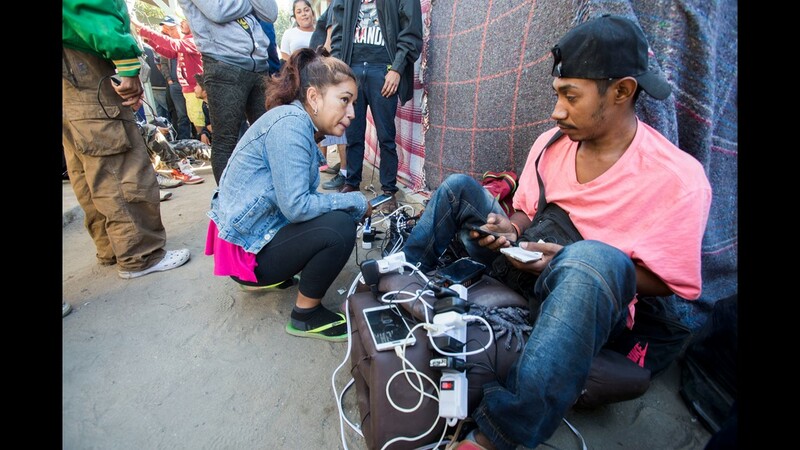 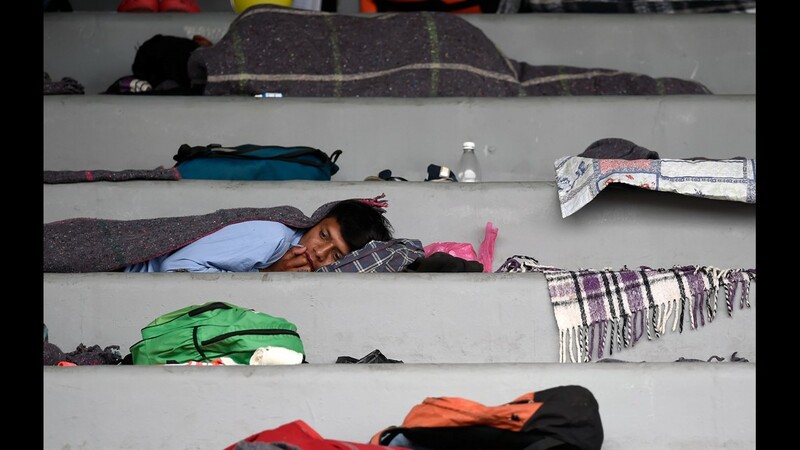 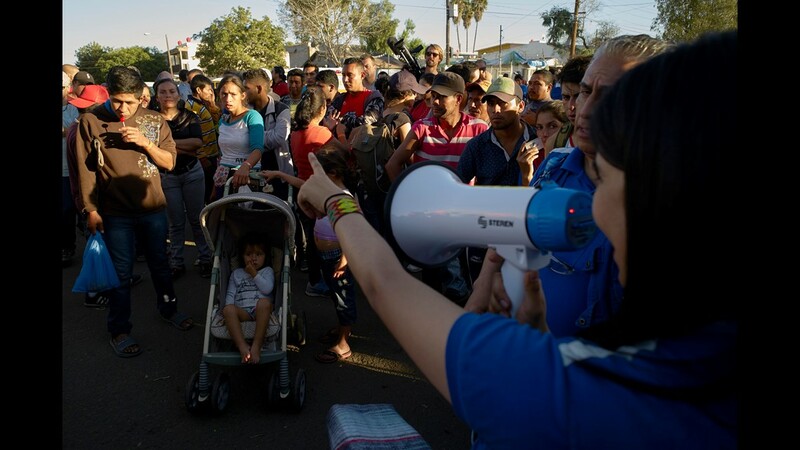 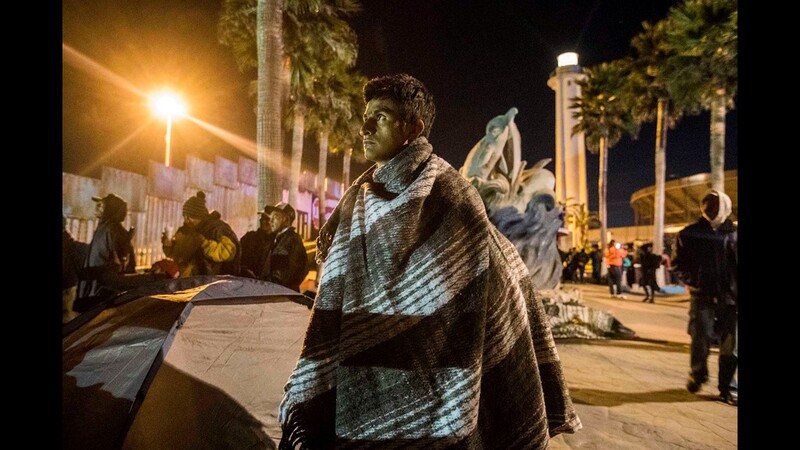 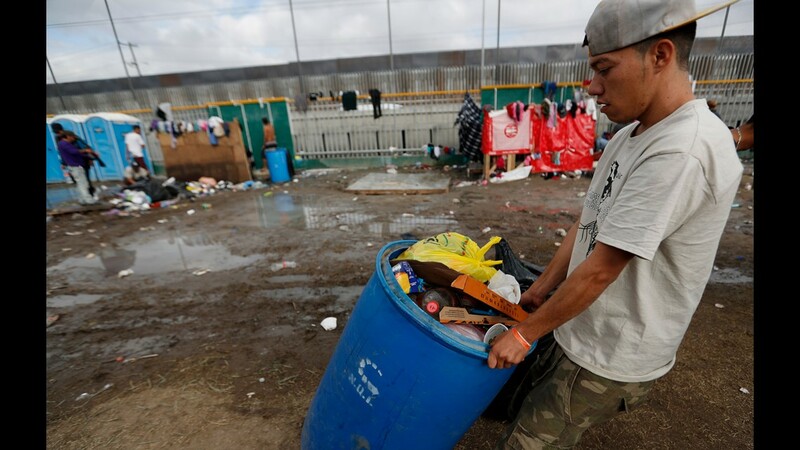 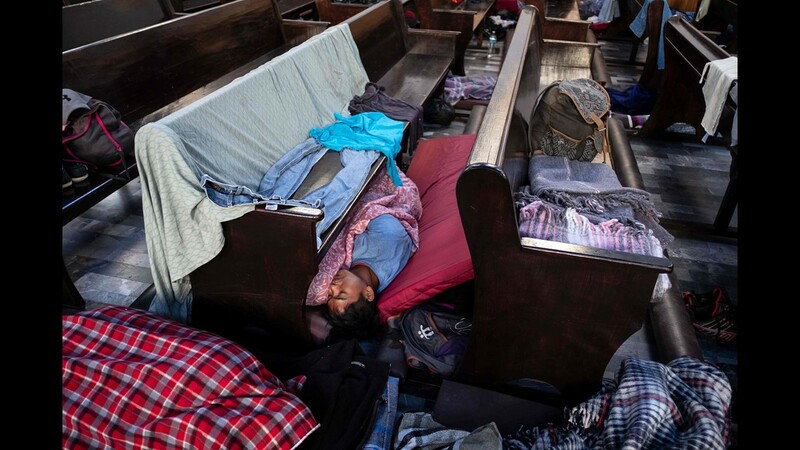 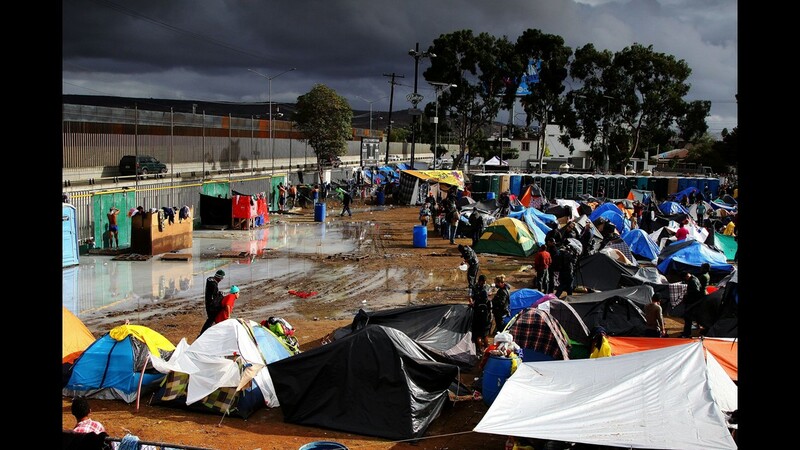 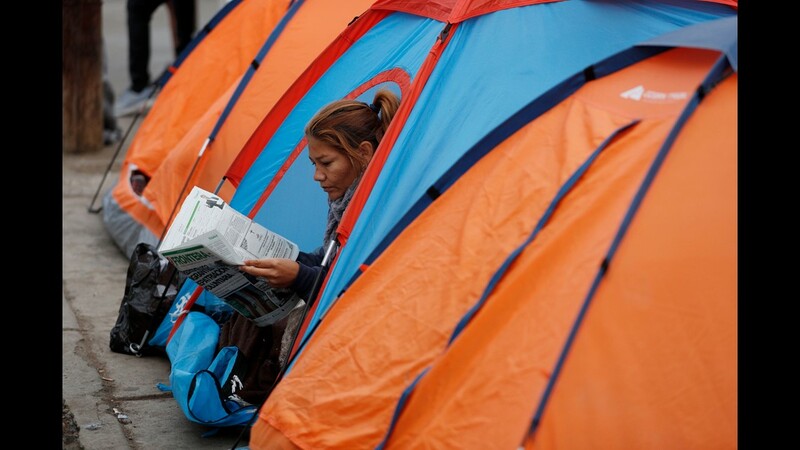 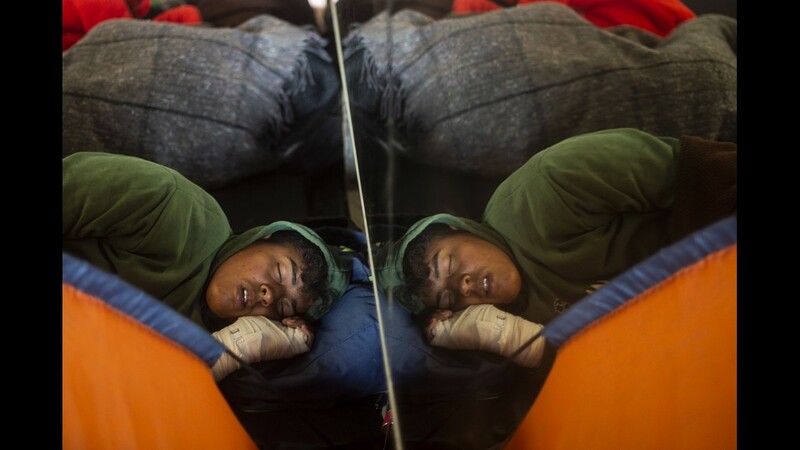 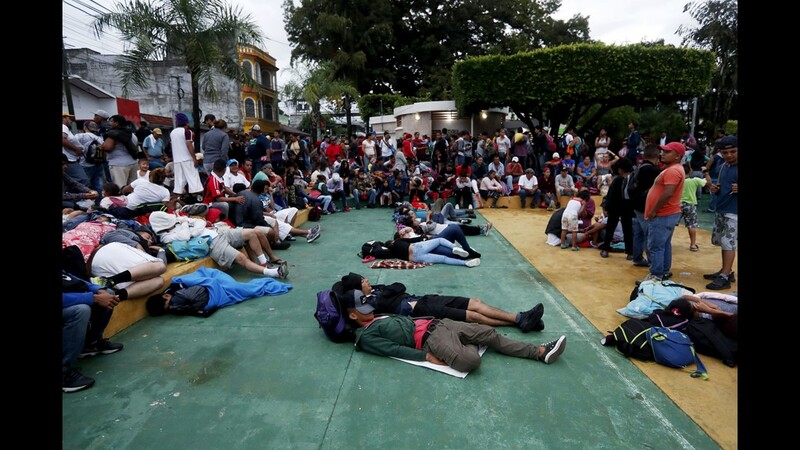 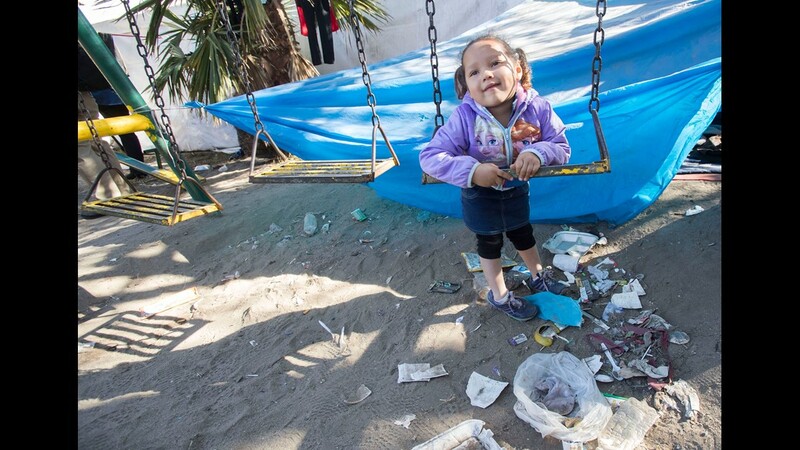 Thousands of immigrants from Central America are waiting in makeshift shelters in Tijuana for a chance to apply for asylum in the USA. 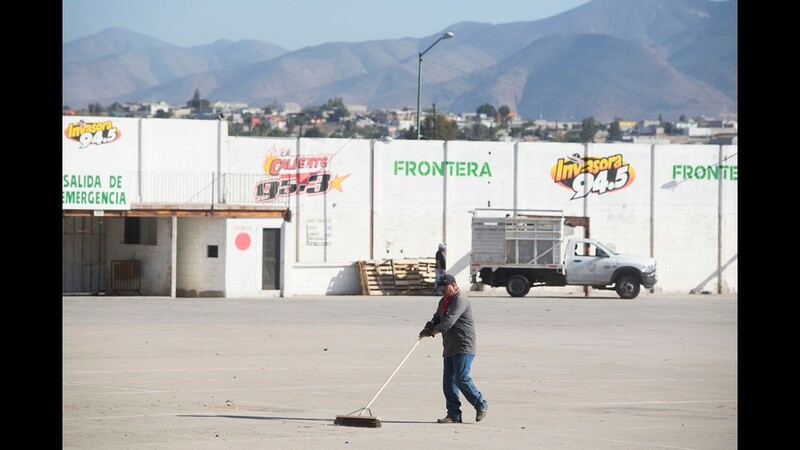 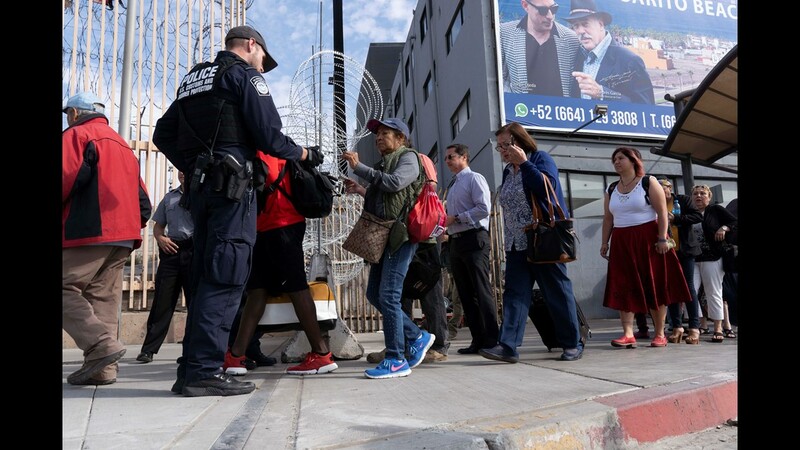 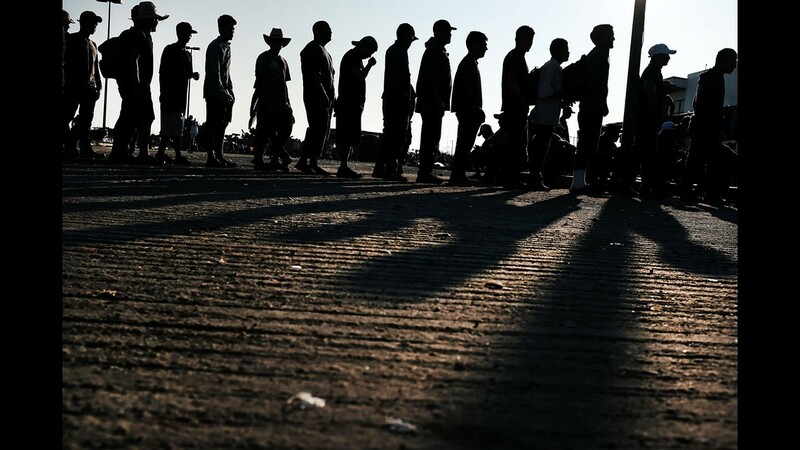 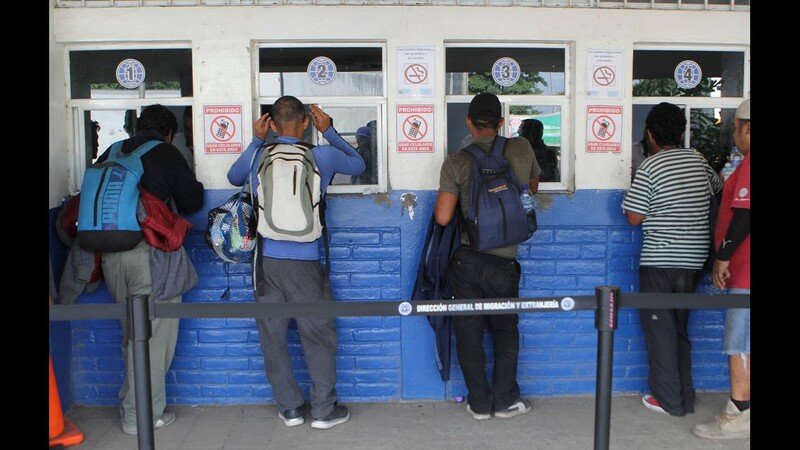 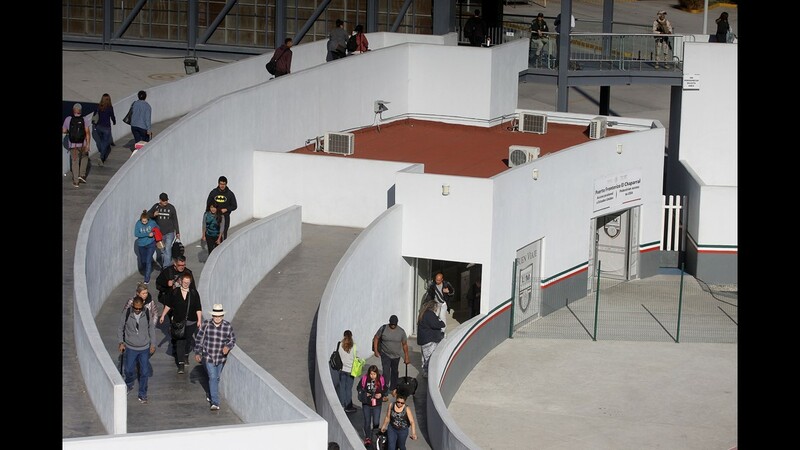 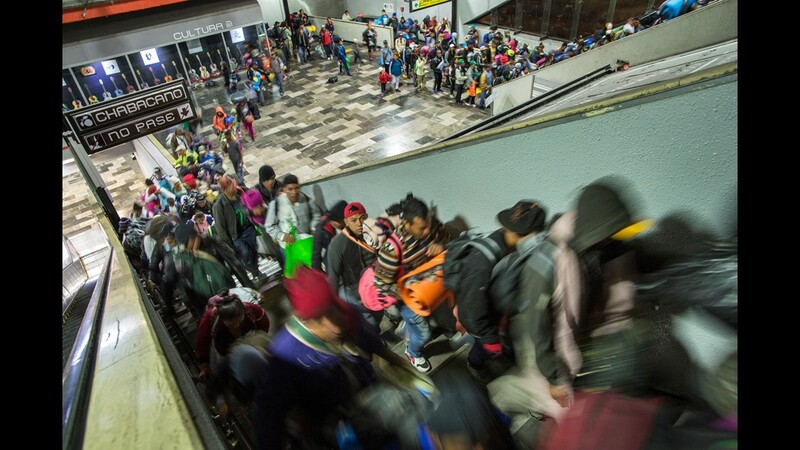 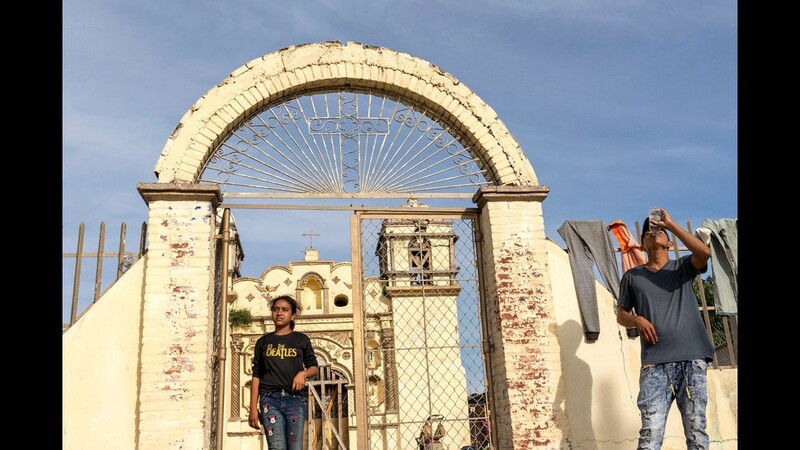 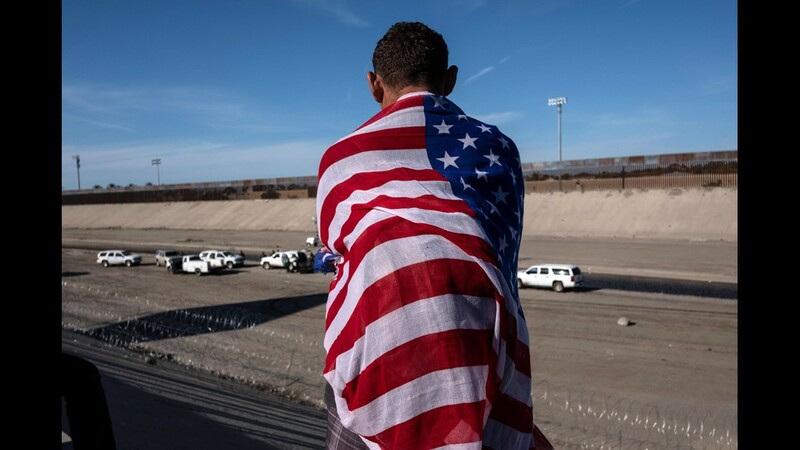 U.S. officials at the San Ysidro Port of Entry, the nation's largest land entry point, can process only up to 100 asylum requests per day, creating an enormous line that means monthslong waits for some immigrants. 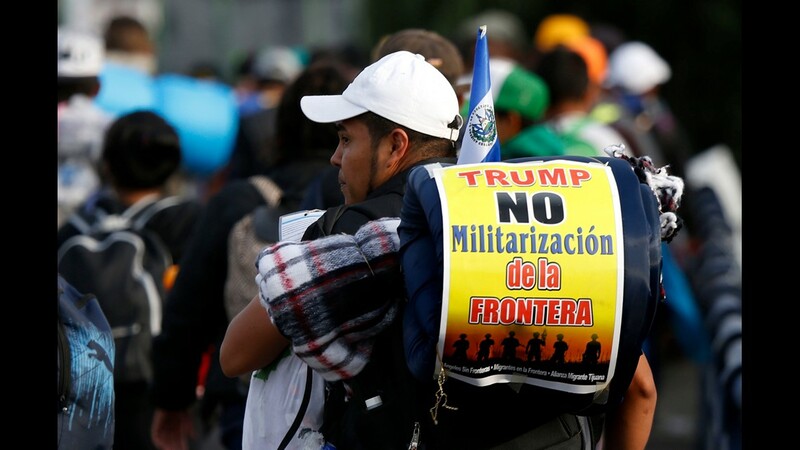 Some immigrants organized protests to try to pressure the United States to devote more resources to the process. 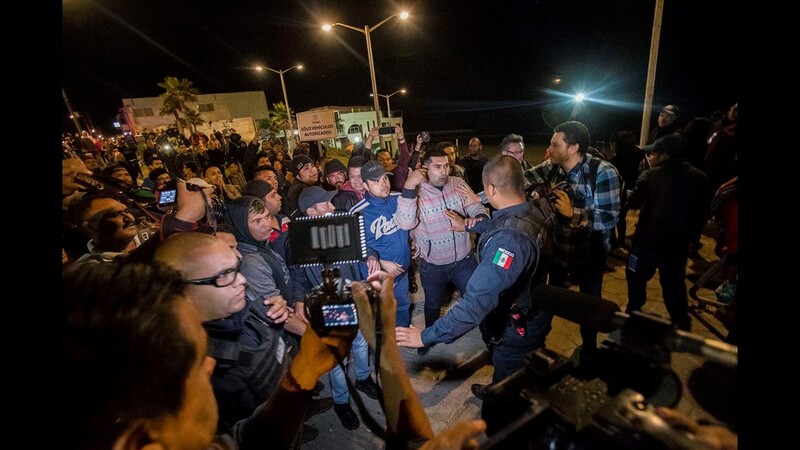 One of the protests turned chaotic when several hundred immigrants broke away and rushed a border fence. 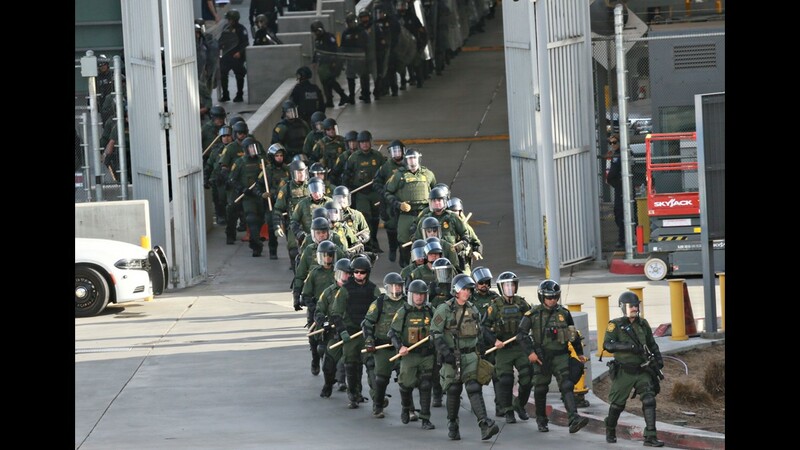 CBP officers said they were pelted with projectiles before they fired tear gas at the immigrants. 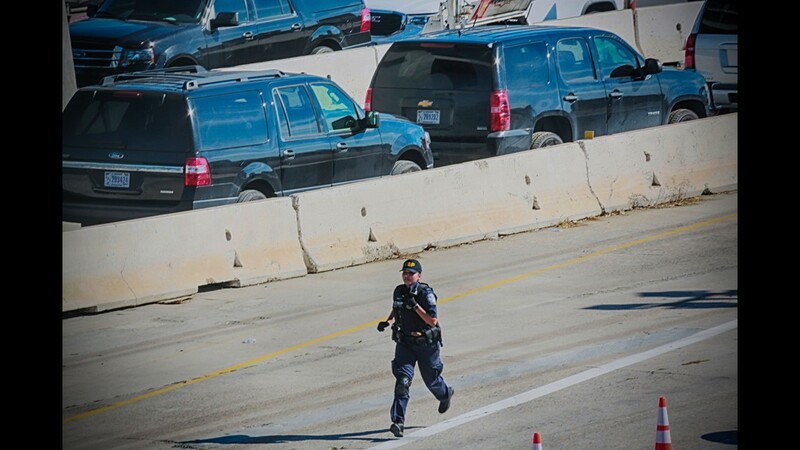 CBP shut down north- and southbound traffic at San Ysidro for nearly six hours. 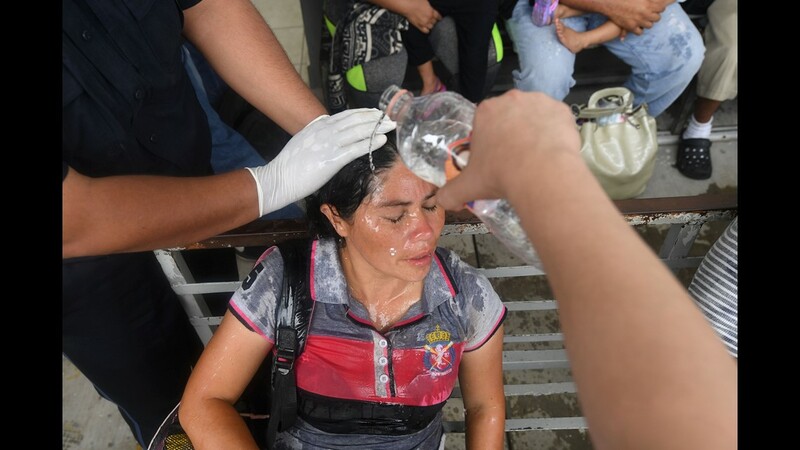 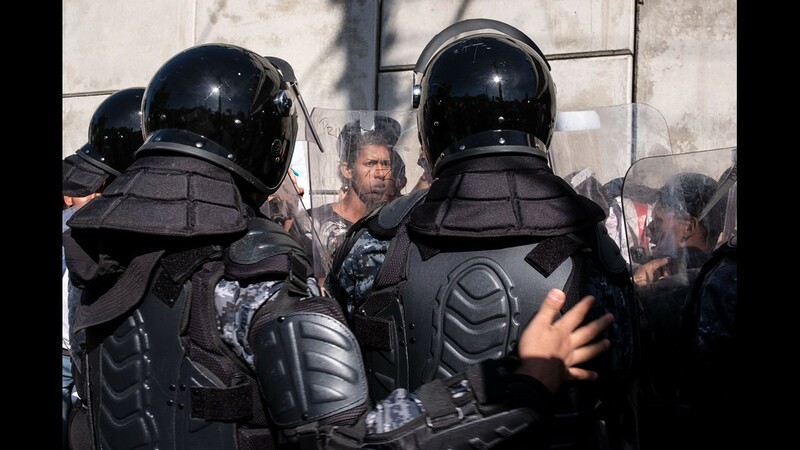 McAleenan said the use of nonlethal force, such as tear gas, is allowed by trained personnel only and will be thoroughly reviewed. 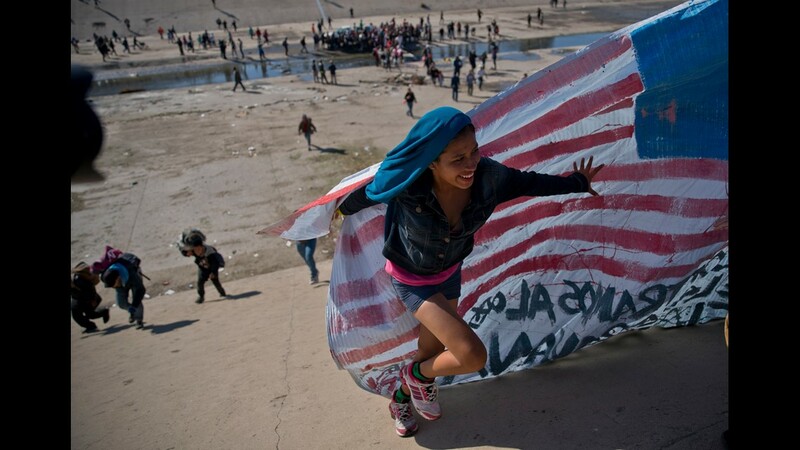 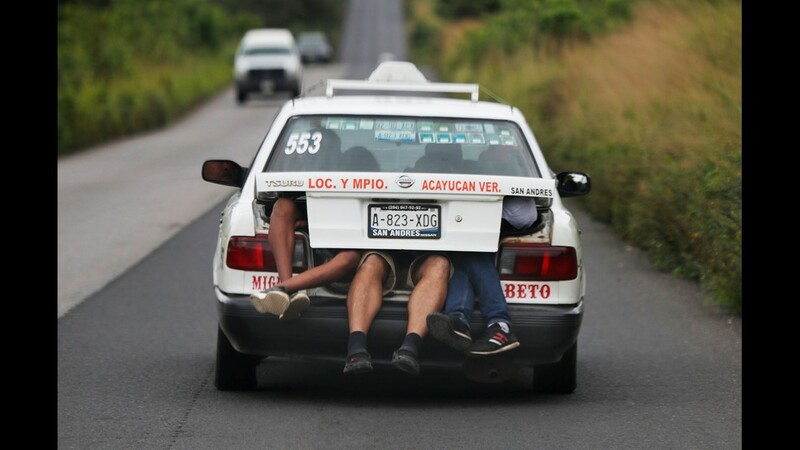 The goal was to use the gas at the border, but wind could carry it farther. 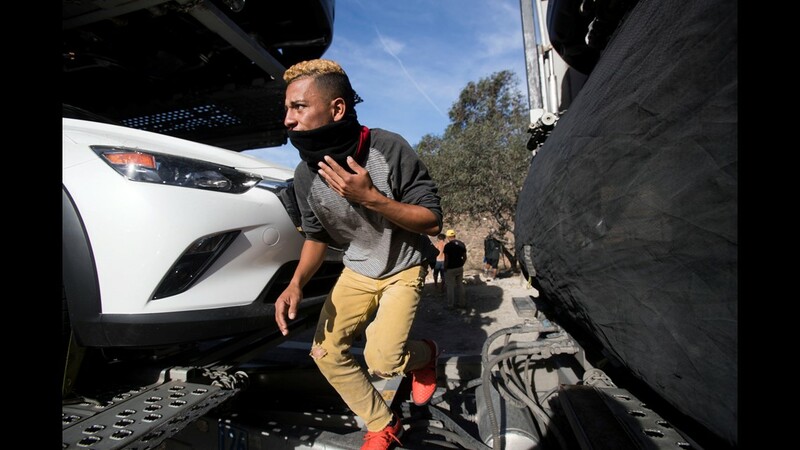 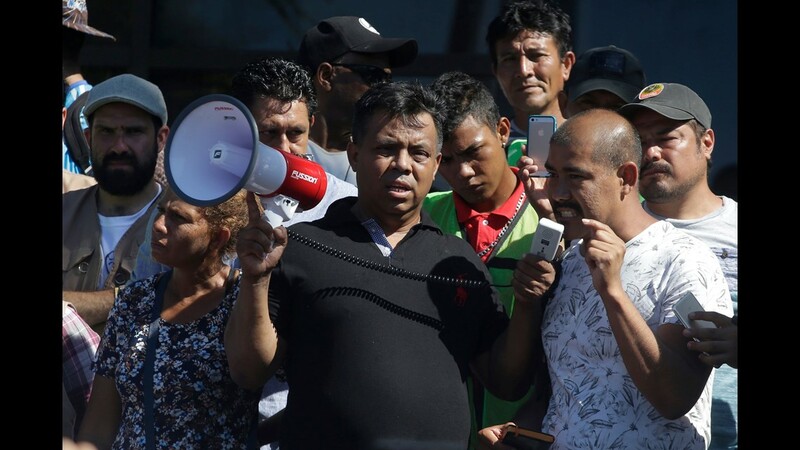 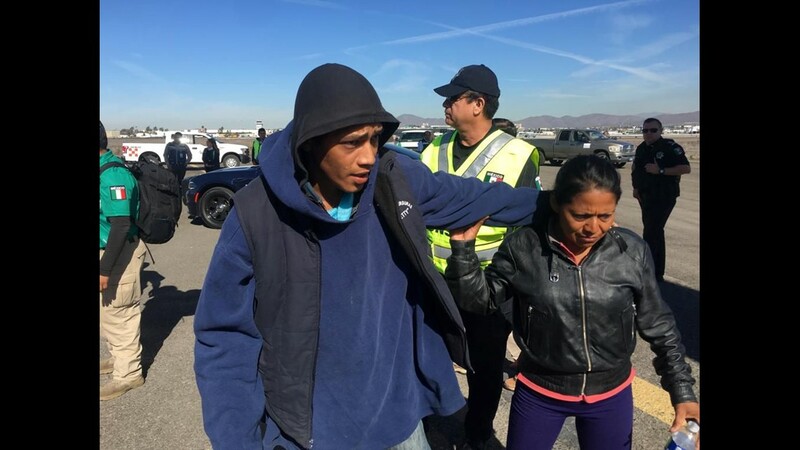 The chaos Sunday began when immigrants overwhelmed Mexican authorities and tried to rush through traffic lanes at the San Ysidro crossing, McAleenan said. 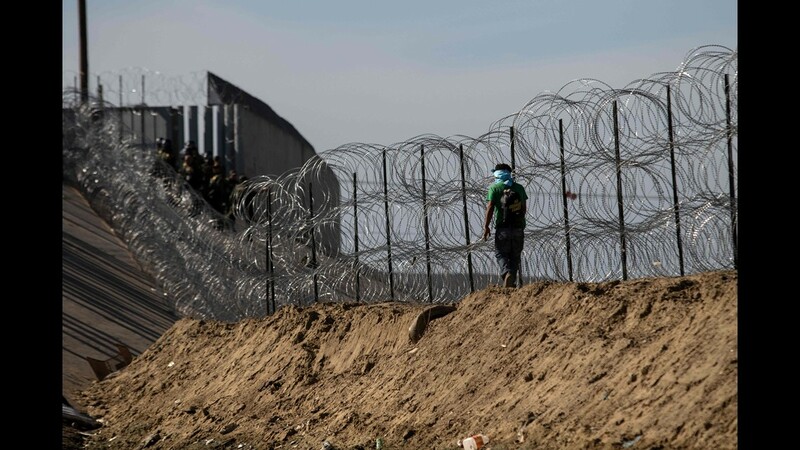 When blocked there, the immigrants moved east and tried to enter through holes in the fence, he said. 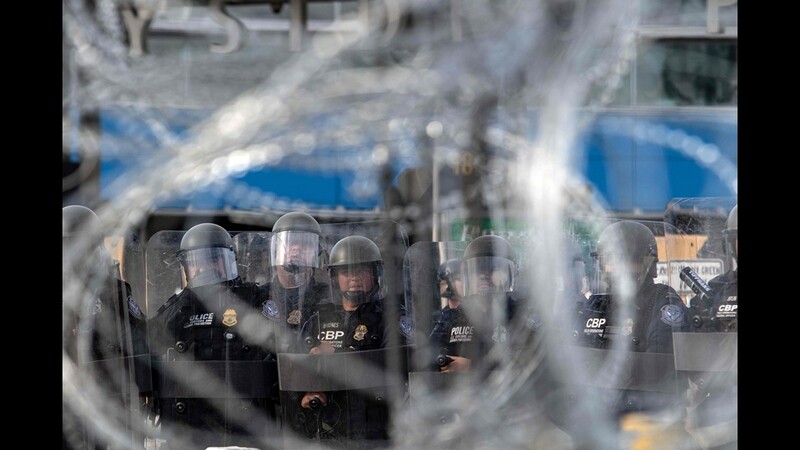 There were multiple assaults, and debris was thrown at CBP officers, McAleenan said. 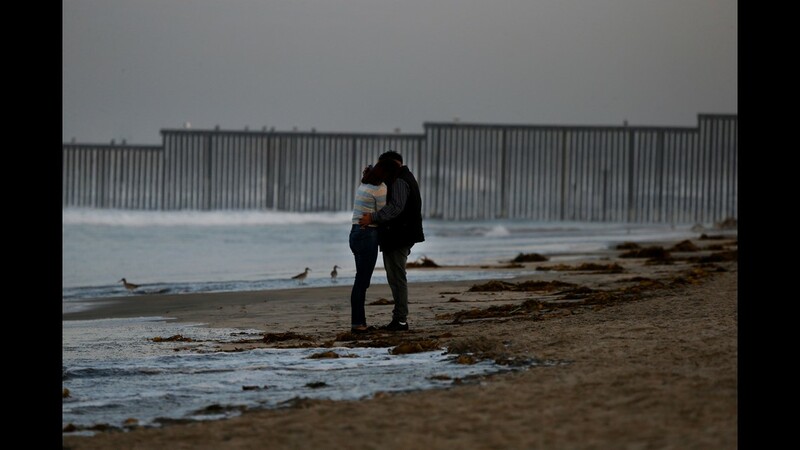 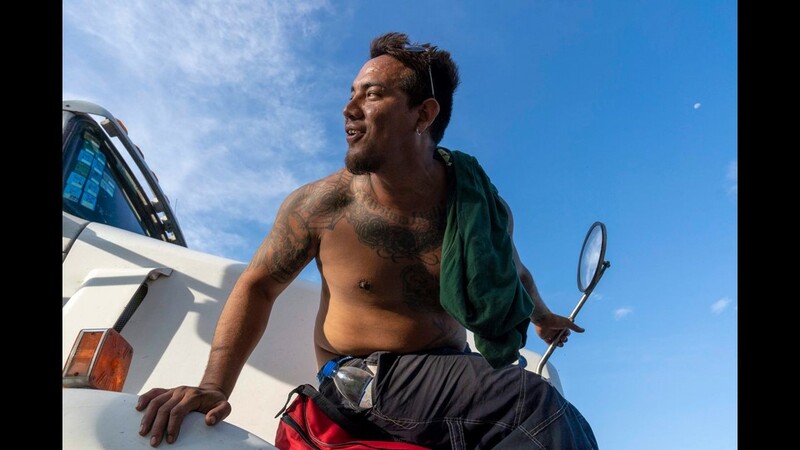 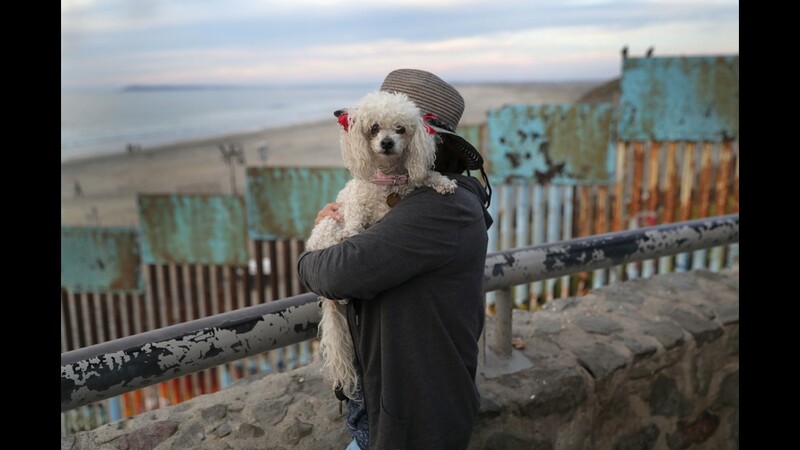 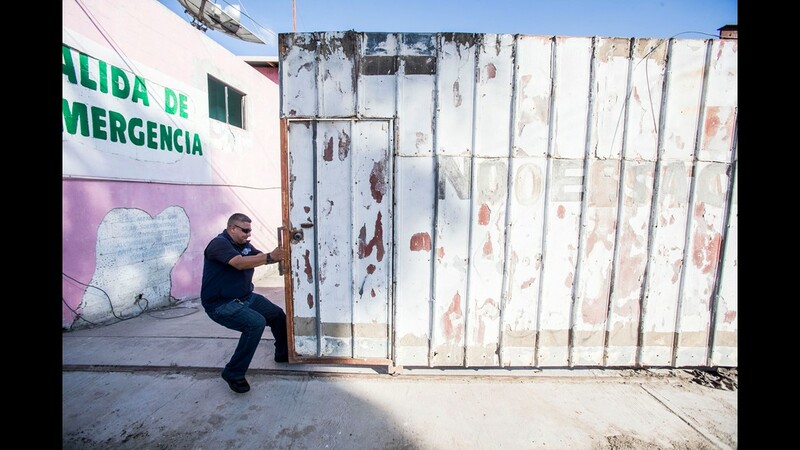 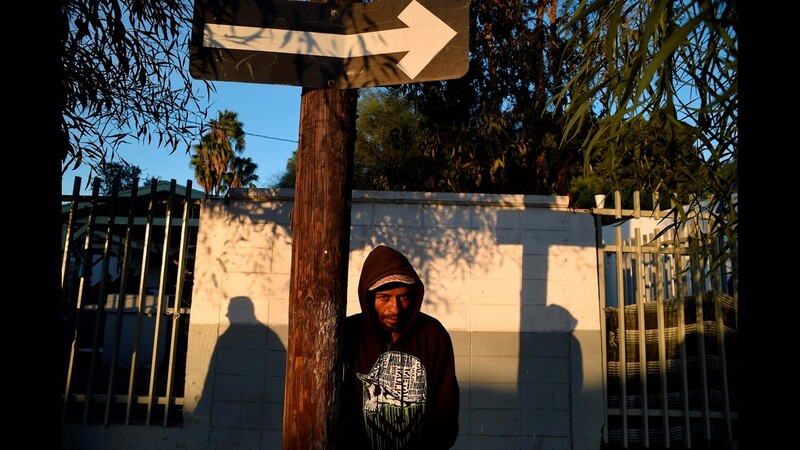 Then immigrants went west of the port to the Tijuana River channel, where there were more assaults and rock-throwing, he said. 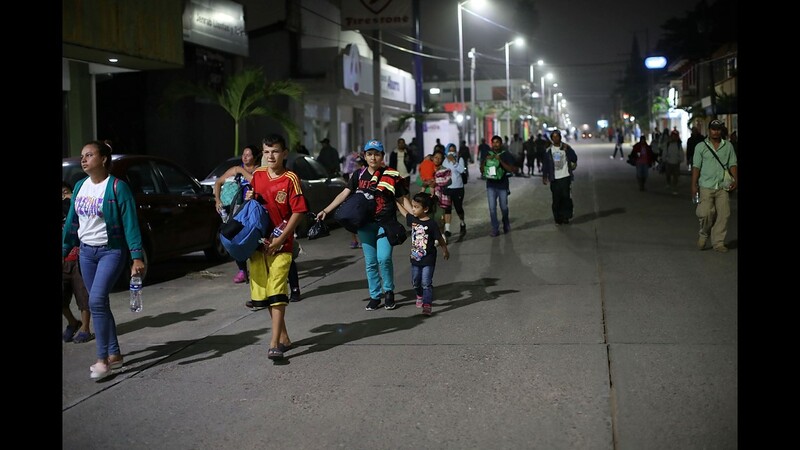 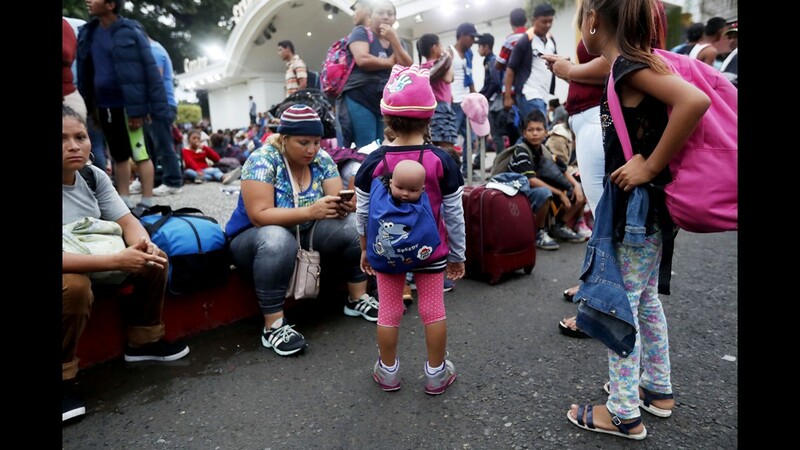 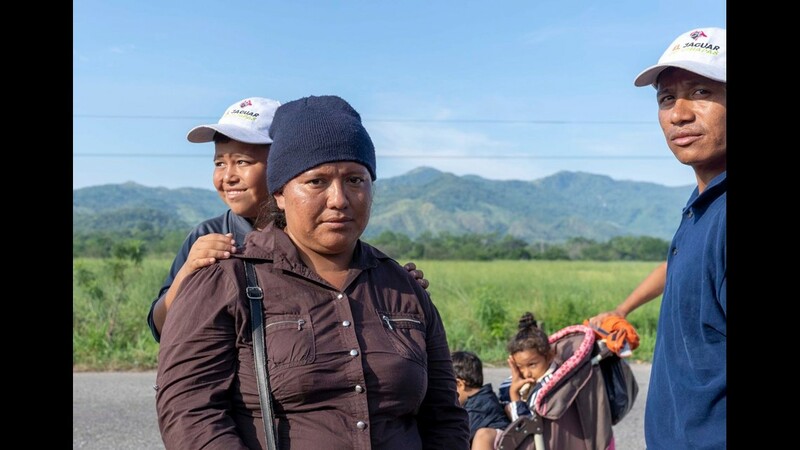 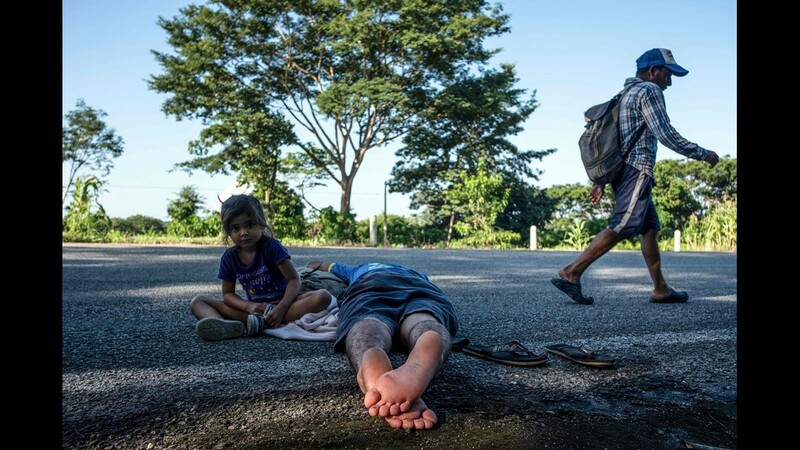 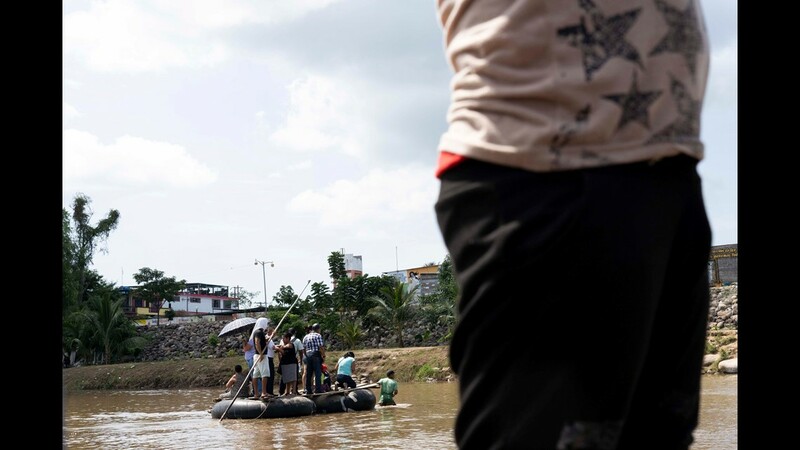 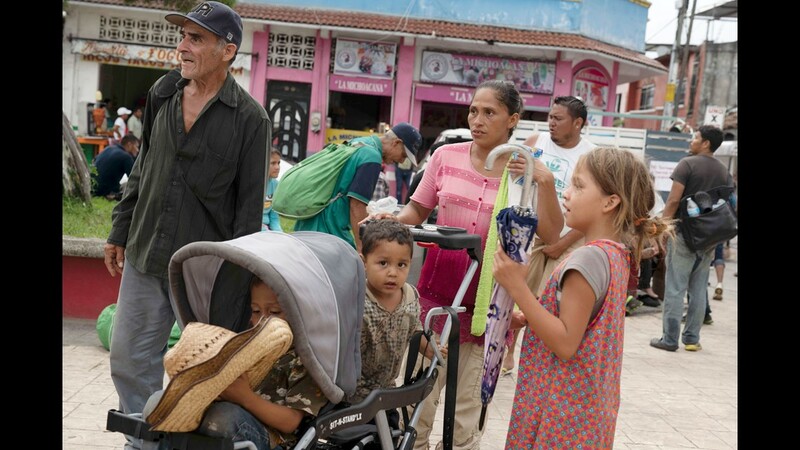 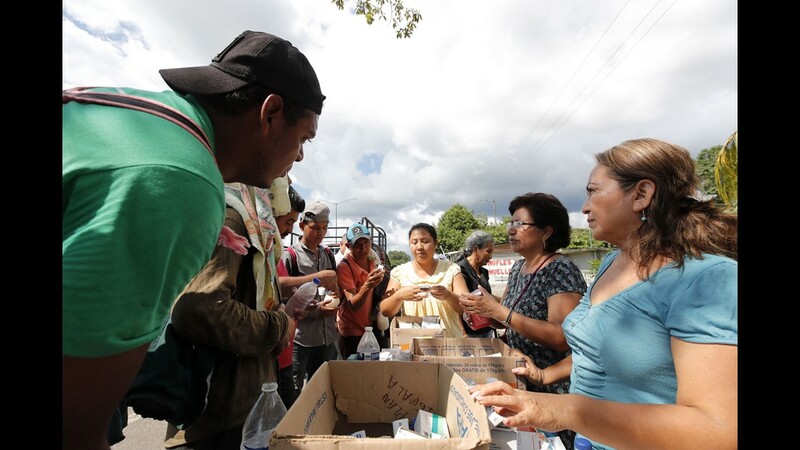 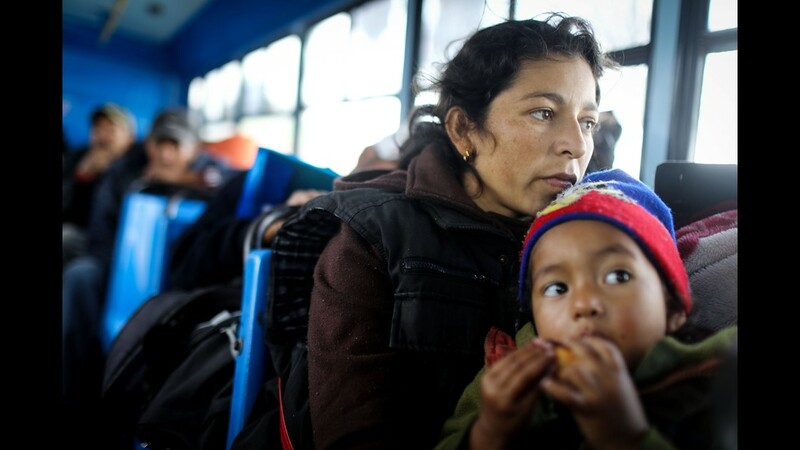 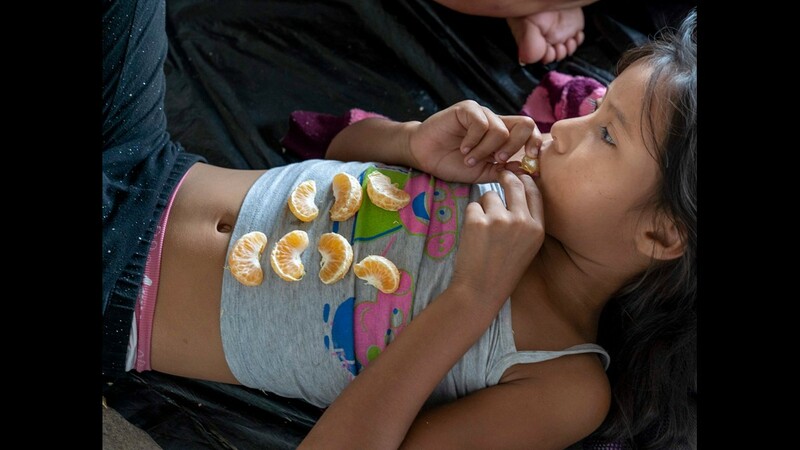 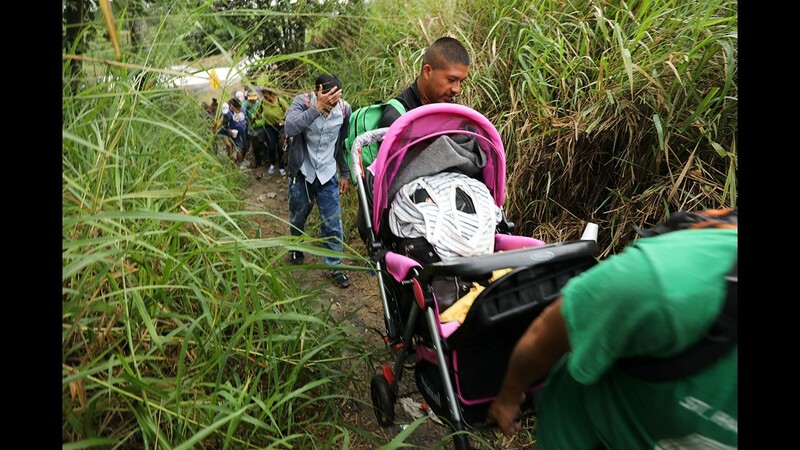 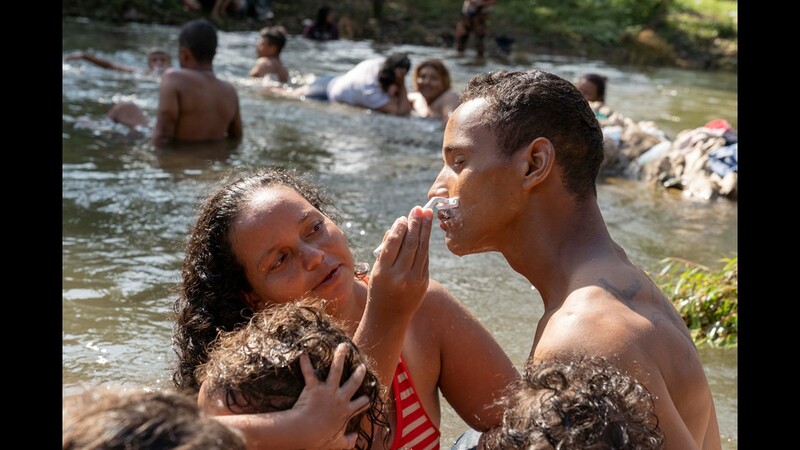 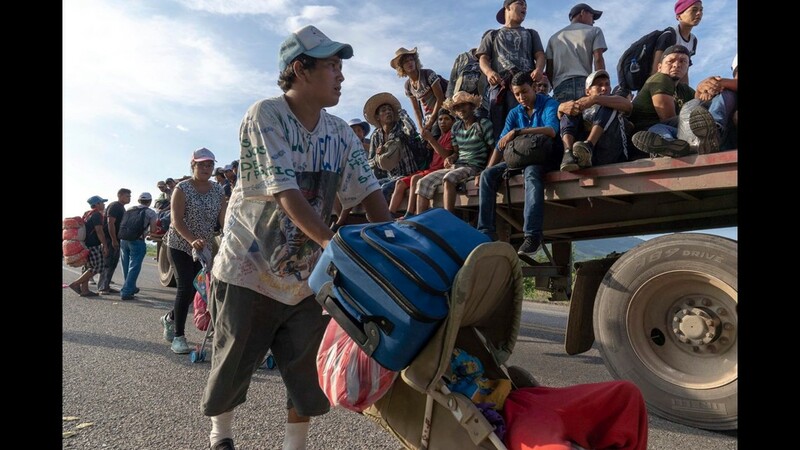 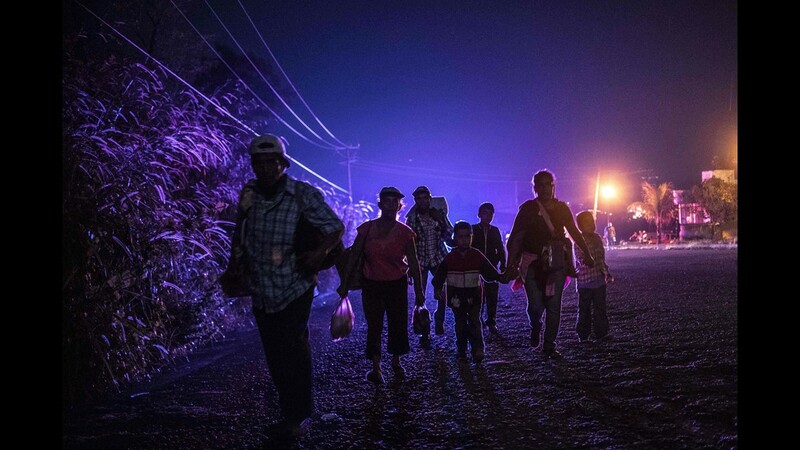 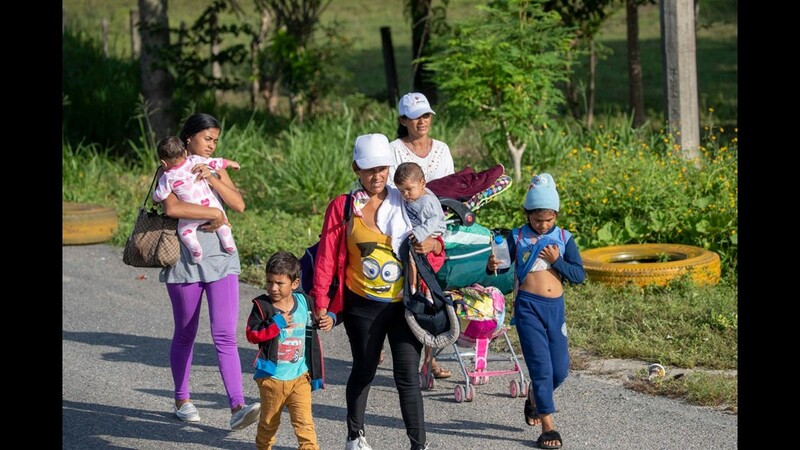 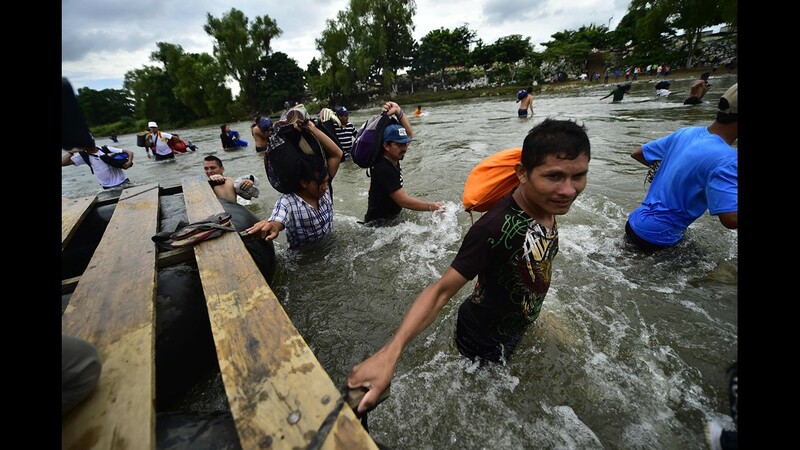 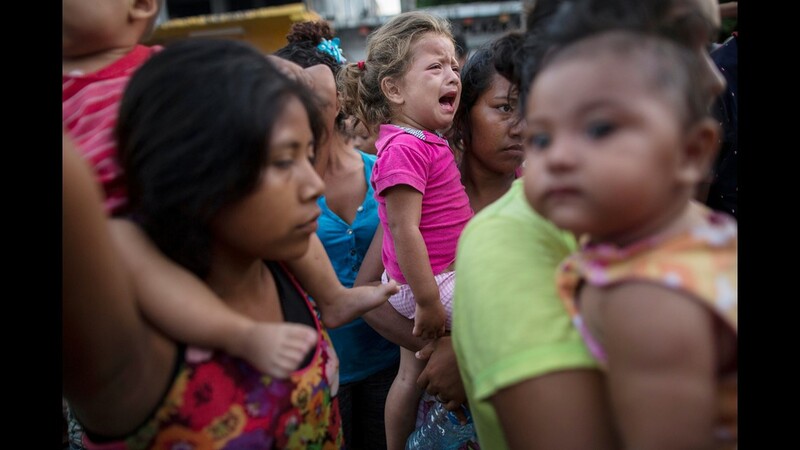 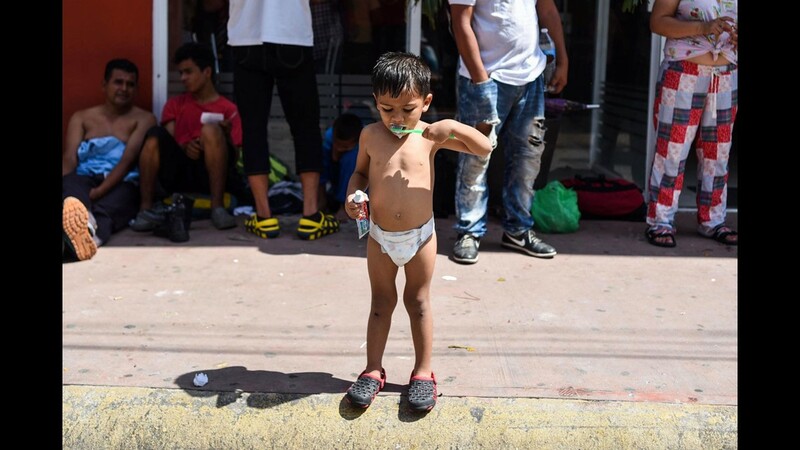 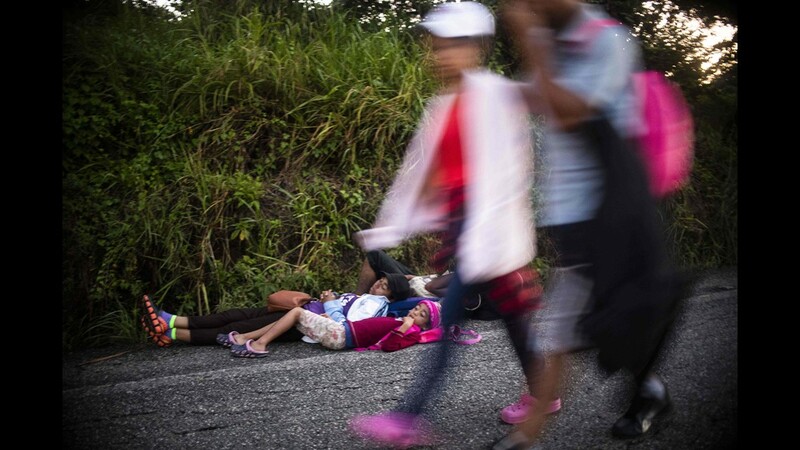 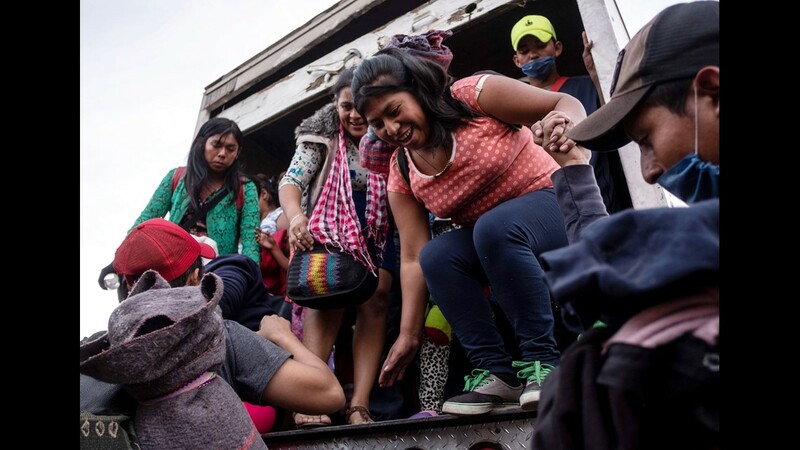 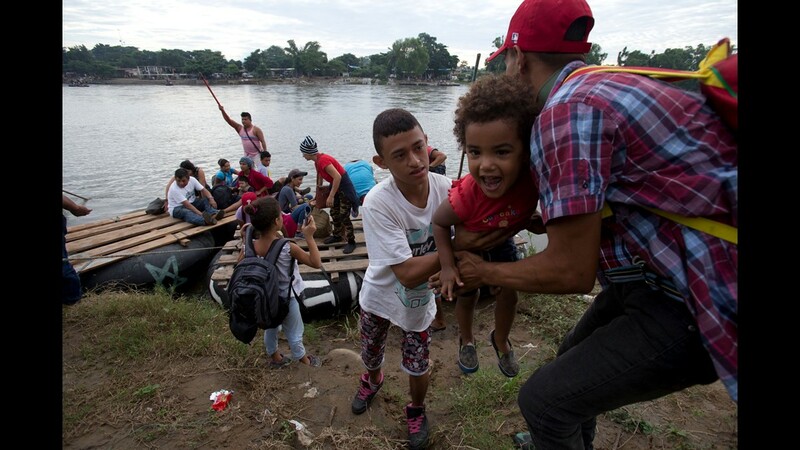 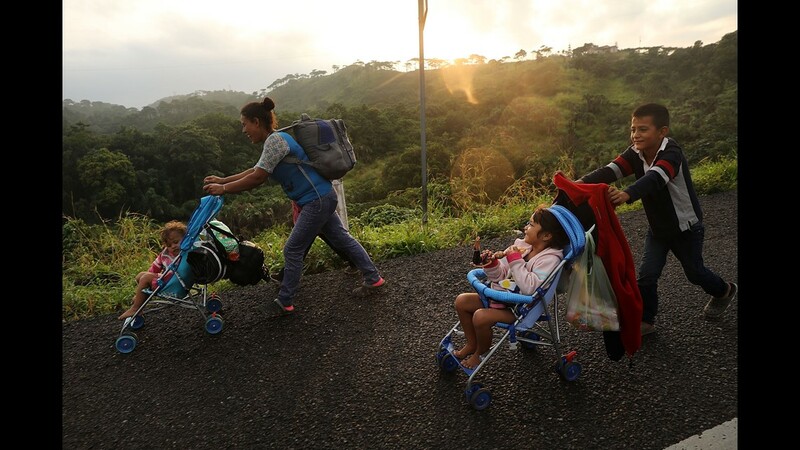 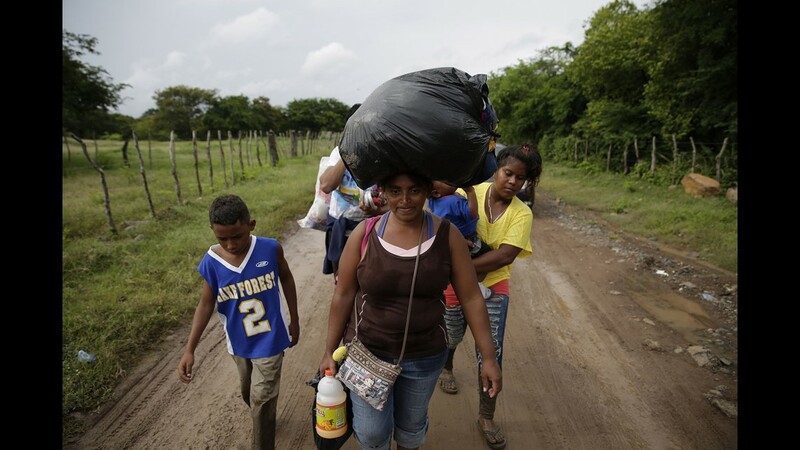 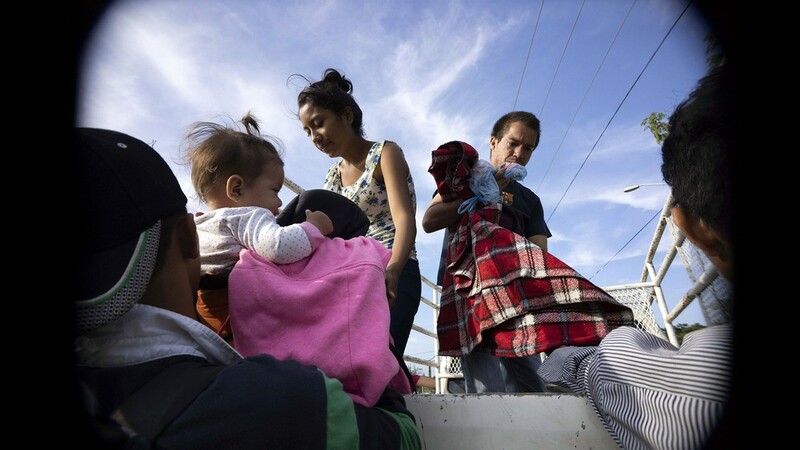 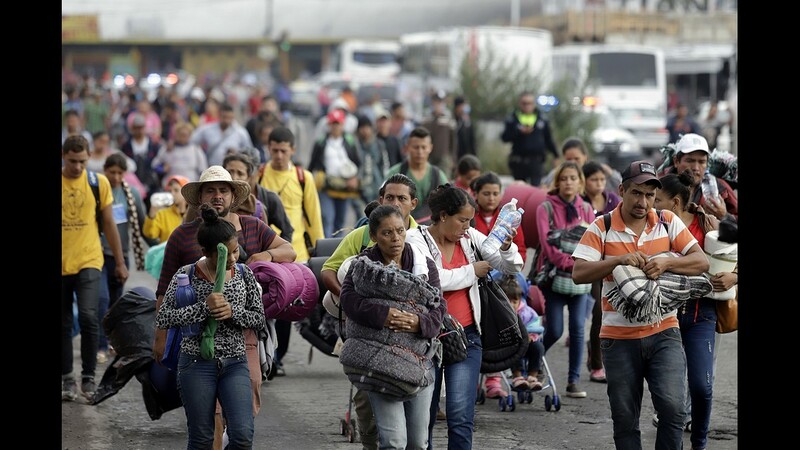 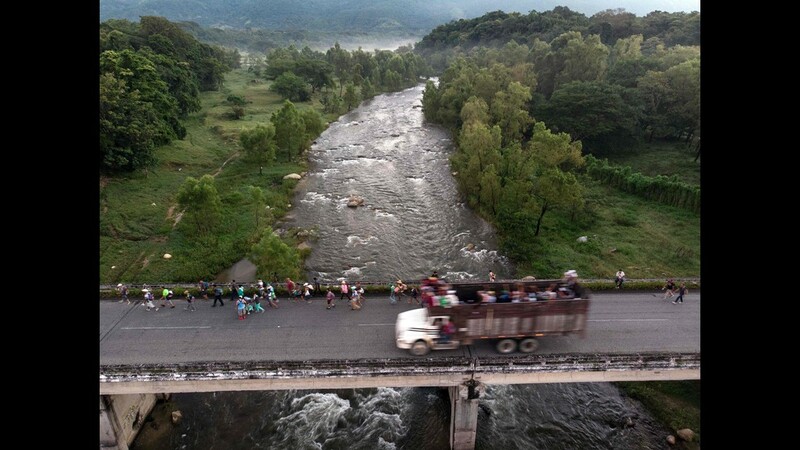 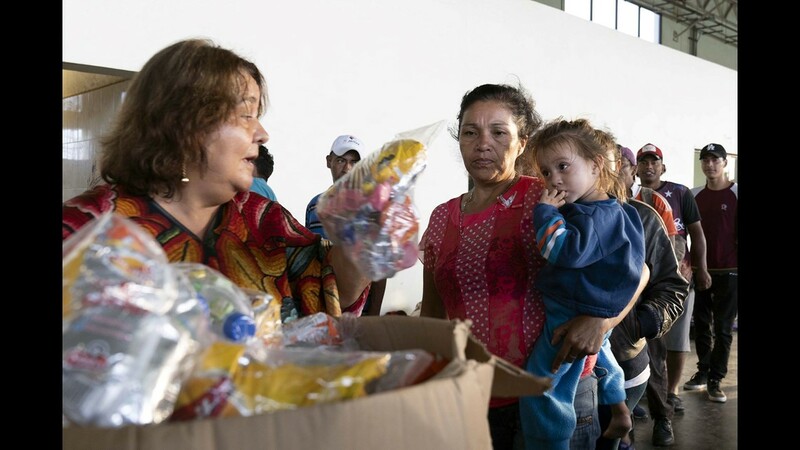 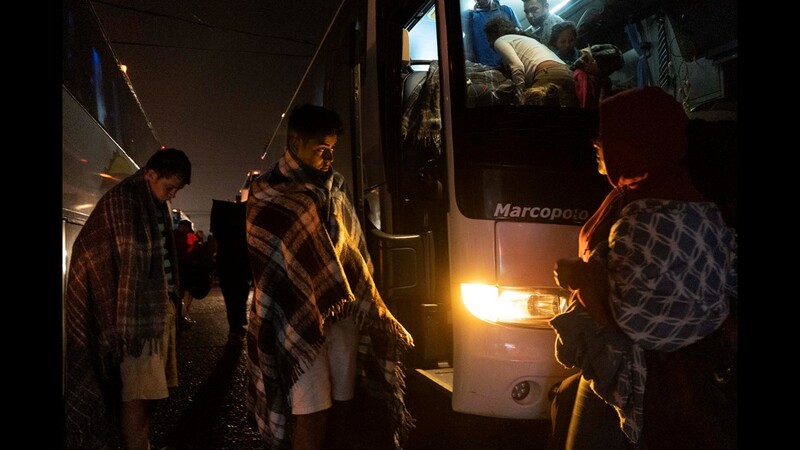 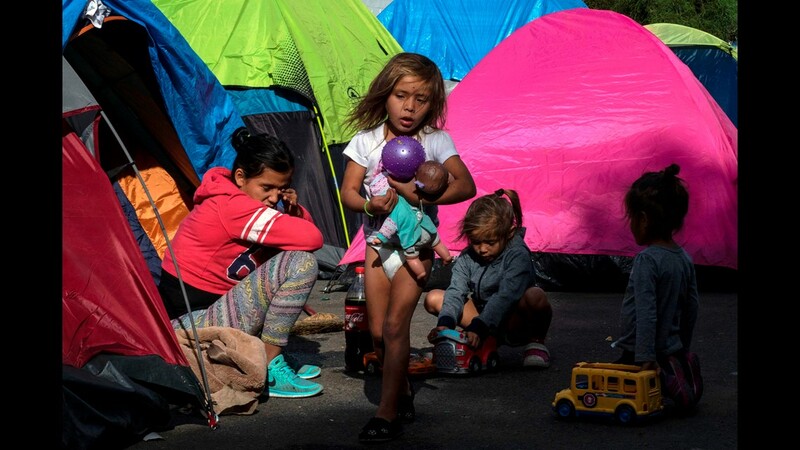 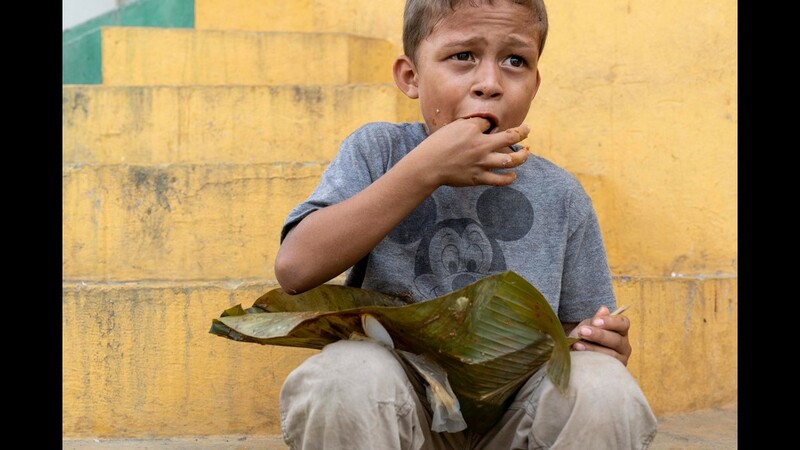 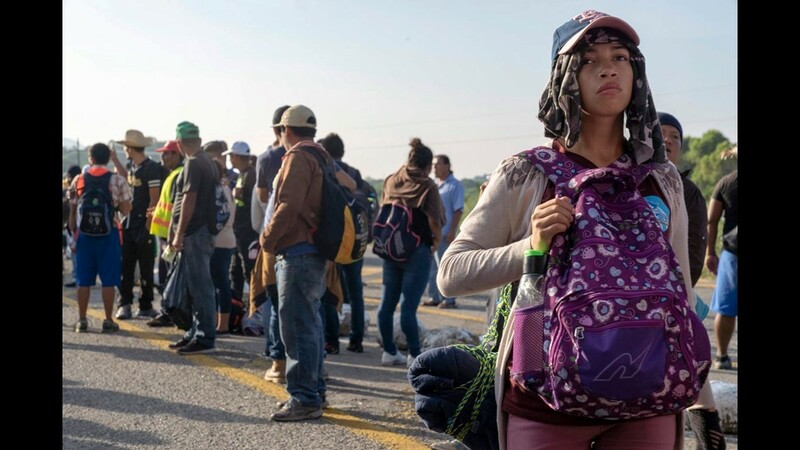 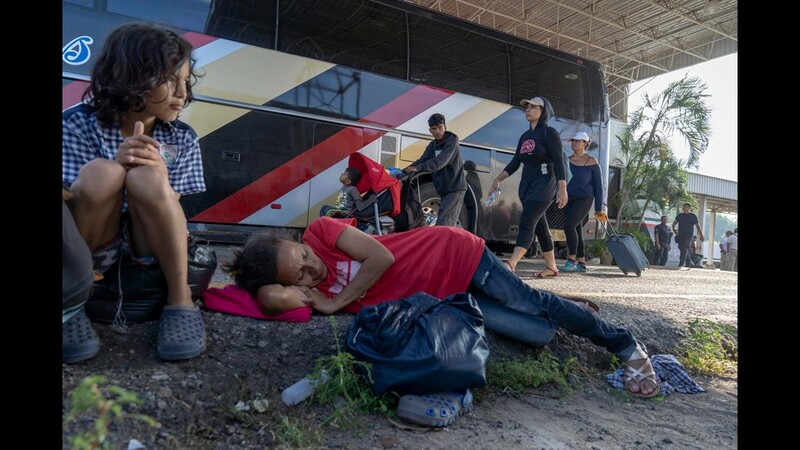 Though Trump has repeatedly told caravan members to return to their home countries, U.S. law states that foreigners are allowed to enter the USA and request asylum. 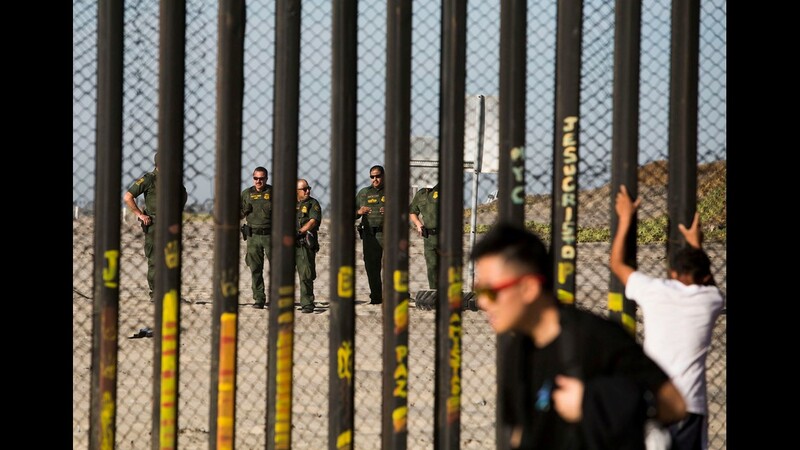 At least one federal judge ruled that the president can't just make that law go away. 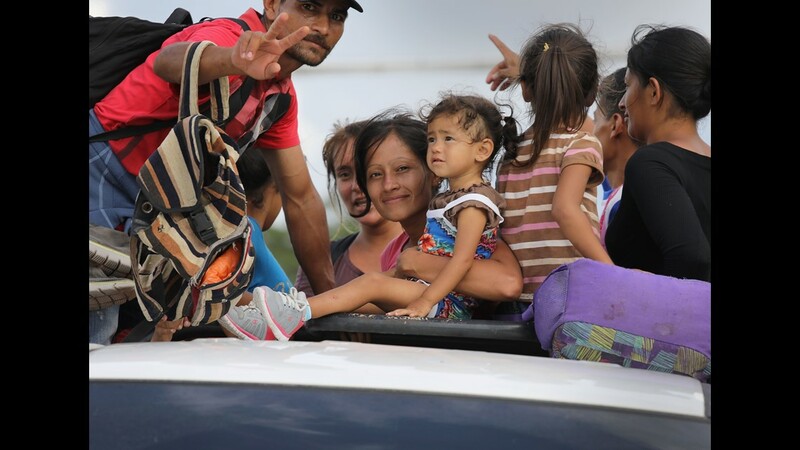 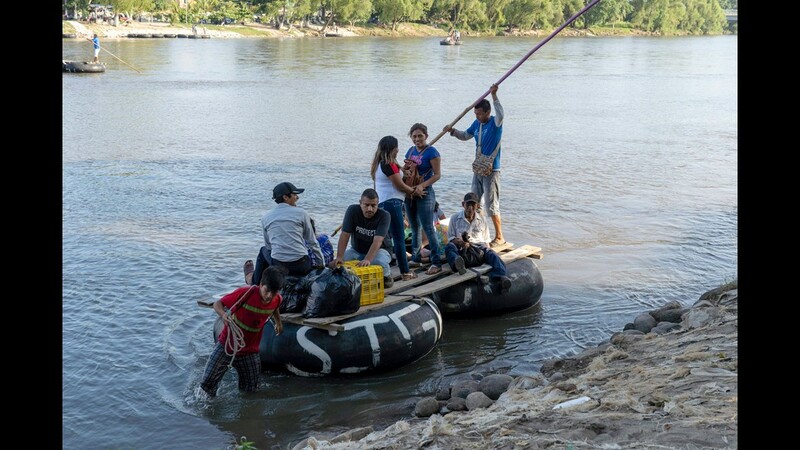 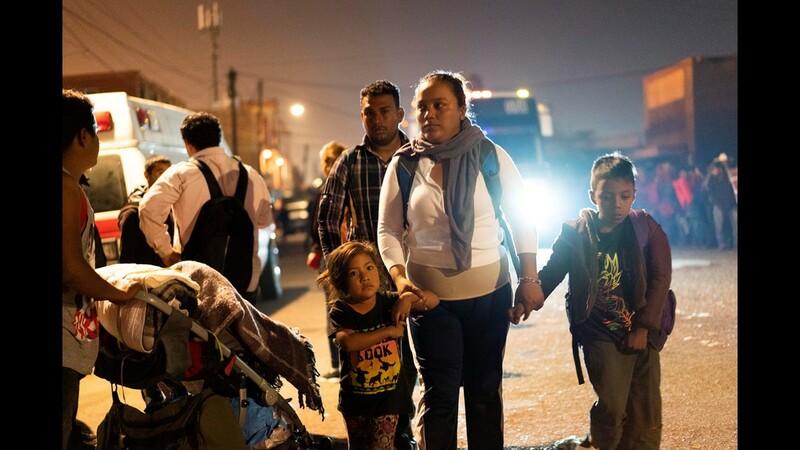 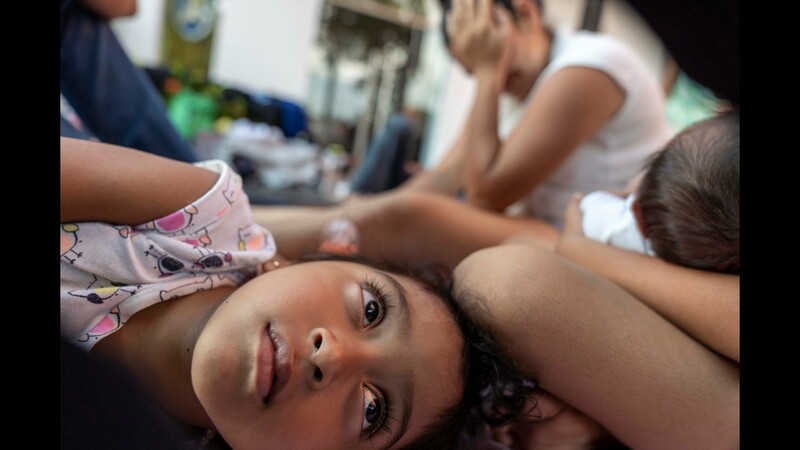 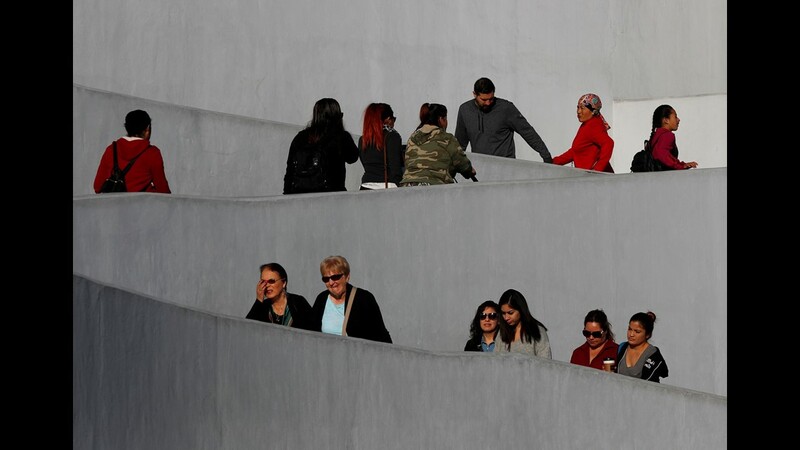 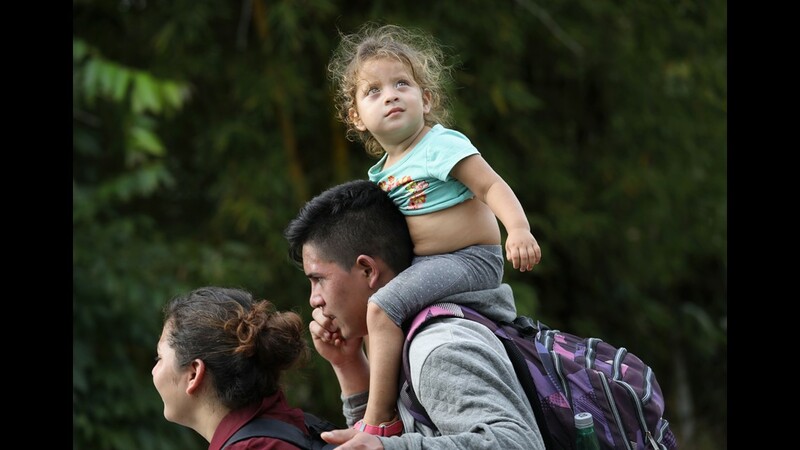 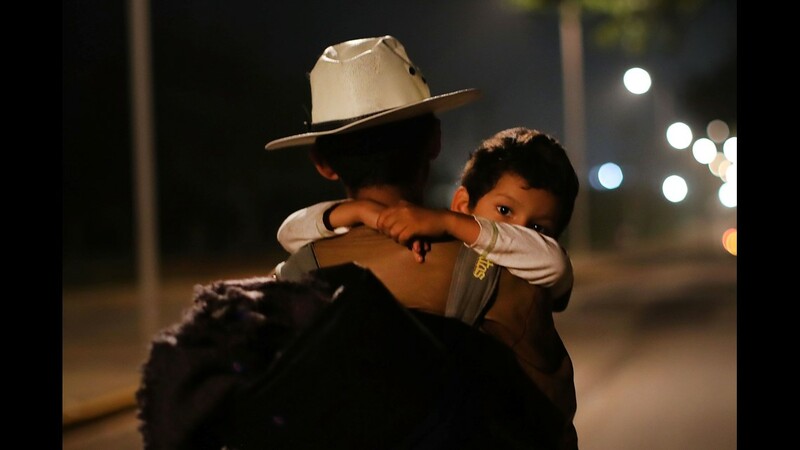 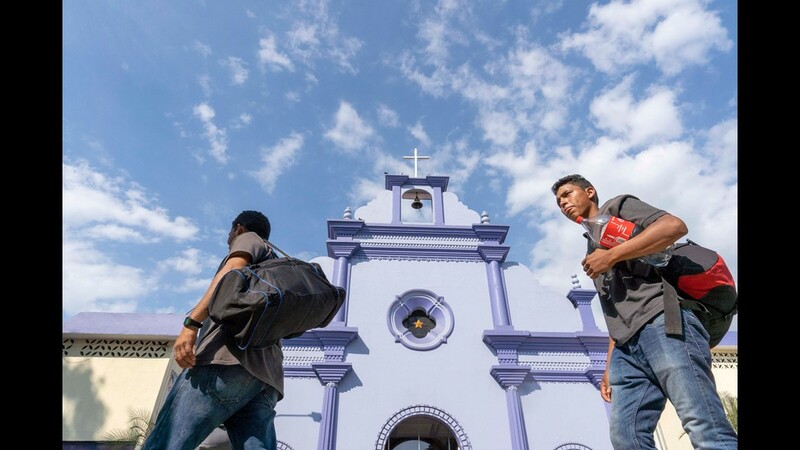 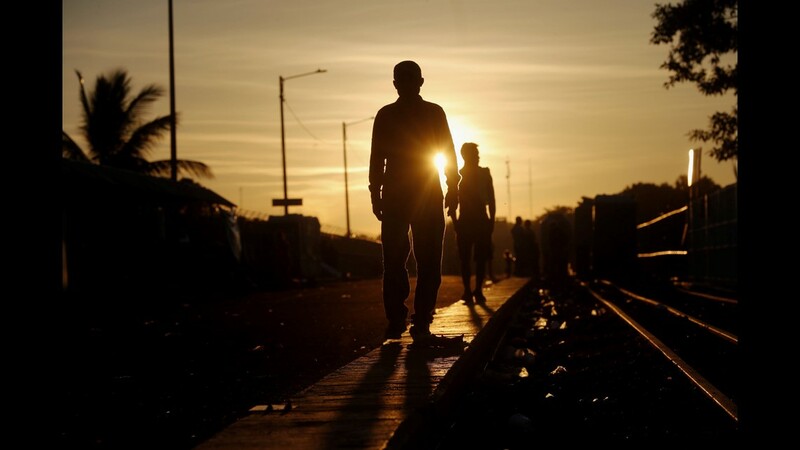 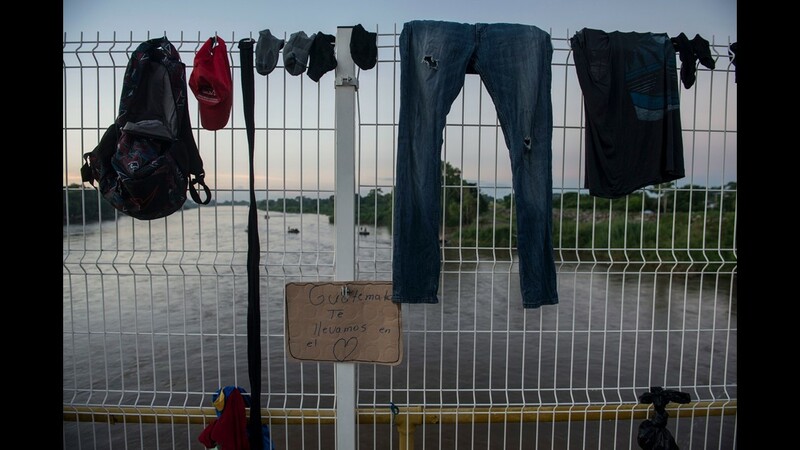 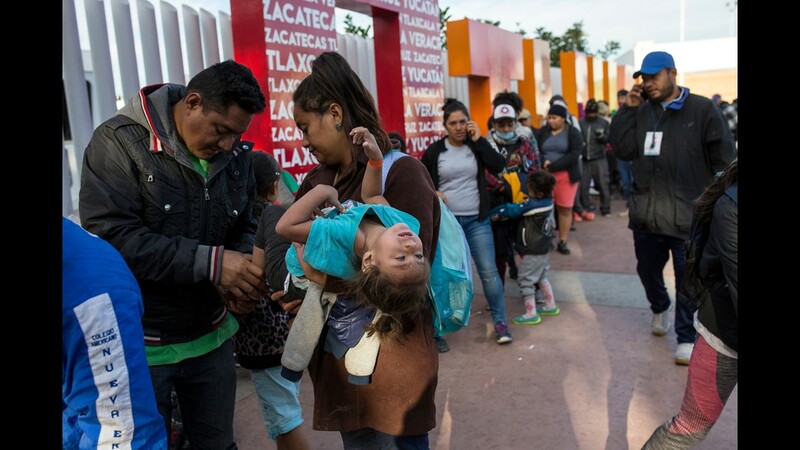 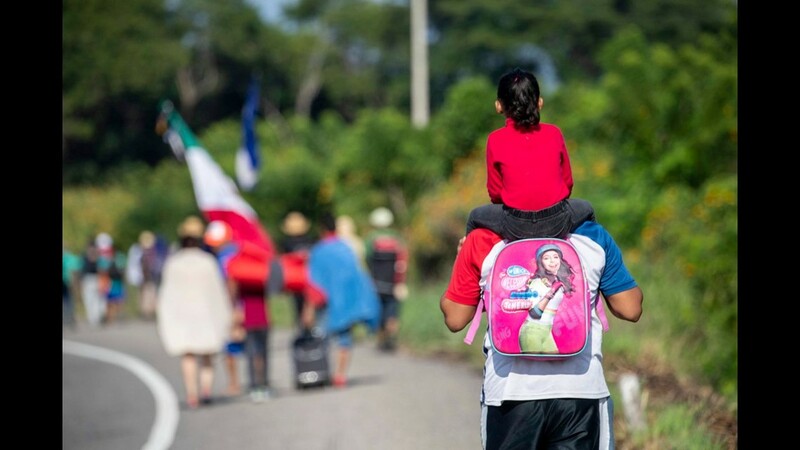 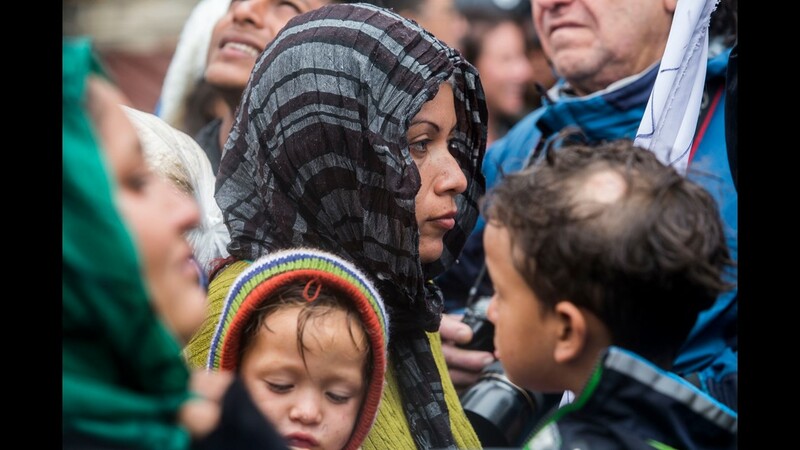 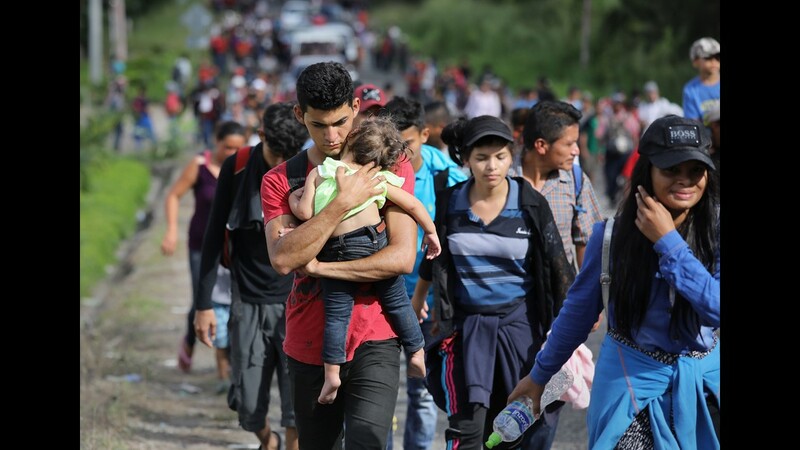 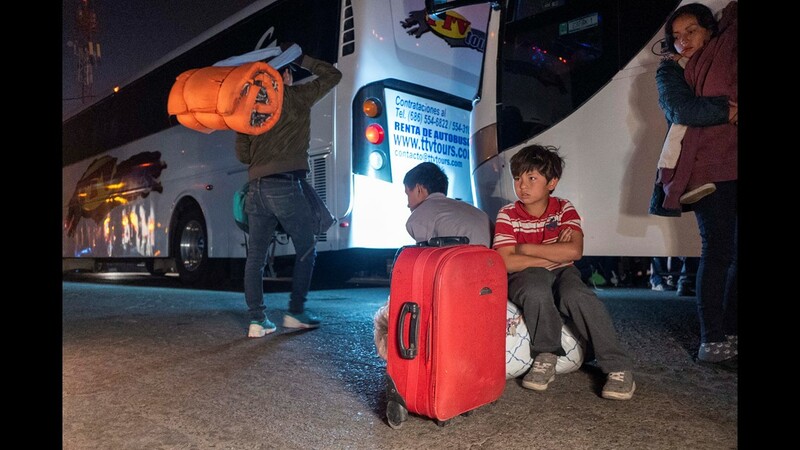 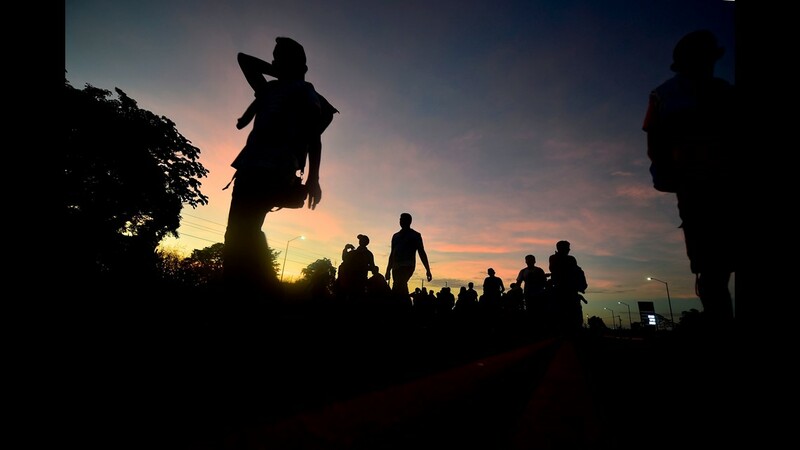 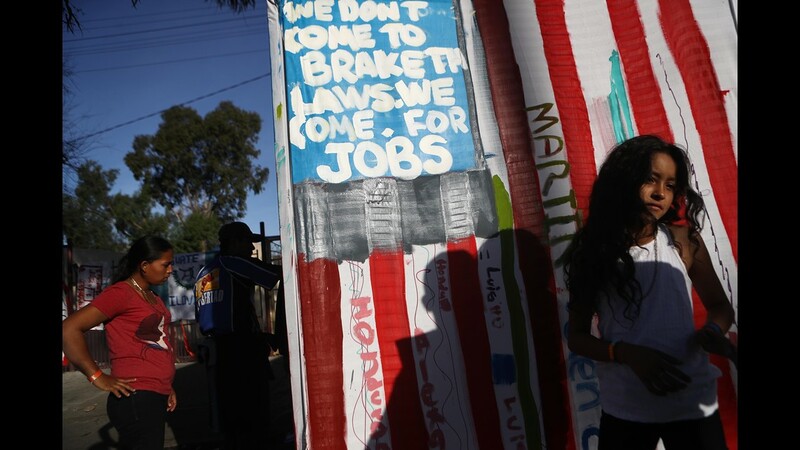 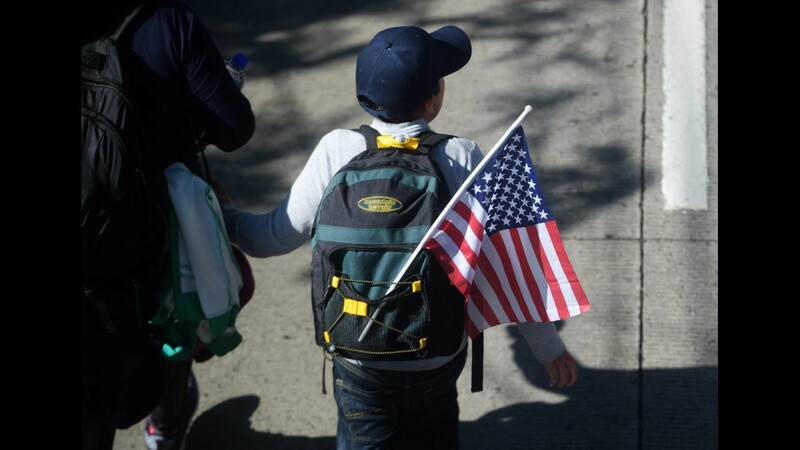 This month, U.S. District Judge Jon Tigar suspended the administration's new policy of cutting off asylum to immigrants who enter the country illegally. 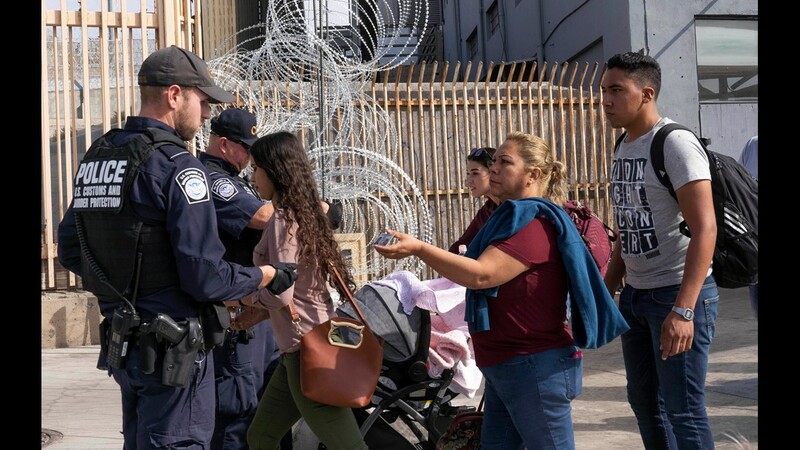 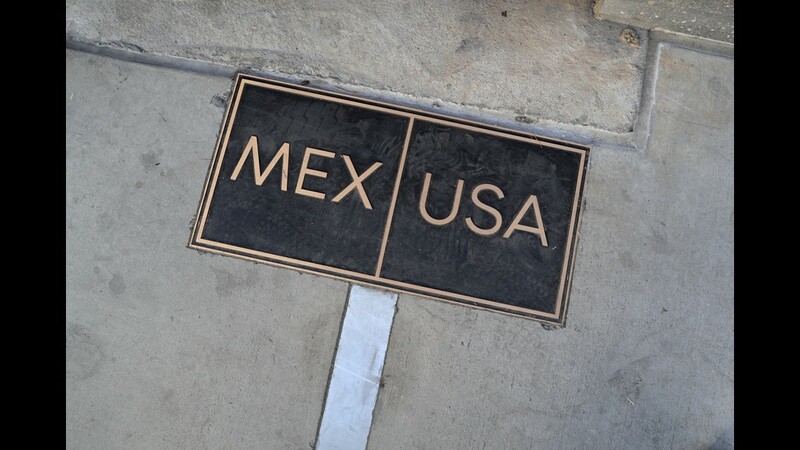 The 1965 Immigration and Nationality Act states that any foreigner who arrives in the USA, "whether or not at a designated port of arrival," may apply for asylum. 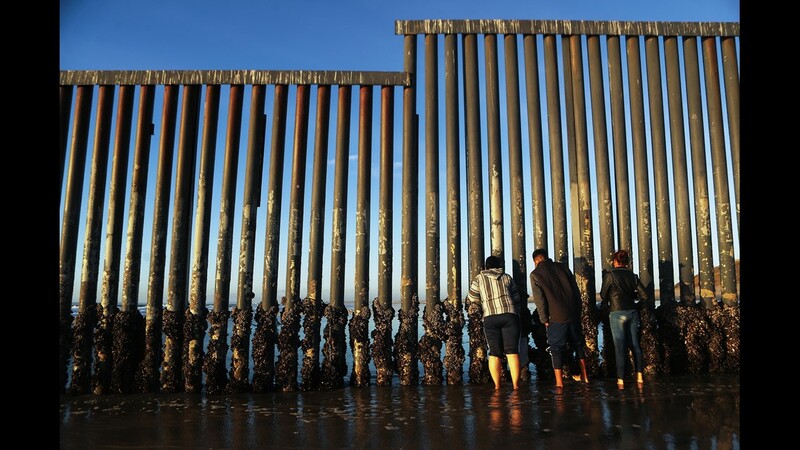 On Nov. 9, Trump tried to address that issue through a proclamation that would end the ability of immigrants to request asylum if they enter the country illegally.